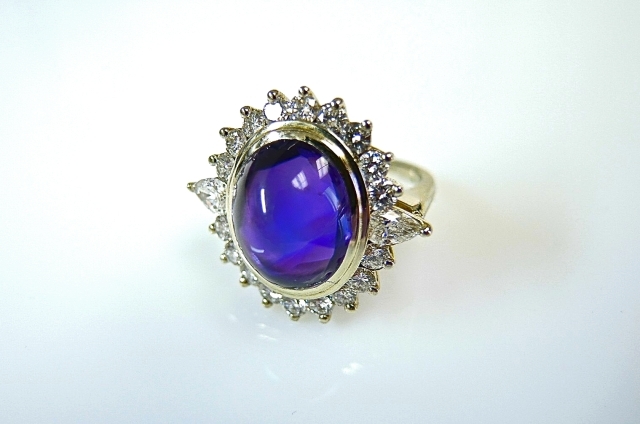 Our Vintage Inspired Amethyst and Diamond Ring was featured. A lovely 14 karat white gold mill grain and filigree ring featuring 1 checkerboard top cushion cut light intense purple amethyst and 22 round brilliant cut diamonds. These images were picked up by Joy Web on their wedding photography blog. As the holidays are fast approaching we’ve created a list of items to better help you prep your home! Our inventory constantly changes. 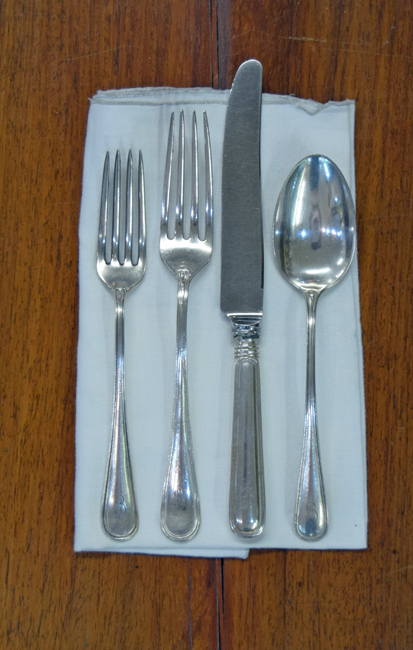 We have a large selection of discontinued antique and vintage sterling silver flatware patterns. Our Birks sterling Silver Flatware is roughly half of Birks last retail price list. 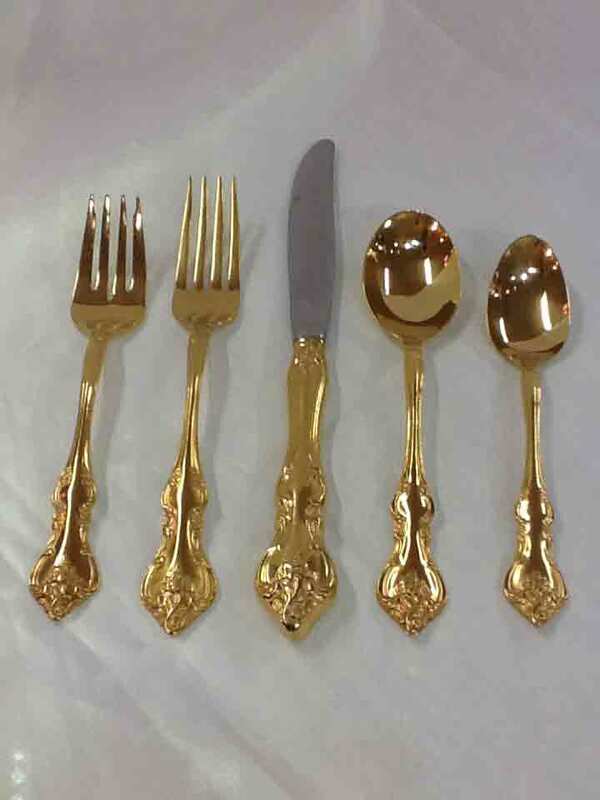 In addition we also carry Heirloom, Gotham, Internation, Northumbria, Roden and Wallace sterling silver flatware patterns. 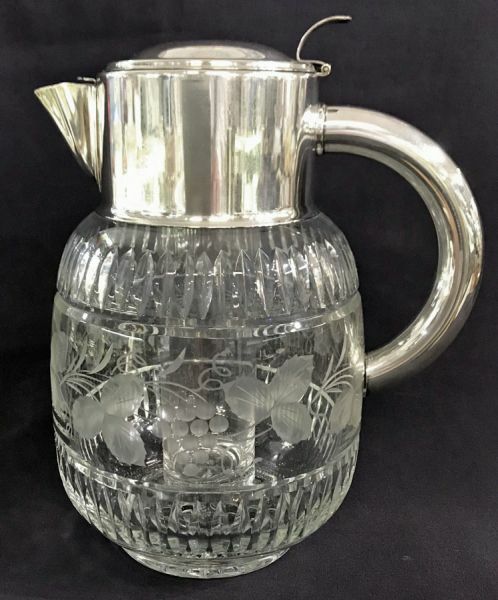 We carry vintage and antique coasters, ice buckets, and liqueur tags. 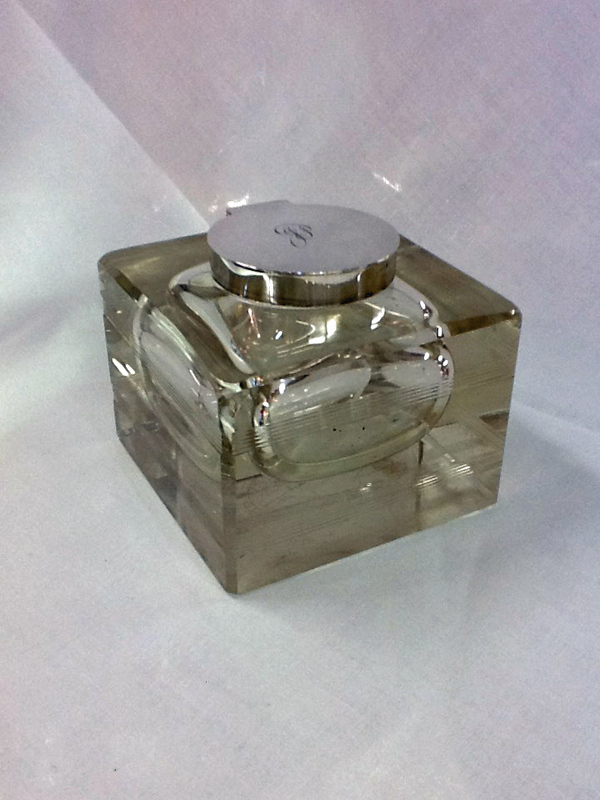 This beautiful antique sterling silver bottle coaster by Gorham c. 1880 is 4 inches in diameter. 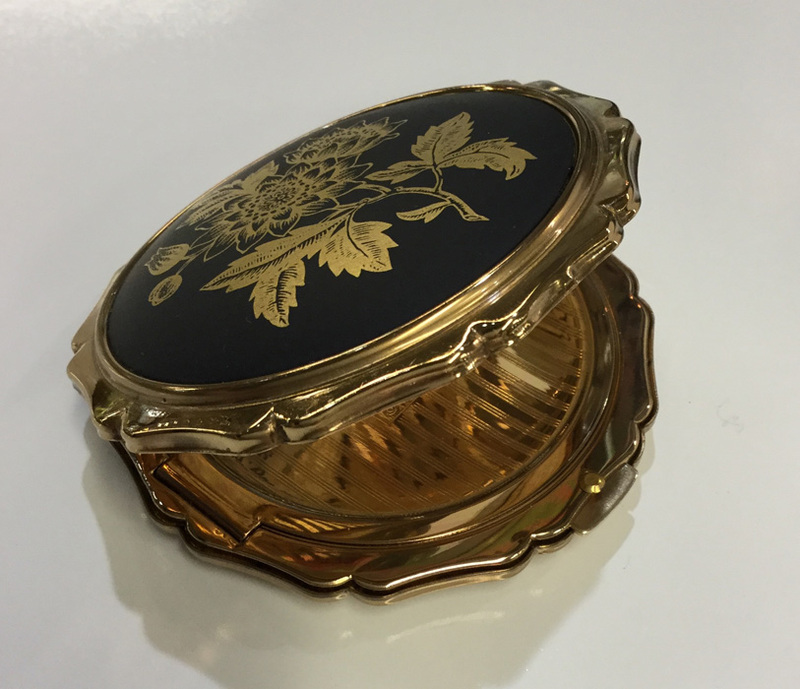 This Vintage Birks Regency Plate Champagne Cooler has a special past, it was used in the movie Crimson Peak as a prop. What are celebrations without champagne? 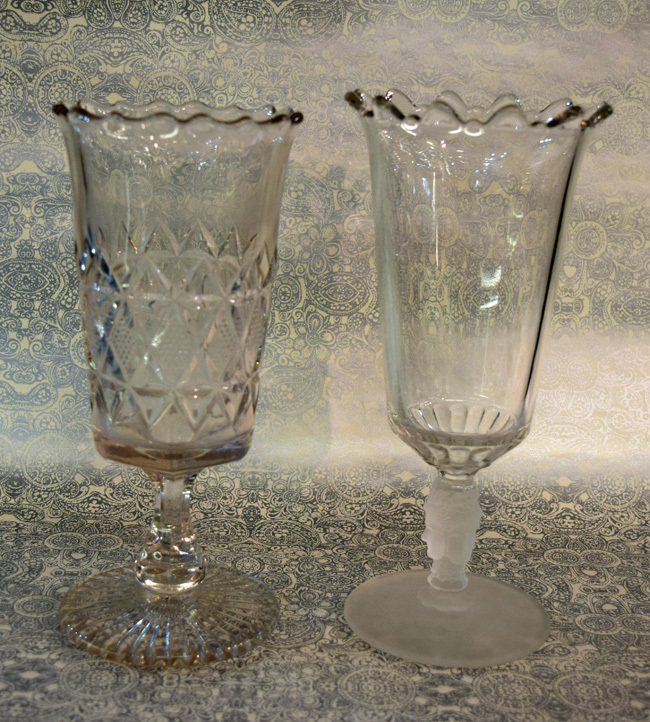 We have a grand collection of antique and vintage crystal stemware. 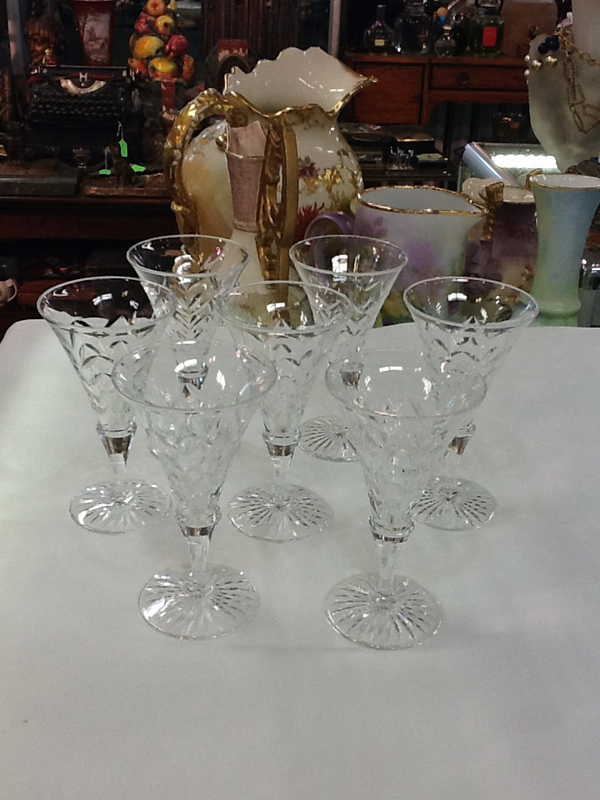 This vintage Waterford “Sheila” champagne coupes come in a set of 12. 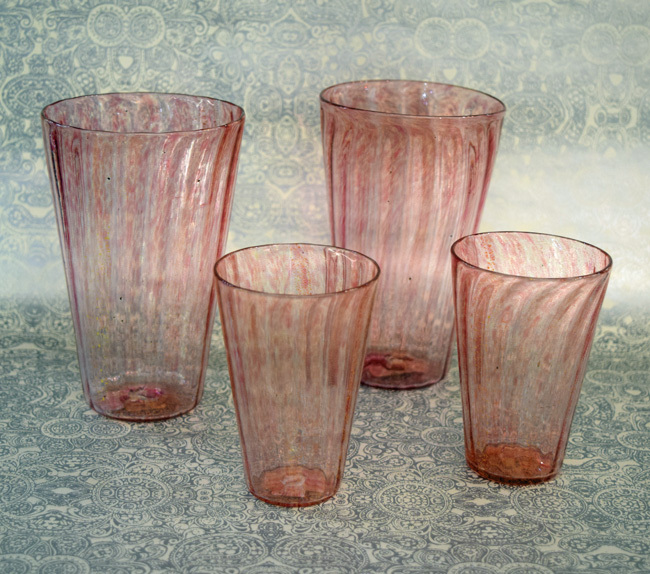 They are 4 ¾” high, 4” diameter. They were featured on the Marilyn Denis show on March 23, 2017 by interior designer Tommy Smythe. For more information on products or more inspiration for Holiday preparation, visit us at 284 King Street West in Toronto. We look forward to seeing you, and best wishes this holiday season. What better way to greet trick or treaters than dressed up in beautifully creepy jewels? Here are some spooky and unique, vintage and antique jewels from our collection. 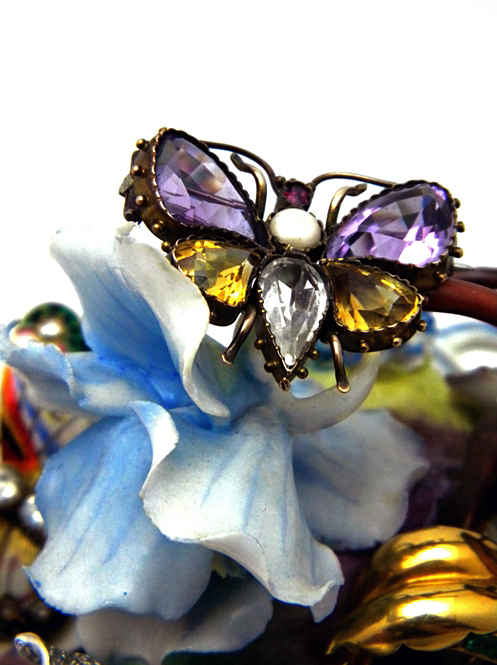 This creepy crawly is bedazzled with one 1.62 carat amethyst and one 0.11 carat blue sapphire in a 14 karat yellow gold spider setting. 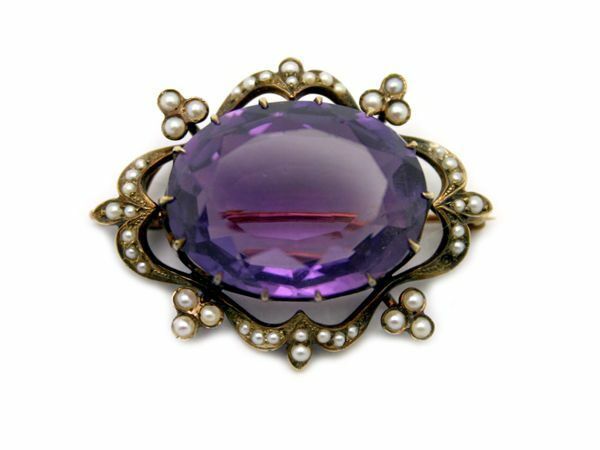 A unique vintage brooch for your collection. Luxurious black diamond spiders for your ears. This pair of 18 karat white gold earrings have four brilliant cut diamonds and 152 round brilliant cut black diamond! Slimy salamanders are perfect for Halloween. 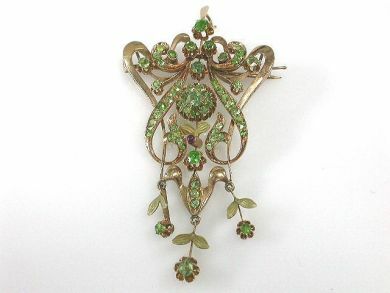 This Victorian style emerald brooch is of the late 1890s and houses one-hundred and nine mixed cut and polished emeralds combining to 8 ct. Two round brilliant cut and polished diamonds are in place as eyes of the salamander (SI, H-I 0.81 ct.). Startling yet stunning sterling silver bat holding a red 6 star ruby cabochon will hang on your neck by a 18 karat, 23 inch yellow gold chain. 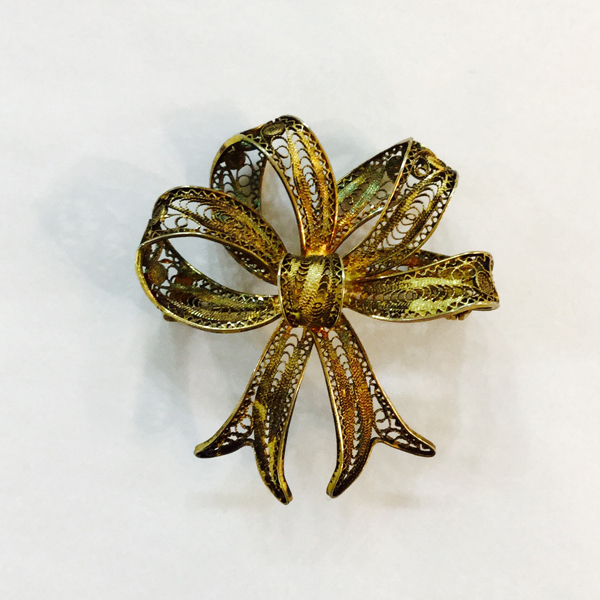 Scream with delight at this emerald and diamond 18 karat yellow gold bat brooch. 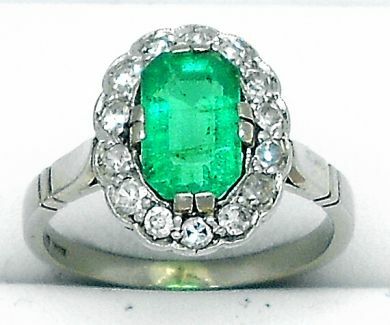 Two emeralds (0.03 carats), 139 round brilliant cut diamonds (1.48 carats: SI clarity: H-I colour). More spooky and fantastic vintage and antique items can be found in store, visit us at 284 King Street West this week for the best Halloween Creepy Crawlies to add to your wardrobe! Every year we have the distinct pleasure of contributing to a fabulous charity event, The Great Jewellery Heist. Heist is an annual luncheon and auction of gorgeous donated jewellery that aims to raise funds for Bridgepoint. Last year over $200,000 was raised. On October 27th, Bridgepoint will be hosting the 7th annual Great Jewellery Heist. 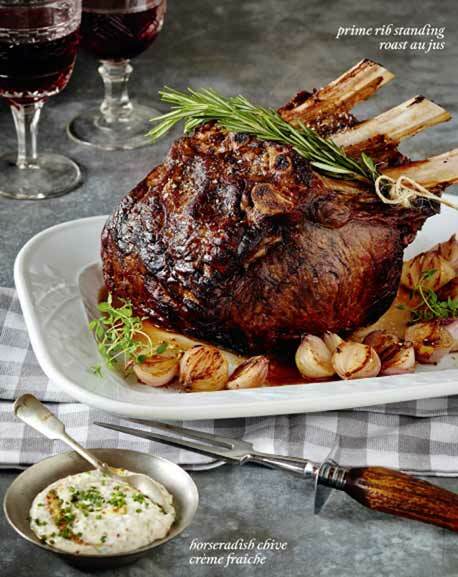 The luncheon is organized by Kalandra Roach Events and the lunch will be prepared by the Ritz-Carlton Executive Chef. This year we donated an important pair of French blue enamel to resemble lapis, and diamond earrings with an 18kt gold hallmarked organic fringe setting. 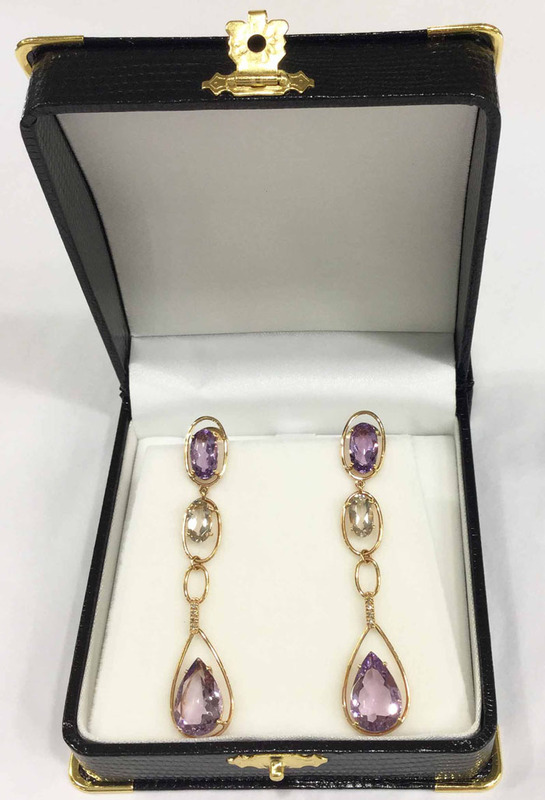 Check out our earrings page for more delicious earrings, like this pair of beautiful diamond and lapis studsin 14 karat yellow gold. The two lapis lazulis are 7.93 carats, with twenty-six round brilliant cut diamonds at 0.45 carats: VS -SI clarity: H-I colour. Find Out How To Identify A Beautiful Georgian Sterling Silver Piece From Their Hallmarks. 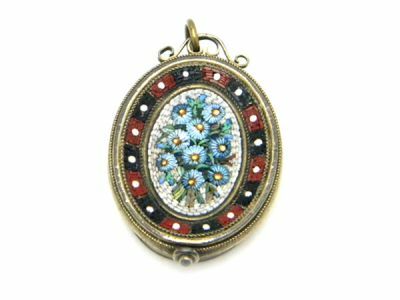 It is easy to identify a beautiful Georgian piece, we discussed Georgian jewellery and how to take care of it in a previous blog. 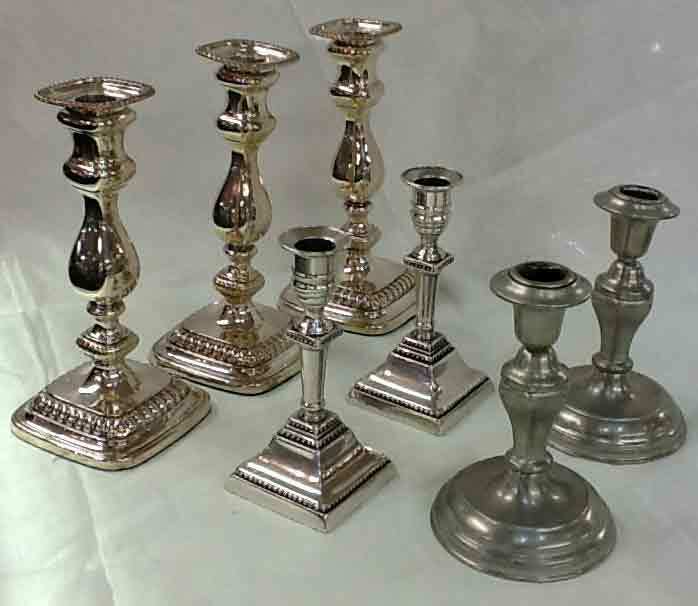 Georgian silver pieces are often hallmarked, this was a constant practice by all silversmiths and manufacturers to assure the quality of the fabrication, guaranteeing that the sterling grade was 92.5% silver. 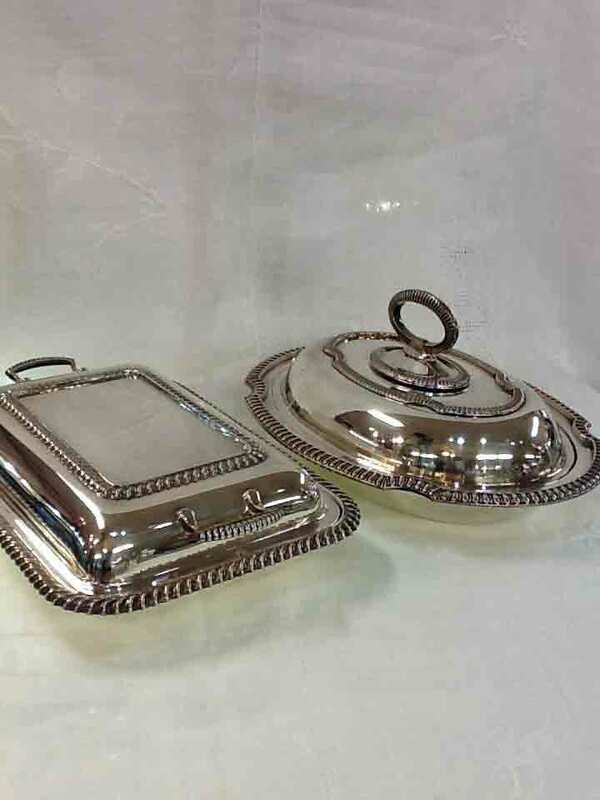 Sterling silver is a popular gift item for any occasion, check out our collection of sterling silver items, sterling silver flatware, and sterling silver flatware online. A date mark depicts the year a piece was tested. A letter of the alphabet is used, this letter is assigned to a year – acute attention should be paid as letters were used in both lowercase and capital form as well as in different shapes of punches, fonts and backgrounds. 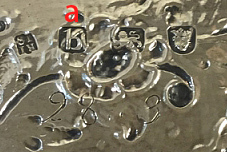 (a) in the zoomed photo of the Sterling Silver Salver shows the datemark. The silversmith has a mark that was derived from the creator’s initials, this is the maker’s mark. The duty mark is related to tax, George the third applied a silver tax in 1784 during the time of the American War of Independence. 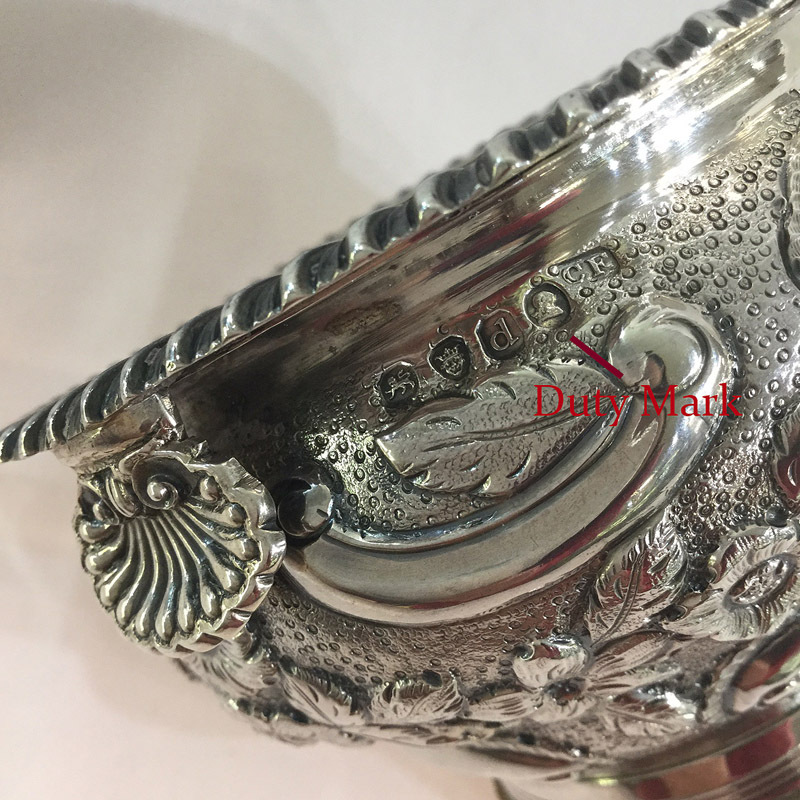 A duty mark can be found on pieces from 1784-1890. The duty mark displays the mark of the ruling sovereign and insured the buyer that there was tax paid on the piece. 6 1/2" long by 4 1/8" diameter at the base. The town mark sometimes referred to as the assay office shows the location where the silver was tested for its quality. 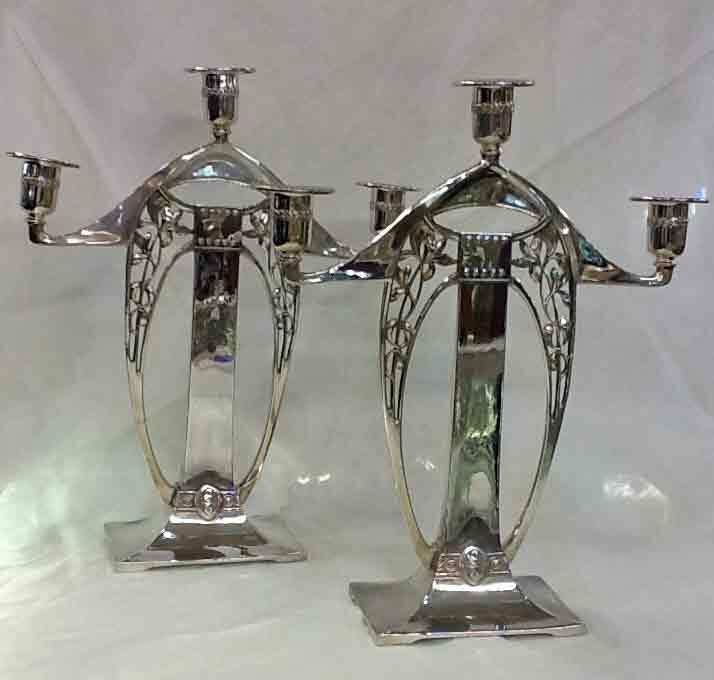 In the Georgian era silver was assayed at London, Birmingham, Chester, Dublin, Edinburgh, Exeter, Glasgow, New Castle, Sheffield, Tory. Today offices are still operating from London, Birmingham, Dublin, Edinburgh, and Sheffield. 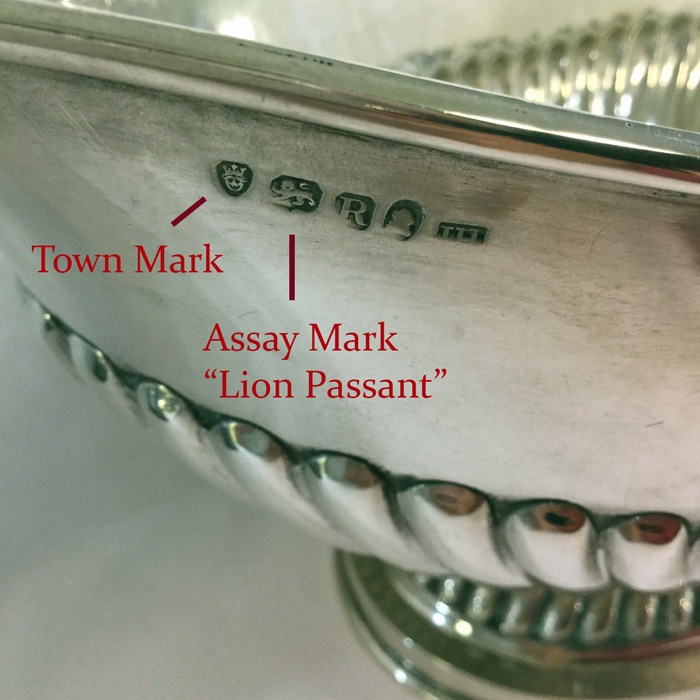 The assay mark, a “lion passant”, confirms that the item has met the qualifications of sterling silver standard. 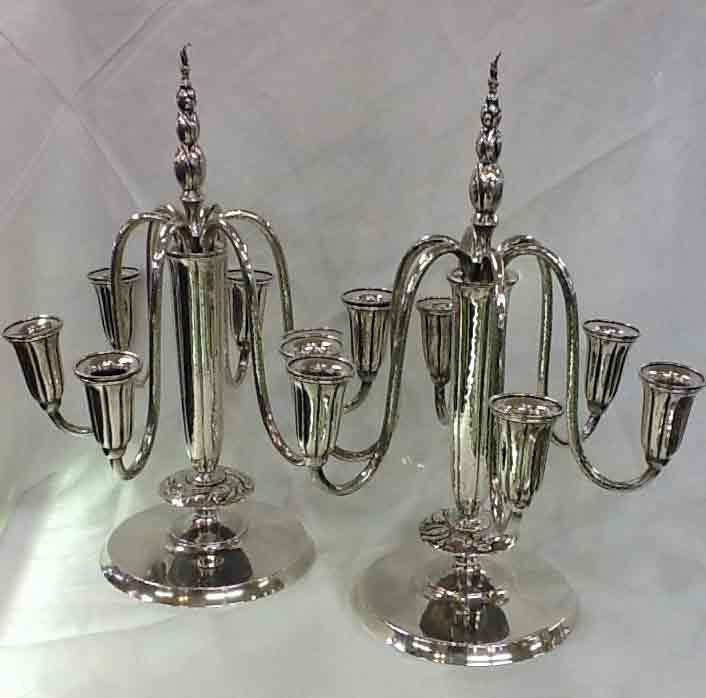 Pristine Georgian Sterling Silver 5 piece table garniture set. English hallmarks stamped for London in 1812. Created by Silversmith John Houle. 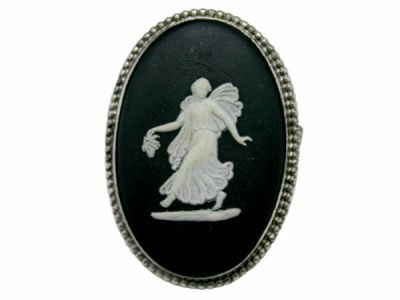 Please browse our site and our shop for Cynthia Findlay Antique’s great selection of Georgian silver jewellery and items. 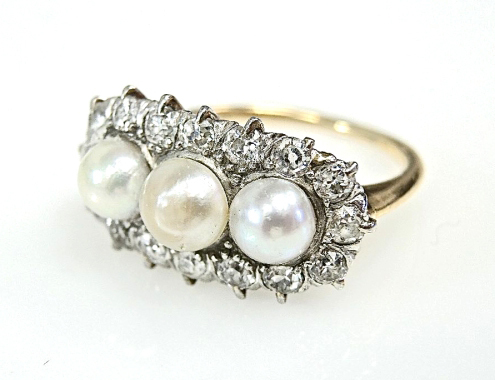 Care and Cleaning Tips For Your Open Backed Antique Vintage Jewellery & Engagement Ring! 1. 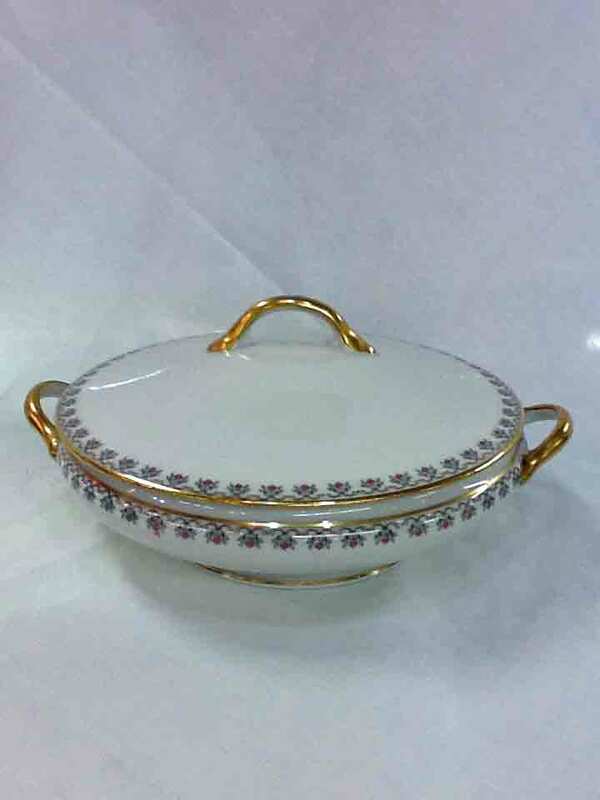 Place the antique jewellery item in warm water or the ammonia based window cleaner in a bowl. Be wary of using sinks, make sure all drains are closed! 2. While holding the antique jewellery over the bowl use the soft bristled brush, soap or cleaner to gently brush all crevices and underneath. Repeat this after rinsing if necessary. 3. Soak your antique jewellery overnight if it is coated with dirt, then follow step two. 5. 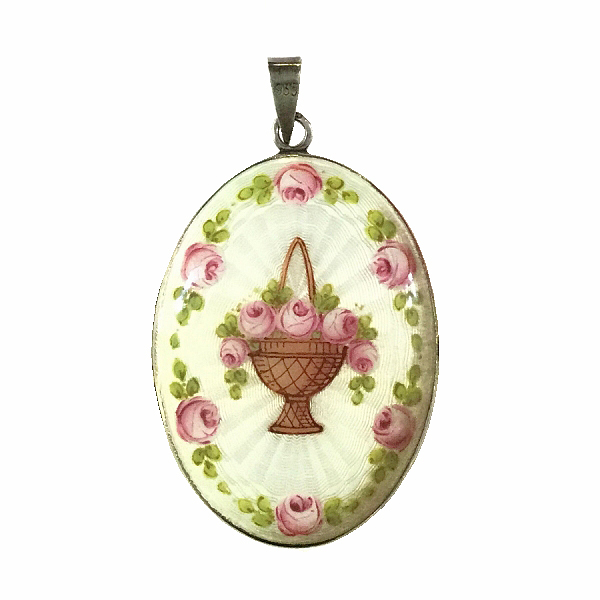 Dry your antique jewellery on a soft, lint free cloth or clean eyeglass cloth. Make sure to inspect the item once it is dry. 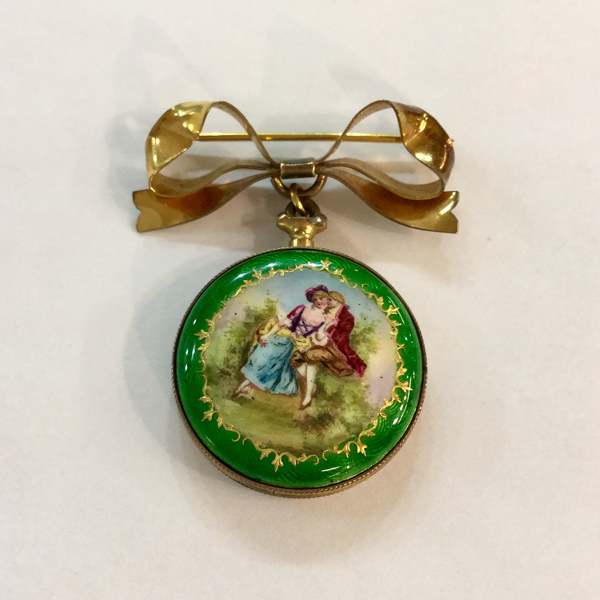 ii) Liquids should never be used on sensitive materials like hair, photographs or portrait miniatures – often these are found in vintage, antique lockets. Instead just use a cloth. iii) Opals, pearls, turquoise are common porous and soft gems which should only be cleaned with water and a mild liquid soap. Never soak overnight, and only immerse in liquids for a few minutes. 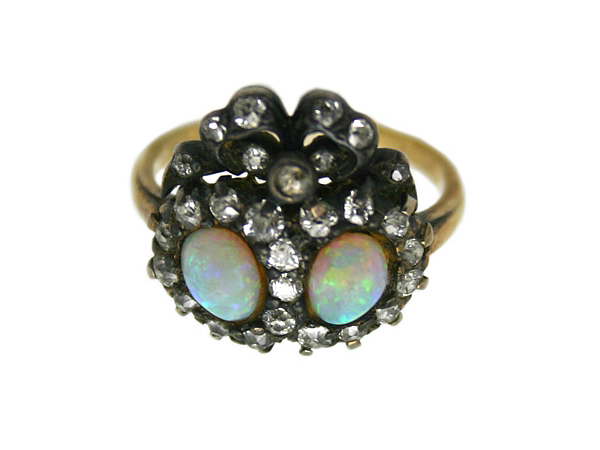 It is important to rinse well before drying your antique opal, pearl or turquoise jewellery. The Georgian period persisted from 1714 to 1837, it saw the rule of five different English Kings. Georgian Jewellery is very distinguishable, and very difficult to come by. 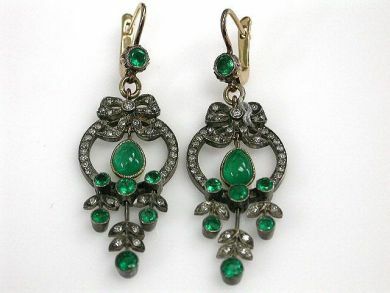 Jewellers of the time usually set gemstones in closed back settings, and they are also known for the ornate metal work. Georgian jewellery is truly a work of art; flower, crescent, foliage, ribbons and bows were common motifs. 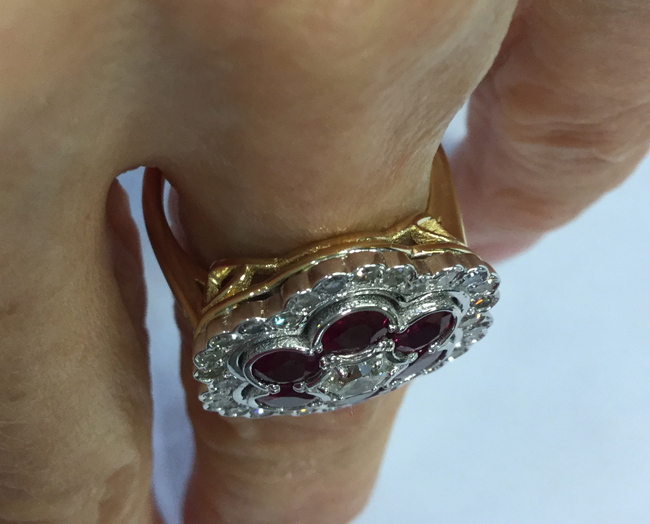 One of our clients recently purchased a stunning Georgian Ring. To own a piece of Georgian Jewellery is truly like owning a piece of history, and lots of care must go into it. 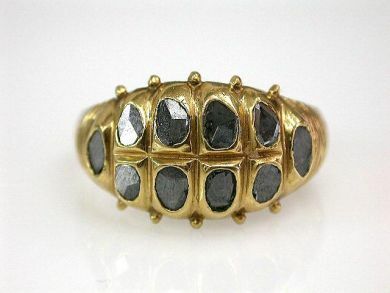 This ring has a closed back where you can only see metal and are unable to see the back of the gemstones, in this case diamonds. It is a common design of Georgian Jewellers who used foiling, backing the setting with foil, to magnify the light reflection of the diamonds. Georgian jewellery must never be on your hands while in contact with water, it should never be placed in liquids. This is to prevent moisture from getting in-between the stone and mount which will spoil the foiling and the colour. Caution should be taken when wearing Georgian jewellery in rain. 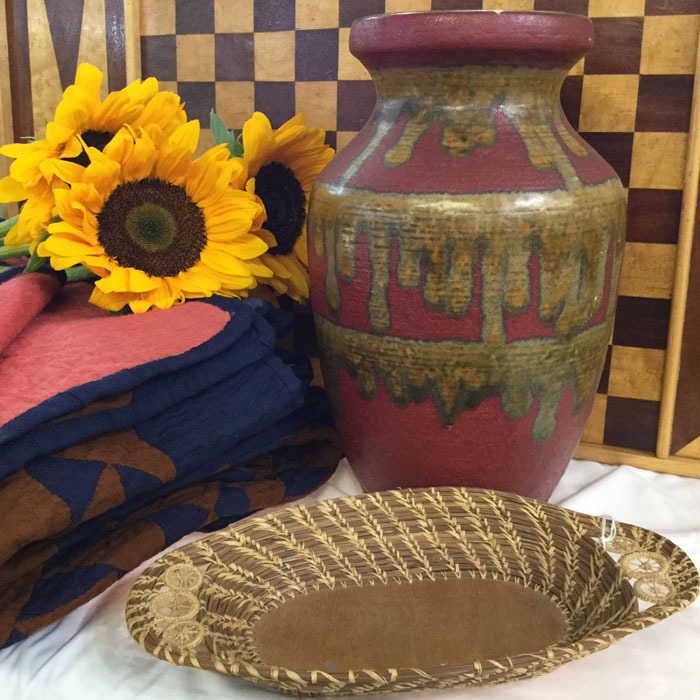 Instead of using water on old pieces, gold and silver treated cloths are best to use. The cloths found with eyeglasses can also be used to remove dirt and grease. 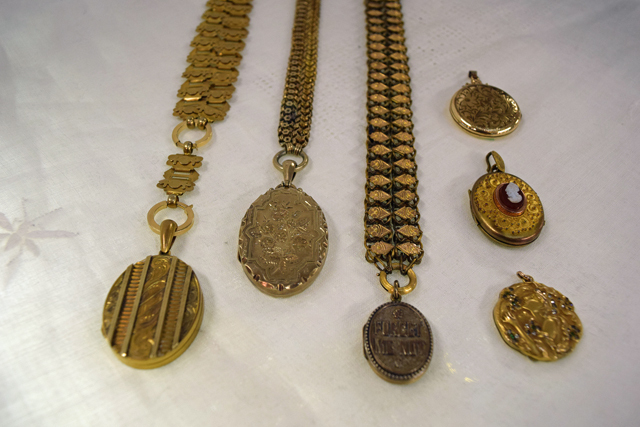 When storing Georgian jewellery, we recommend that is be stored in a soft fabric and individually so not to rub against other pieces. A dry humid-free storage area is best, but refrain from air tight plastic bags or boxes for lengthy storage times. Just like any work of art, we know that your Georgian Jewellery can last from generation to generation. 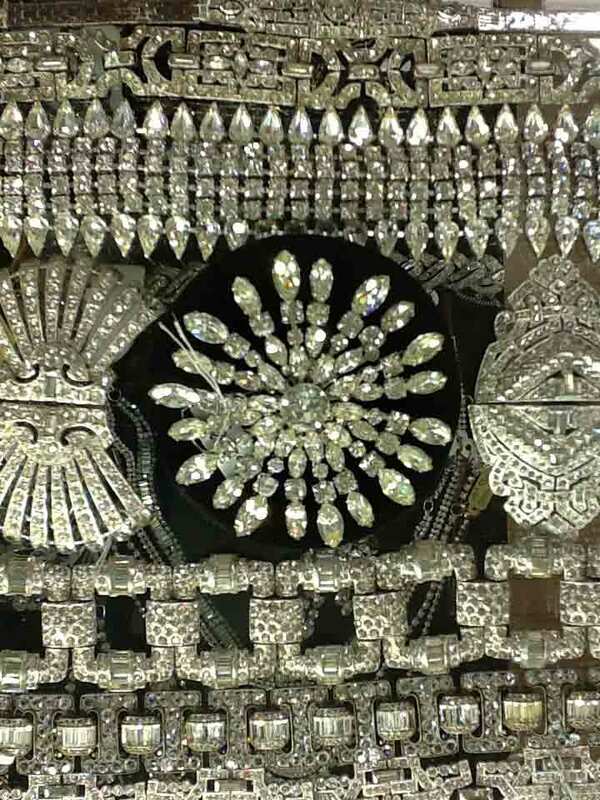 Georgian Jewellery worn frequently should be checked every year by a jeweller to ensure that any loose diamonds are secured. 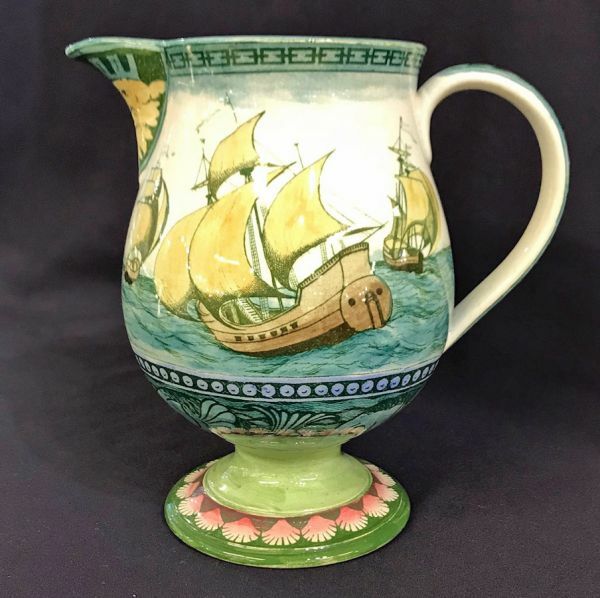 Contact Us at Cynthia Findlay Antiques to happily to assist you with this. 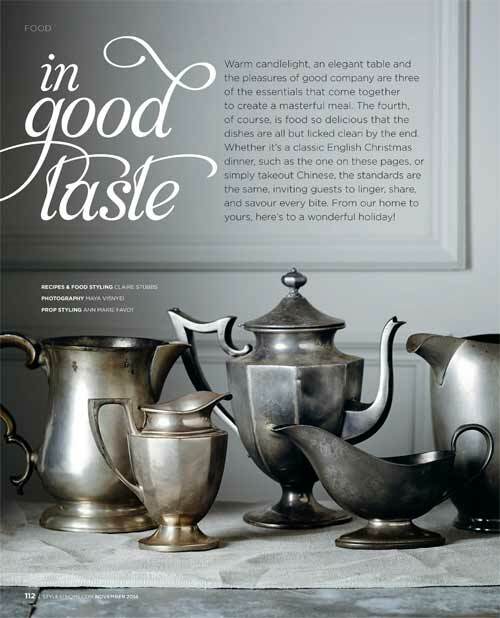 It was a delight to be featured in Style At Home's Cottage Style edition this summer. 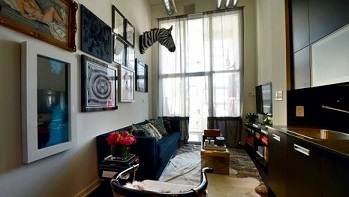 See the Top 5 Decorating Tips Below! We were very inspired by the decorating trends in this issue. So many great tips on decorating your cottage. Here is a list of the top 5 cottage style decorating tips from Style at Home! 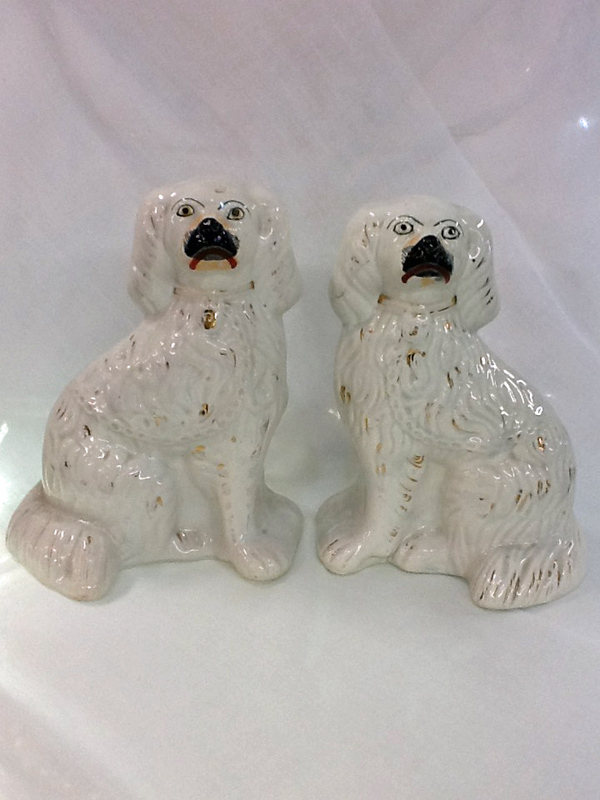 Searching for antique or vitnage gift ideas for the animal lover in your life? Cynthia Findlay's has an astonishing assortment of treasures to please even the pickiest pet parents. For the intellectual guard dog. Keep a perfect miniature of your best friend on any shelf or at the office. Speaking of the office, this little pup makes for a truly unique desk topper. His head opens to allows access to the ink but this well could be easily used to store office knickknacks. This ferocious Vintage tiger locket is absolutely stunning. 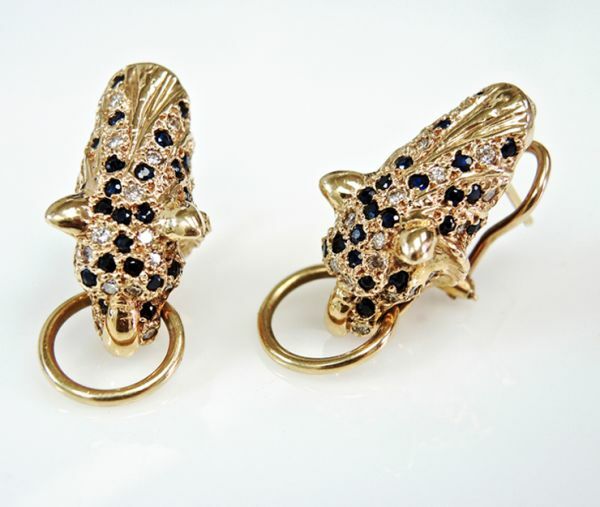 If you were on the hunt for Panthers these Cartier inspired earrings are sure to work! This antique sterling and mother of pearl rattle makes a perfect gift for the newest addition to your pride. 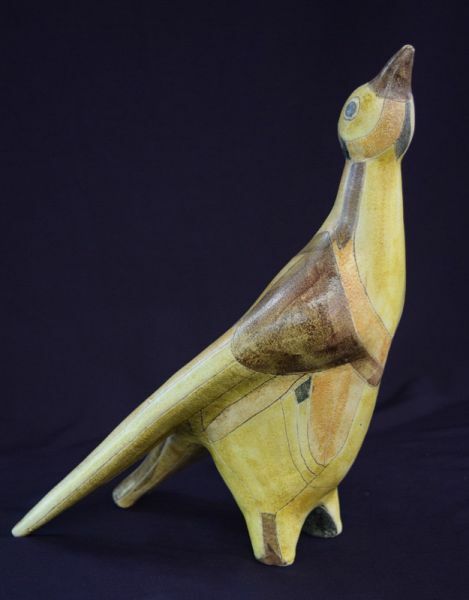 This exquisite Vintage Earthenware Harlander sculpture is just one example of a flock of majestic aviary statues. 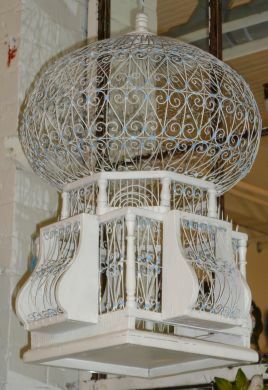 A Vintage cage makes for a lovely decoration both indoors and outdoors. This uniquely shaped mid century beauty was once home to a lucky bird or two. 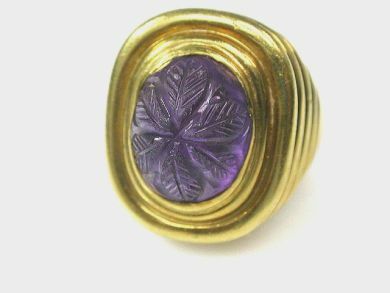 This carved agate intaglio ring features a bird perched regally atop a coat of arms. This Stratton compacts boasts a beautiful image of a regal mare. Renee Williams captured in bronze the moment of victory for a horse and jockey. The muscles seem to jump off the marble base and race through time from its original depiction in 1977. 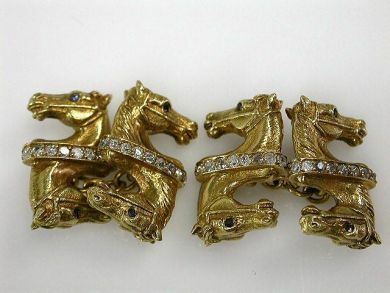 These double head horse cufflinks set with sapphires and diamonds are sure to take any suit to the next level. A perfect good luck charm. 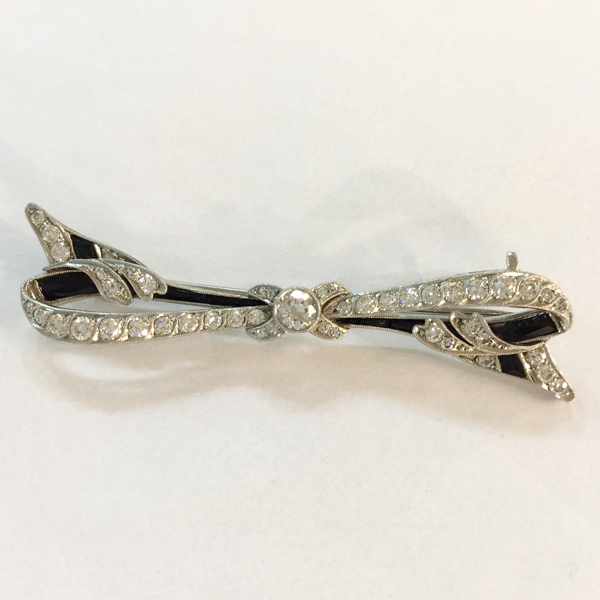 While horseshoe Jewelery comes in many shapes and sizes at Cynthia Findlays we are particularly enamored with this stunning Edwardian piece boasting European cut diamonds. All these and many more treasures for the 'inner animal' can be found at our shop on King Street West or by Clicking Here. This year's exciting new Spring tv sensation is 'American Gods' premiering on Starz (Amazon Prime Video in Canada). The television adaptation of Neil Gaiman's successful novel 'American Gods' (2001) explodes off the screen with action, intrigue and a wonderfully modern twist on mythology. The Old World Gods and the New Gods of Technology and Media war for their place in modern America. The main storyline follows Shadow Moon who is released from prison three days early to attend his wife's funeral. Ian McShane enters the scene as the compelling Mr. Wednesday (Norse God Odin) and in a chance encounter draws Shadow Moon into the war of the Gods as his new personal bodyguard. Each episode begins with a historical fiction of a different Old World God's 'Coming to America story'. These Gods arrive powerfully and dramatically through the prayers and spilled blood of their believers. Intense historical vignettes bring political issues to the forefront while also rooting the Gods of the Old World in the mythologies and faiths from which they came. The reviews of 'American Gods' are absolutely glowing, as is the feedback from Cynthia Findlay Antiques employees who had a chance to work alongside Props and Set departments to discover, buy and rent several store items to the filming of the show. As a big fan of Neil Gaiman's novel one employee remarked on the 'impeccable attention to details and the quality of the props choices made by the designers'. Details can define or destroy an adaptation and the crew of 'American Gods' did an absolutely terrific job in capturing the essence of the book in both physical objects and onscreen portrayals. This handsome Bronze Dog Satue. 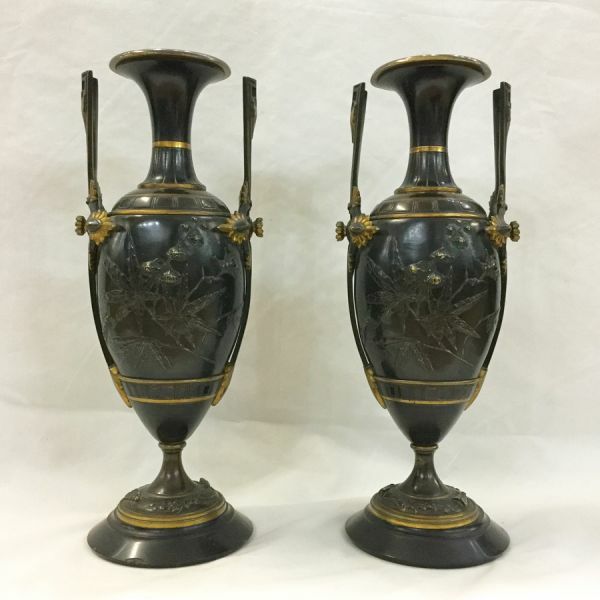 A pair of Stately Bronze Urns. 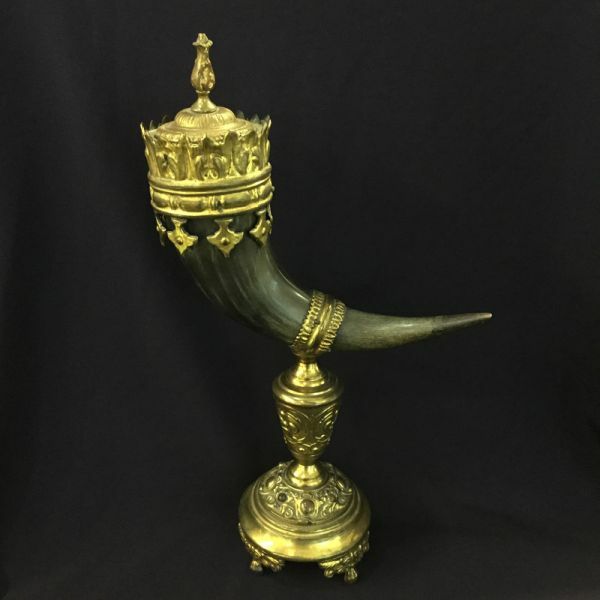 This perfect combination of Antique Masculinity and Delicate details on this Antique mounted, gilded horn cup. History comes alive in the Unique lines of this Pineapple shape silver plate Coffee and Tea Service circa the 1860s. Wonderfully detailed English Silver plate tea tray. Click Here and keep an eye out as the online list is expanded and updated to find your favorite pieces from a terrifically enthralling show! 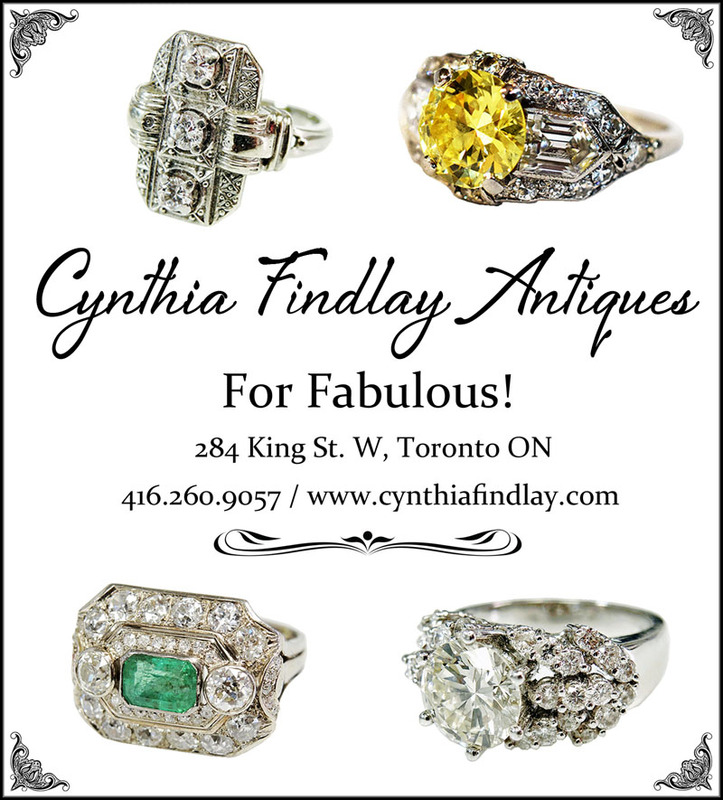 Cynthia Findlay's Antiques enjoys working alongside designers and crews to provide prop rentals and sales for magazines, television series and films in Toronto. Our staff will work alongside you to help bring your vision to life, onscreen and off. You've found 'the One' and now it's time to find 'the Ring'. As you begin engagement ring shopping it's easy to become overwhelmed by the vast array of choices. Instead of going to a jewelry store in a mall full of hustling people and searching for the latest- and likely most expensive- rings, why not consider purchasing a vintage ring? Antique and Vintage rings have timeless and classic looks, and in many cases are more affordable than similar modern rings. 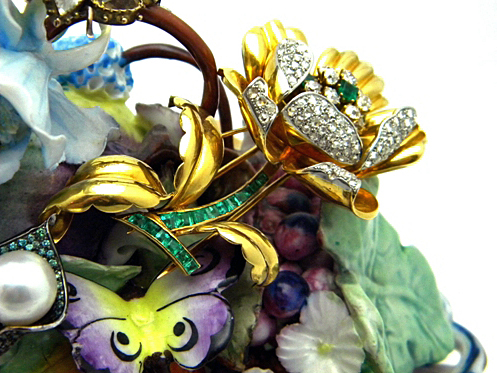 Craftsmanship: One of the hallmarks of vintage rings is their exceptional craftsmanship. From first look it's easy to see the time and care that a highly skilled jeweler spent crafting a vintage or antique ring. To commission a ring today with the same level of skill and quality as an Edwardian, Vintage or Art Deco ring would cost much more than finding the perfect piece that has already been lovingly created. Uniqueness: The engagement ring that you purchase should be a show-stopping, one of a kind piece that stands out from the crowd as much as the woman who will wear it. There's no better way to ensure her ring is unique than to purchase an antique engagement ring. The age of these rings and the likelihood that they were in fact handcrafted means that you'll very rarely see two identical rings. Symbolism: An engagement ring is a symbol of a commitment that will last forever, and a sign that the marriage you are proposing will be timeless. 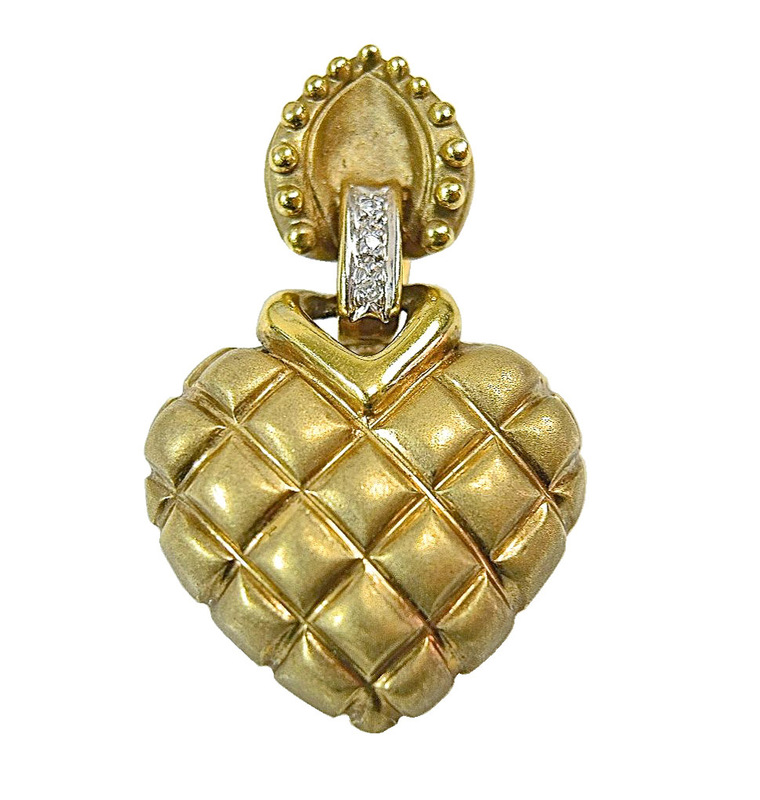 What better way to symbolize this enduring bond of love than with a timeless piece of jewellery? A vintage engagement ring shows the world that you have a love that transcends time and -like vintage jewellery- will never go out of style. On the day before Canada's 150th Birthday we celebrate the Birthday of another Canadian icon: the Loonie. June 30th, 2017 marks the 30th year since the Loonie entered circulation in 1987. This iconic, brass plated steel coin was introduced to phase out the dollar bill in Canada and became affectionately known as the Loonie because of The design of the Common Loon that it features. The name 'Loonie' was so popular that the Canadian Mint legally secured rights to the name in 2006. The Loon has become a Canadian symbol thanks to the design by Robert Ralph Carmichael, but the dollar almost displayed a very different image. The original design for the Loonie featured a French explorer and an Indigenous man in a canoe. On the way to production the plates disappeared and out of fear of counterfeiting a new design was chosen for the Canadian dollar coin. The Loon is a majestic water bird that mainly lives in Northern Canada and Northerly parts of the United States. These black and white beauties are diving birds that live off fish and crustaceans. The Loon's sight aids in their underwater hunting so they prefer to live on clear lakes such as in the Muskokas. The beautiful, plaintive cry of the Loon can often be heard echoing across lakes in Canada's cottage country. Loons have often been seen as a romantic bird because they take a single partner to mate with, co-incubate their eggs and both parents take responsibility for the 1-2 chicks born each season. If a female loon loses her mate she may eventually take another partner during her up to 30 year lifespan. A majestic and noble symbol of the Canadian North, the Loon can be found in many collectible ways in addition to the Loonie. Carved wooden loons are popular choices for the cottage chic look. Loon paintings make a lovely addition to the Canadian household. To shop our selection of Vintage Loon themed items come by our storefront at 284 King St W.
Happy 30th Birthday Loonie! And a Happy 150th Birthday to you Canada! For some other Great Canadian ideas check out our Canadian Collection by clicking here. 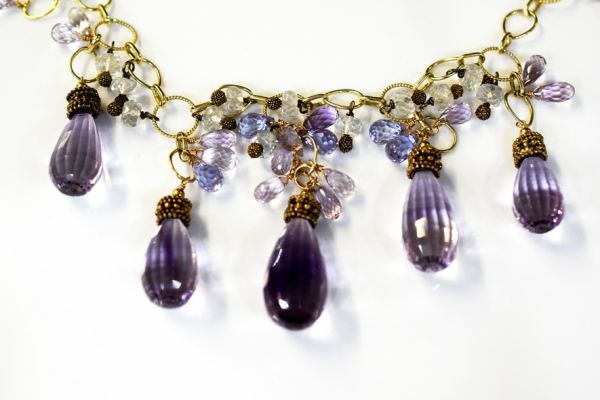 In honor of Uma Therman's stunning 19th Century Amethyst Rivière necklace that sparkled on the red carpet of the 71st Annual Tony Awards on June 11th we decided to take a look at this timeless necklace style. Wondering what a rivière is? The Rivière necklace received it's name from the French word for River, because the faceted gems of this necklace flow gracefully around the neck of the wearer. Stones in a Rivière necklace are individually set and often graduating in size. 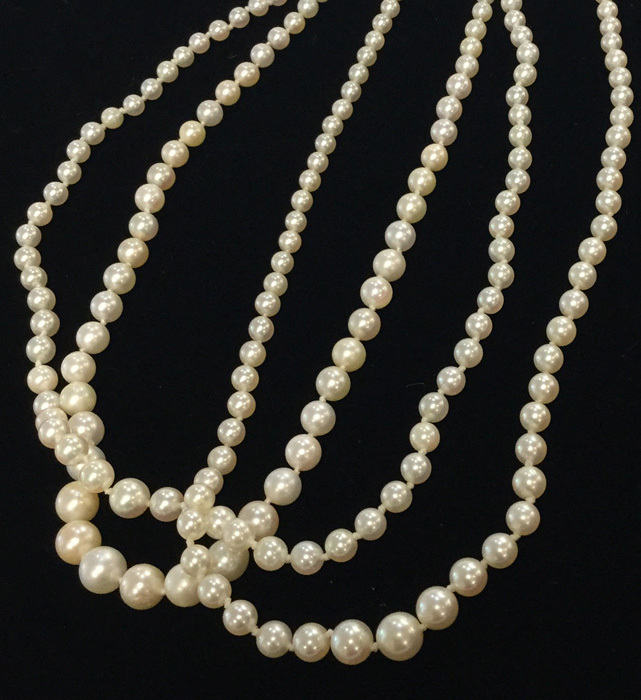 Rivière necklaces are typically shorter fitting necklaces ranging from 14-16 inches in length. When the Rivière style was first developed in the Late 17th-Early 18th century the stones were set with closed backs, as the style became more popular this was adapted to open settings to allow more light and enhance the smoothly flowing, shining river effect. 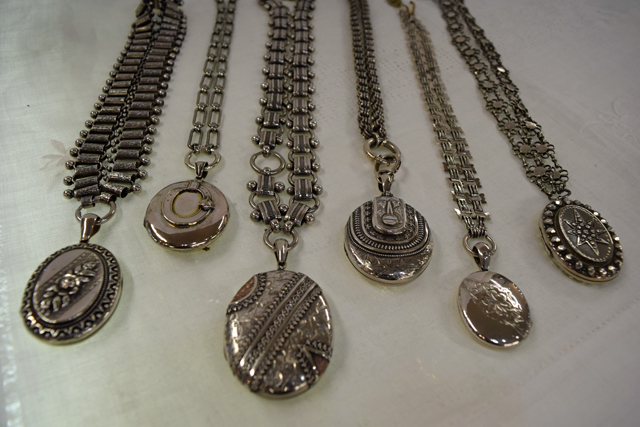 Stones set in a Rivière necklace are the same shape and the same size (unless there is a slight graduation to the center of the necklace), and on some of the more ornate examples a pendant hangs in the center. The rivière is a timeless setting that has been popular long after the Georgian period of its invention, and Uma Therman's outfit Sunday is a great example of how the Riviere's classic lines dazzle and enchant even as part of modern outfits. 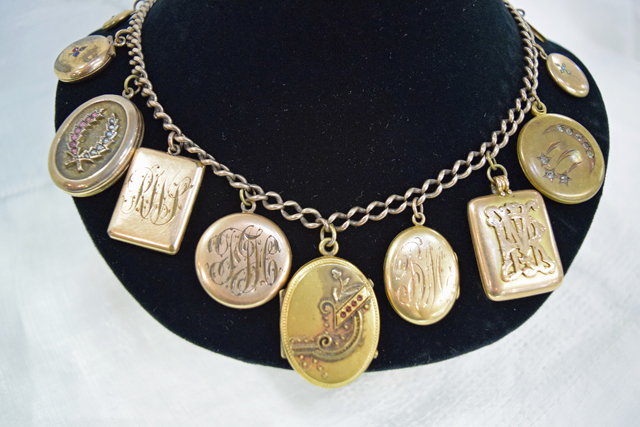 We were inspired to capture images of some of our favorite Rivière necklaces from the Cynthia Findlay collection. For more info please contact us and refrence the product numbers on the picturers. With Father's Day around the corner we thought it would be fun to find 10 interesting facts about this holiday celebrating the wonderful men in our lives! We've also found a few fun fact based gift ideas to inspire you in your Father's Day shopping. 1 - Father's Day is currently celebrated in over 50 countries around the World. For the Globe-trotter in your life you'll find a terrific selection of globes and maps in store. 2 - Father's Day was Invented in 1910 by Sonora Dodd of Spokane Washington in honour of her father who raised his children as a single parent. Dodd chose June 19th in honour of her father's birthday. 3 - According to Hallmark, Father's Day is the 4th largest card holiday of the year, selling over 74 million cards annually. Why not try a different take on the traditional card? 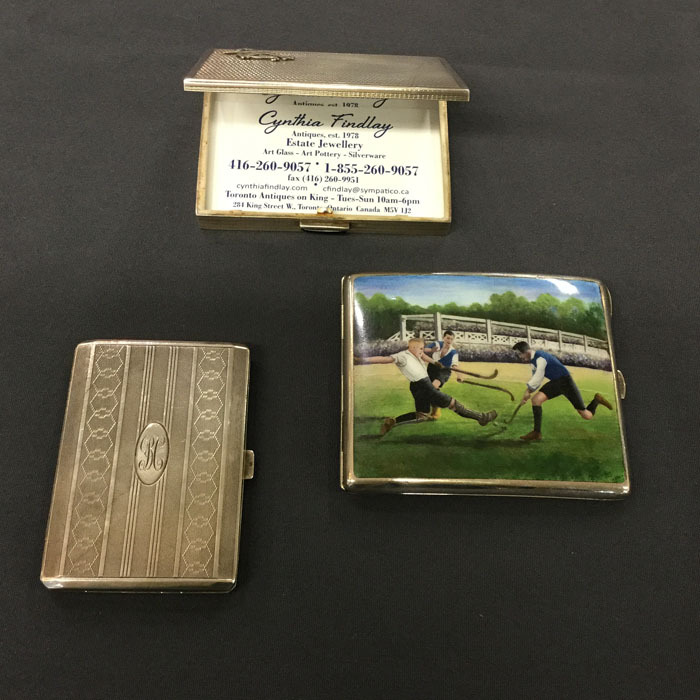 Business card holders are a snazzy and unique Father's Day gift. 4 - Among those giving cards and gifts on Father's Day, 20% of purchasers are wives buying for their husbands. 5 - Male sea horses carry the babies of their female counterparts. 6 - Father's Day wasn't declared a legal Holiday until 1972 when Nixon officially signed off on Father's Day. Although it was widely recognized on the third Sunday in June before 1972. For signing off on important decisions we recommend a lovely desk pen set. 7 - In Germany the day is celebrated by fathers drinking in beer gardens and going on hikes with other dads, dragging wooden sleds filled with beer. 8 - The oldest first time father was Ramjit Raghar whose firstborn daughter was born after his 94th birthday. If your 94 year old father figure is moving a little slower than Ramjit he might appreciate a handsome wooden cane for Father's Day. 9 - The necktie is the most popular Father's Day gift to date! 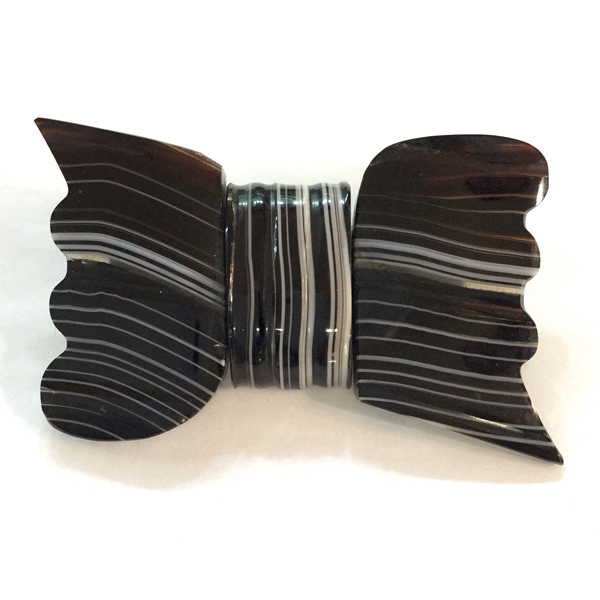 A fashionable add on to this Father's Day classic is a handsome tie clip/tie bar. 10 - In a 2015 survey it was found that 1 in 10 stay at home parents were fathers. As women become more active at work men are stepping up to the role of primary caregiver. Wishing the Happiest of Father's Days to all the important men in our lives. 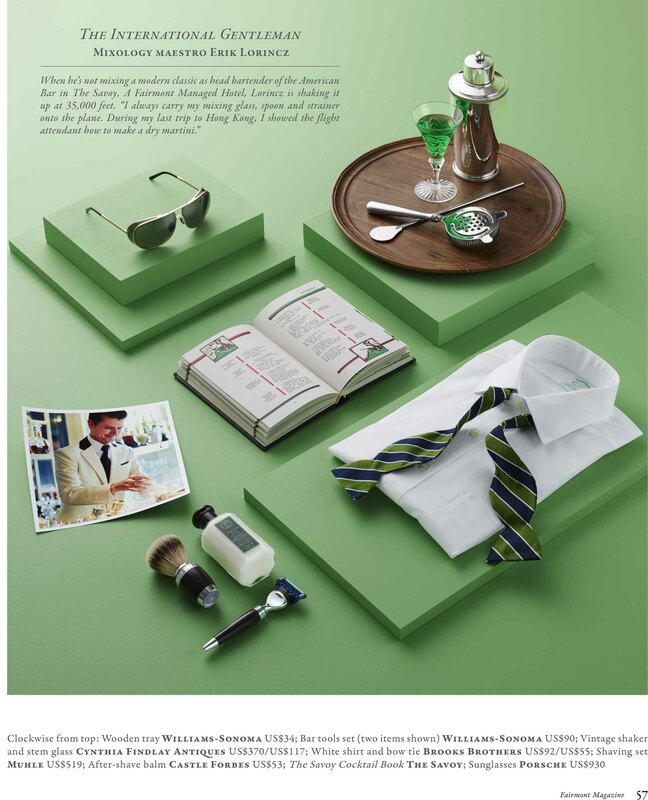 Please Click Here To Shop Our Father's Day Gift Guide. 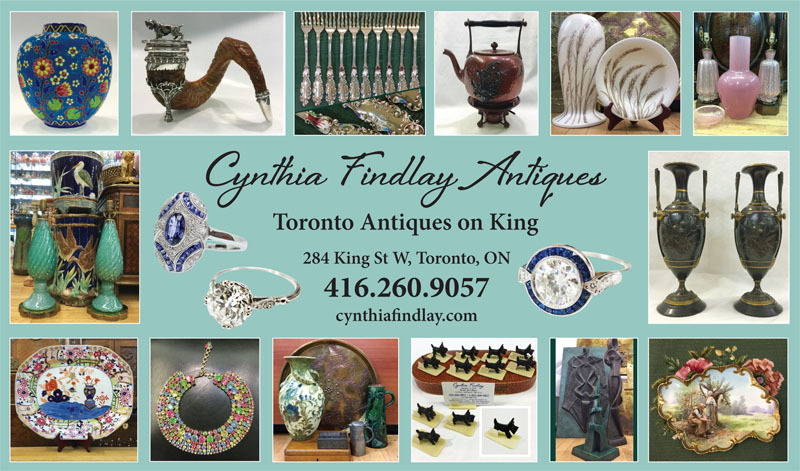 An active Winston Churchill enthusiast came to Toronto for a Chuchill association dinner and discovered Cynthia Findlay's Antiques. between his teeth to emulate the tenacious former British Prime Minister. version named 'Jack' sported variations of the Union Jack flag on his back and represented England. 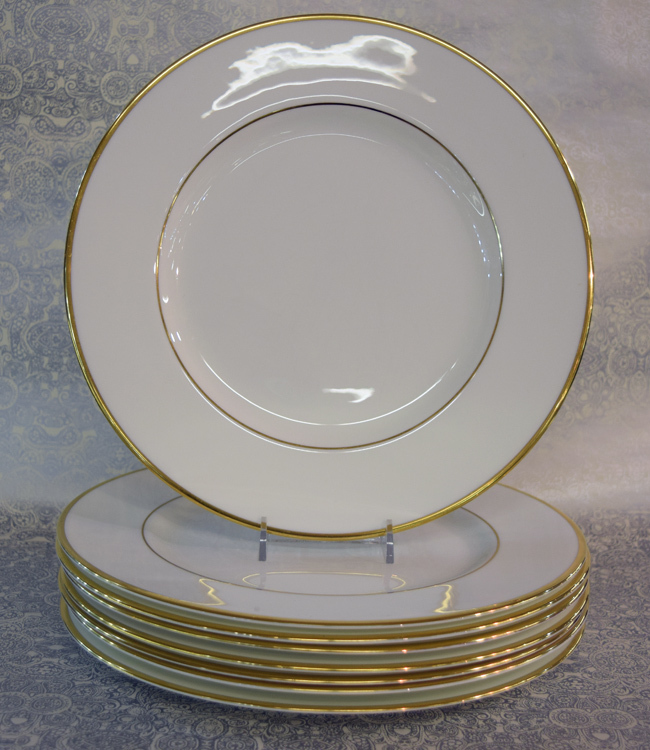 from Royal Doulton in store at 284 King St. W. by clicking here. Mother. Mom. Mammy. Ahm. Majke. Ma. Matre. Mutter. Maman. Mommy. something as individual and rare as she is. 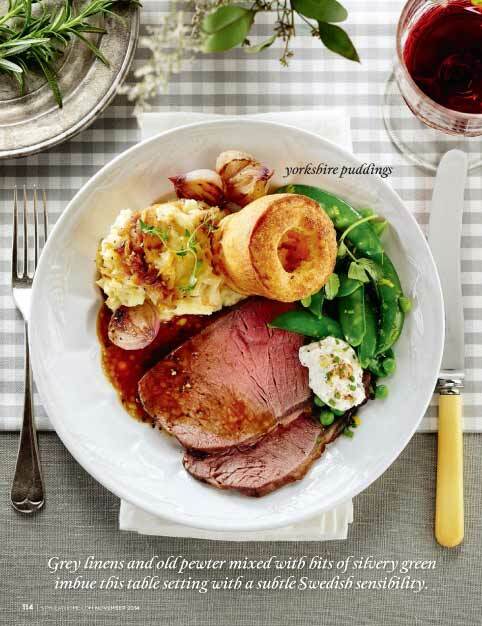 We've made it easy for you with the mothers day guide. 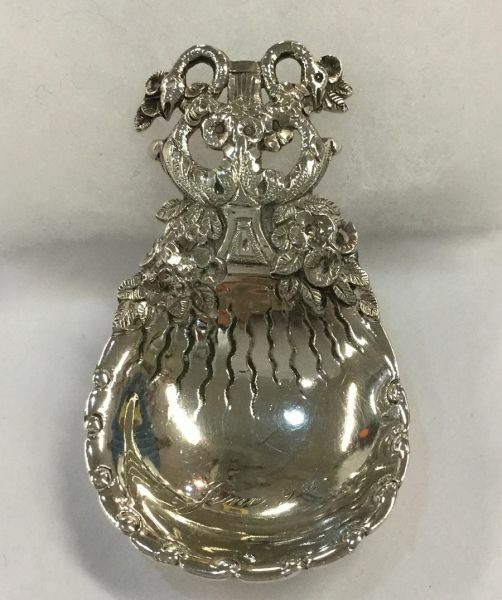 Sterling hand mirrors. 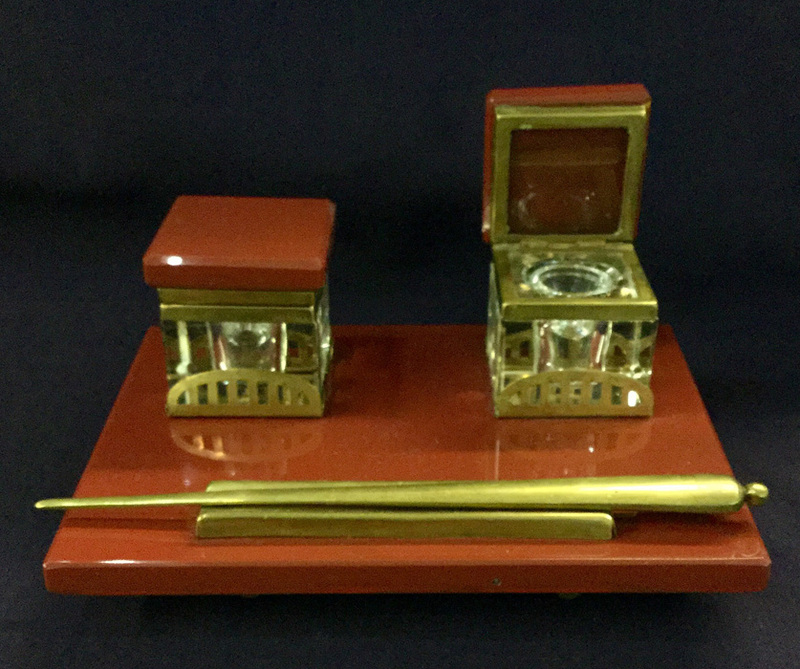 Lovely on top of a dressing table, a sentimental reminder of her own mother or as a reflection of her inner and outer beauty. 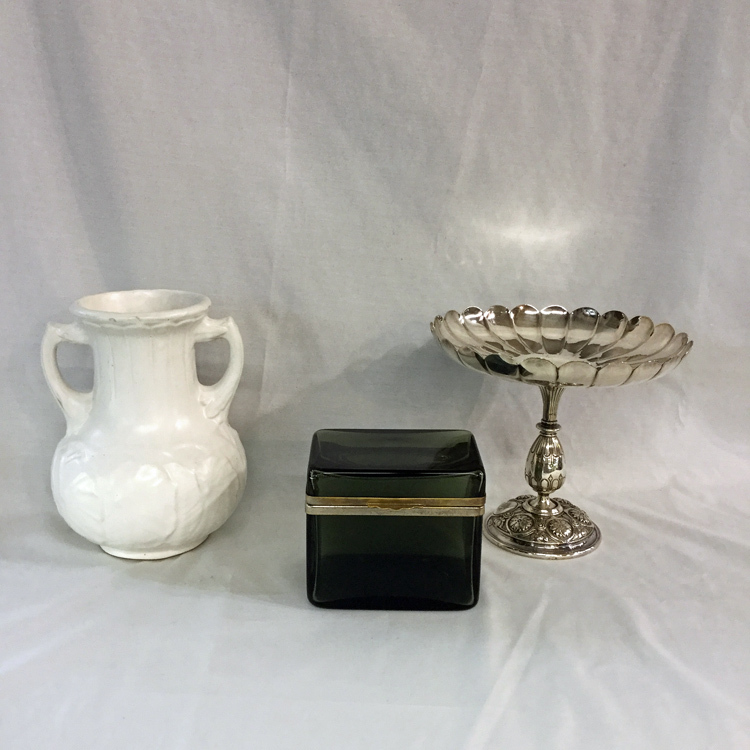 Sterling and crystal containers. Perfect for her vanity table or bathroom these containers can be filled with jewellery, makeup or scent essentials. As an added bonus why not pick up a piece that's already monogrammed with an 'M' for 'Mom'. Jewellery. One can never have enough jewellery. We've picked out a few favorites that are unique and stunning, but won't break the bank. 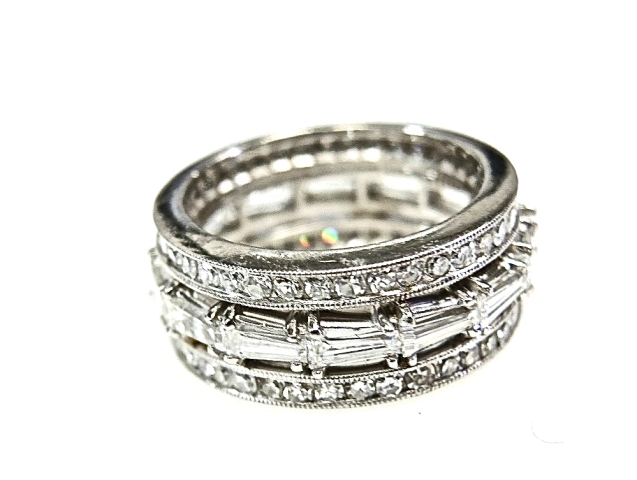 Your mom will love these eternity bands. Compacts. Purse sized daily reminders that her family loves her. engraved vintage tea strainer. View full tea sets here. For all the Mothers, Grandmothers, Stepmothers, Aunts and Motherly figures in our lives: Happy Mother's Day. Thank you for your love and support. We appreciate you today and always. 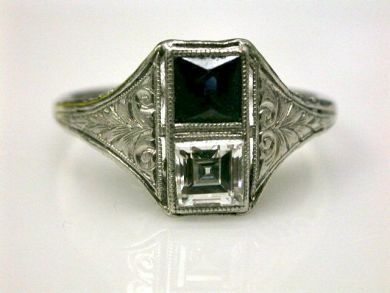 What's Shopping For Art Deco Rings Like? the epitome of luxury jewellery - they feature geometric designs with fine details. rings as a symbol of their found love. 2. 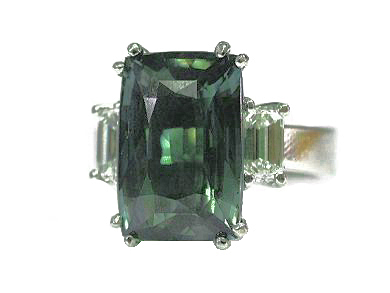 Art Deco Ring Emerald Cut Diamond. 3. 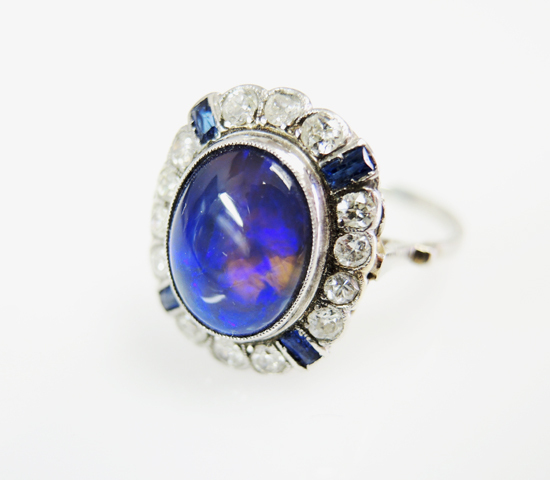 Art Deco Opal Diamond Sapphire Ring. synthetic deep blue sapphire, est 0.36ct. colour) and 16 square mixed cut medium dark green emeralds, est. 0.65ct. European cut diamond est. 4.02ct (clarity: SI1 & J colour). This ring is available to be seen by appointment. 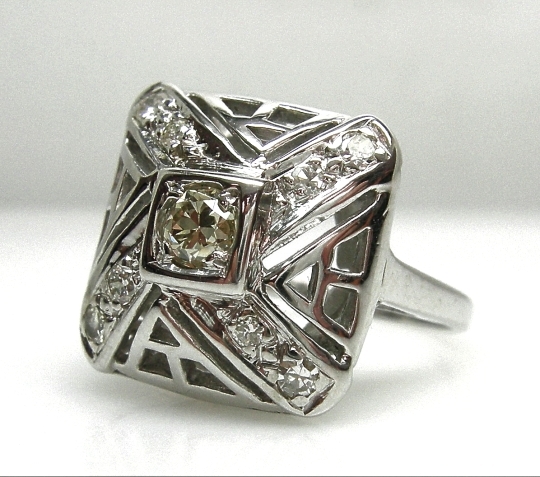 To see more Art Deco Rings please click here. 'Brew me a cup for a winter's night. Winter has descended and its icy grip can drive even the heartiest among us back inside to the warmth of a blanket, a fire and a steaming cup of tea. Add to this cozy scenario a cheerful vintage cup and saucer set decorated in little flowers, or funky bright colors and suddenly winter doesn't seem so bad. 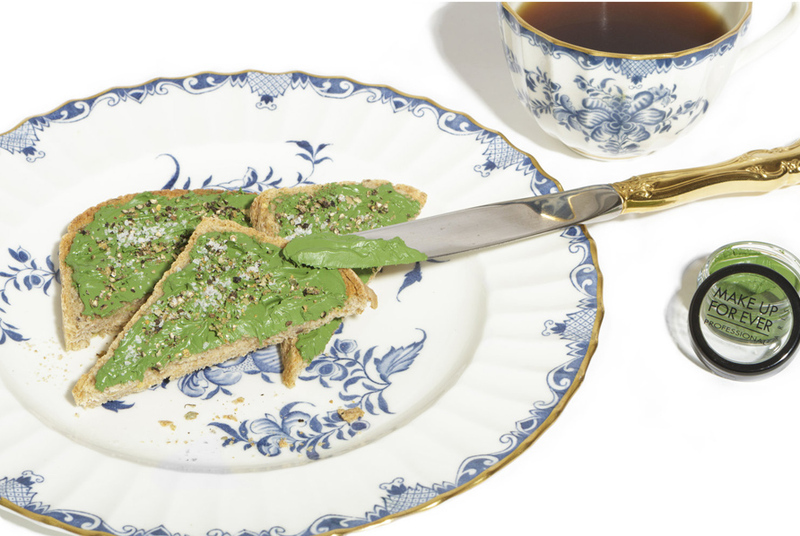 Having tea for two, or a full winter tea party? 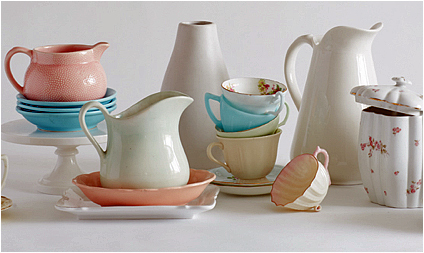 Tea sets make any gathering into an event and brightens up the living or dining room. 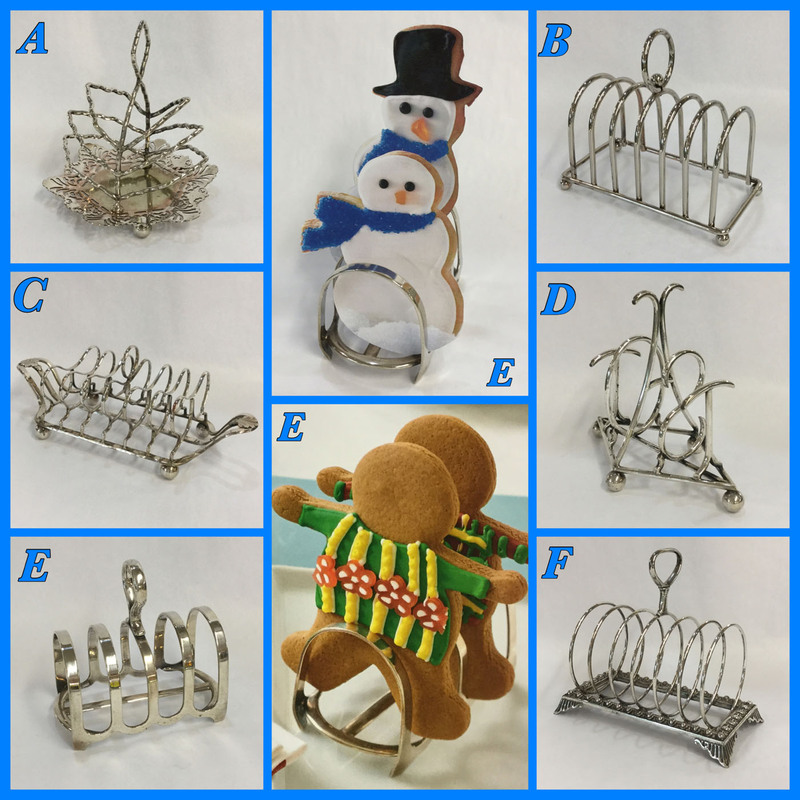 If these images 'tea-sed' your imagination and tastebuds visit 284 King St W. where the friendly Cynthia Findlay's staff will happily help you create the perfect Winter tea party setting. 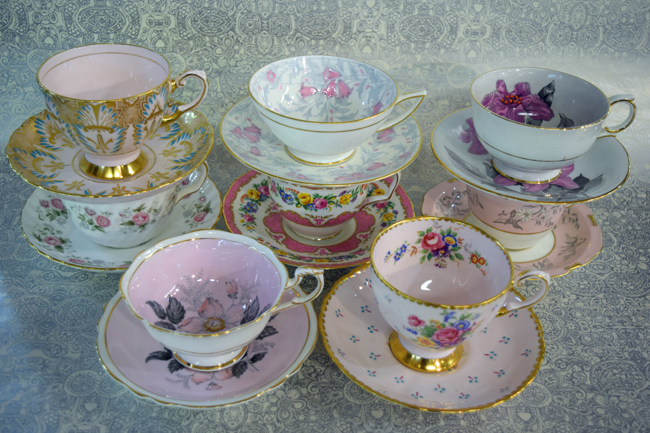 Or if you're unable to visit us in person please click here to shop our Antique & Vintage Coffee & Tea Time category where you find our lovely selection teacups and saucers. Garnet is January's birthstone, find out why garnets still continue to surprise and Dazzle! In the frost and chill of winter January marks a month of New Beginning, and what better way to mark new beginnings than with a birthstone that has withstood the test of time but still continues to surprise and dazzle: the Garnet. The Garnet is a stone of strength, loyalty, vigor and faithful love. 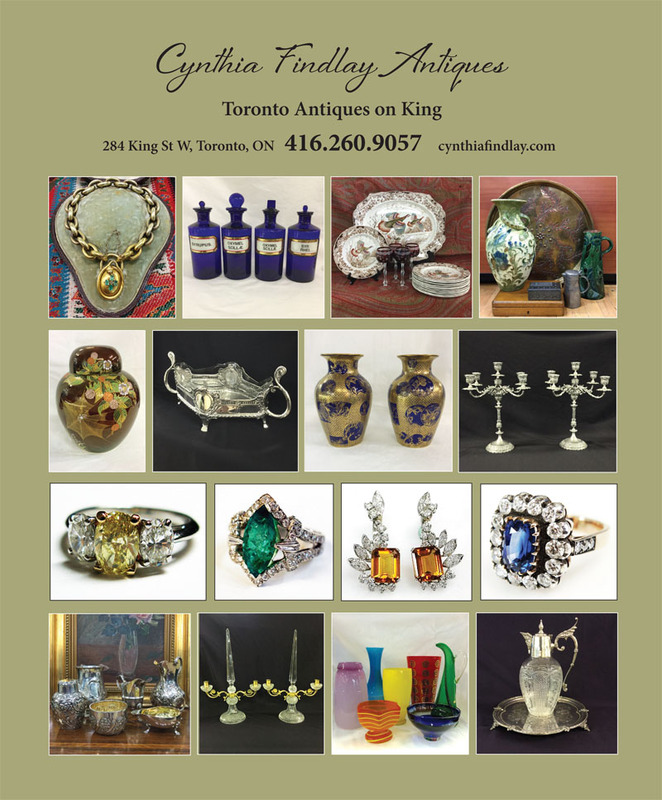 If any of those qualities sound like the January baby in your life come in to Cynthia Findlay Antiques and we will help you select a very special antique or vintage garnet jewellery treasure. 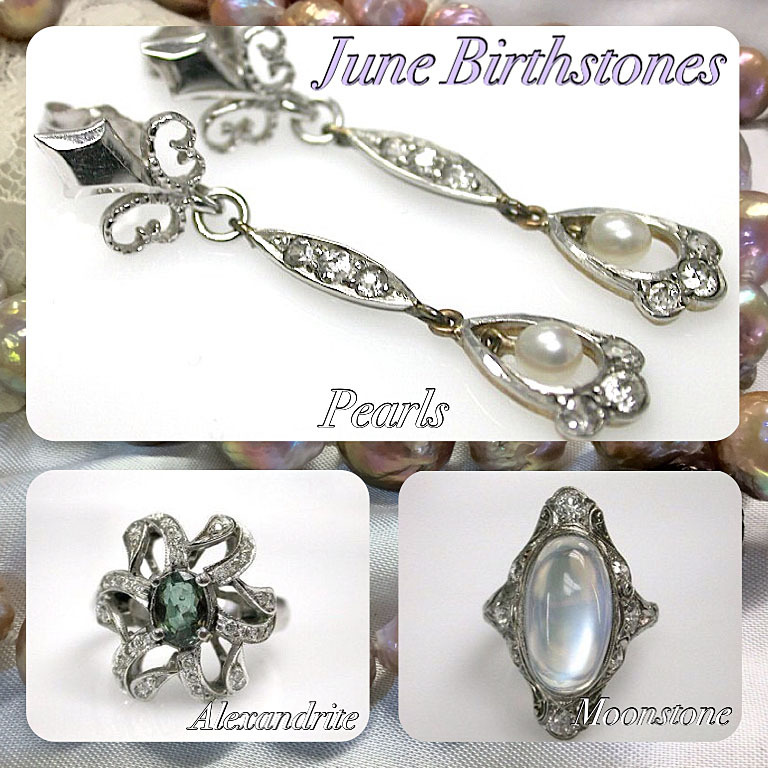 Curious to know more about January's birthstone? The most common colour for Garnet is a deep red, however these gemstones can also be found in shades of orange, yellow, green, purple, brown, pink and (on very rare occasions) blue. Garnet can be cut to showcase a high glasslike shine or can be found in a resinous, bead quality in longer necklaces or earrings. Garnet rates a 6.5 - 7.5 on the MOHs scale of hardness. The word 'Garnet' is claimed to descend from the Latin word 'Garanatus', meaning seed-like; as the garnet closely resembles the rich, juicy red seeds of a pomegranate. It's from this resemblance to pomegranates that many of the most intriguing mythologies surrounding January's birthstone were born. In Greek mythology Hades is said to have given a pomegranate to Persephone before she left him to ensure her speedy return. A garnet given to your beloved is thought to hold the same power to help heal the bond of distance and ensure a safe and speedy return. 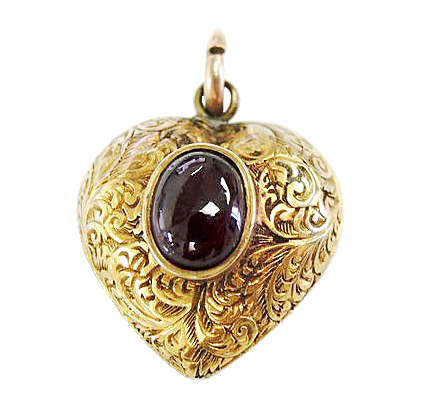 What a lovely sentiment an antique or vintage garnet bracelet or necklace would make in reminding the wearer to follow their heart back home to you after their travels. Garnets have been called the 'women's stone' as their color and ties to the pomegranate are a reminder of the power and fertility of the female womb. Many men wear garnet as well, and in fact the King of Saxony is said to have a Garnet weighing over 465 carats! A Legendary stone, Garnet boasts a long and interesting history. One of the earliest discoveries of garnet was as a necklace in the grave of a young man from 3000 BC (the Bronze Age). Egyptian pharaohs wore garnet both as decoration and as part of their ceremonial garb to symbolize their strength and endurance. Plato had his portrait engraved on a garnet by a Roman engraver. Stories say that the 'Barbarians' who took over the Western Roman Empire wore the Garnet stone to improve their strength and perseverance as warriors. Garnets have also enjoyed popularity in many different cultures and religions, and can be seen decorating Bohemian churches as well as in many religious texts. 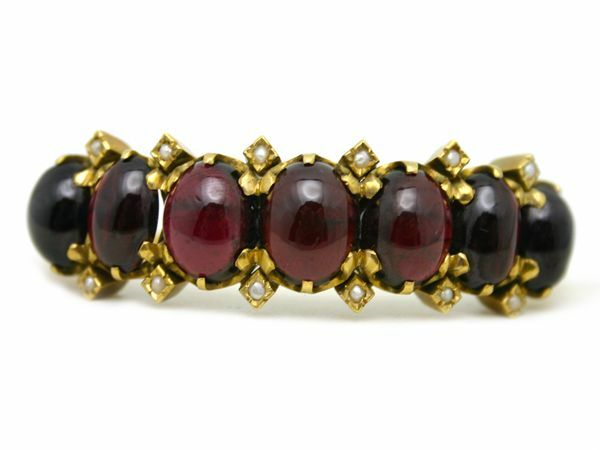 Garnet held incredible popularity in Victorian jewelry during the 18th and 19th centuries, and many breathtaking Victorian necklaces, bracelets and earrings can be found here at Cynthia Findlay antiques. Garnet is not only the stone of separated lovers, January birthdays and new beginnings, it is also the official gemstone for the second year of marriage. 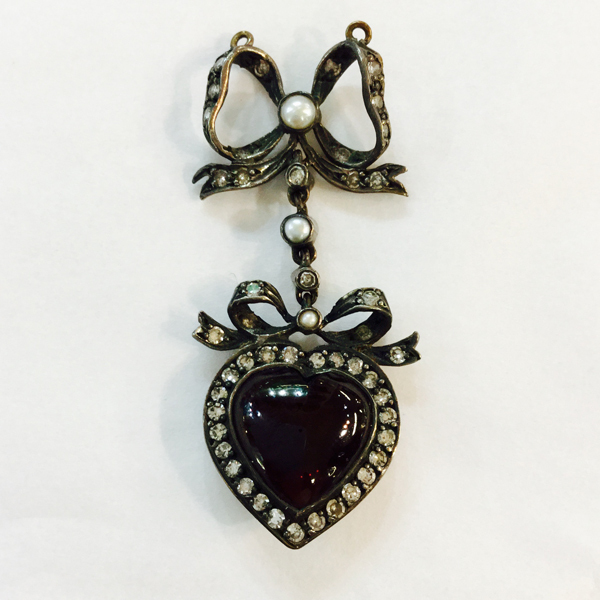 We invite you to give the gift of meaning and lore this January, in the form of a unique vintage or antique piece of Garnet jewelry from our collection. 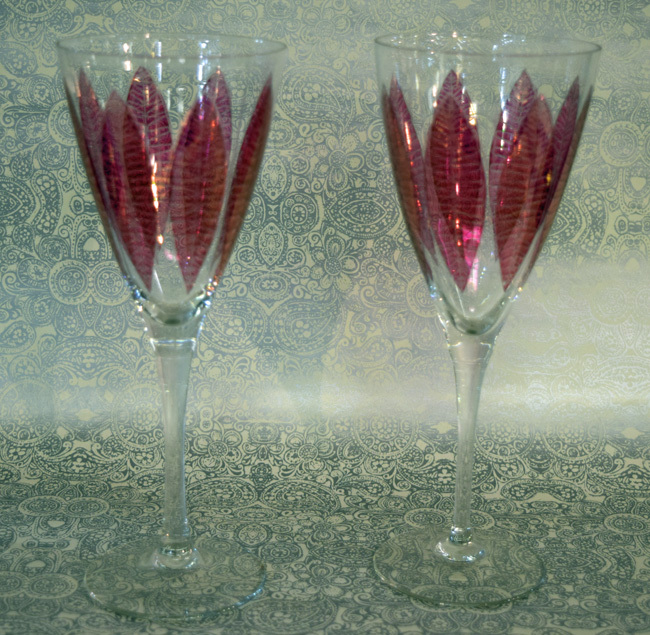 A Guide to Adding Sparkle to your New Years party with Vintage Crystal Stemware! 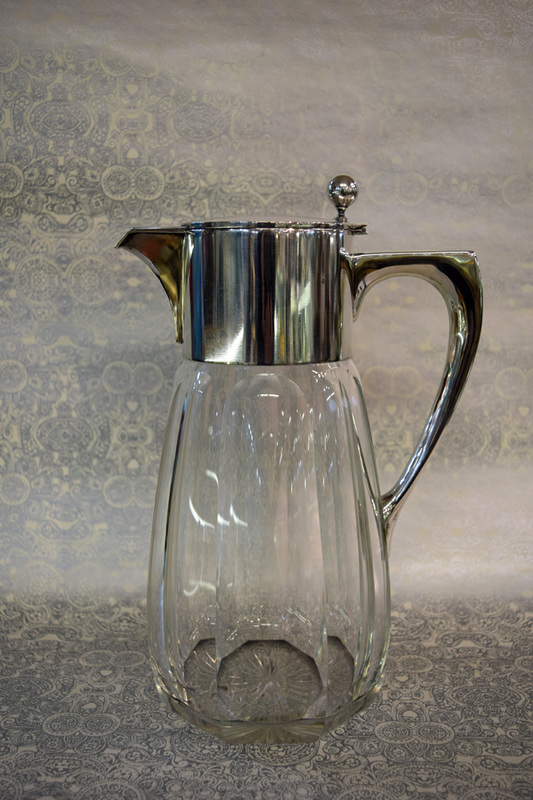 set with the sparkle and timelessness of a classic crystalware pattern paired with shining silver accents. The champagne will need somewhere to chill during the festivities; so an eye catching champagne bucket is definitely in order! Champagne buckets are a versatile accessory that can be used to showcase floral arrangements or other seasona decorations when not in use for chilling. When it comes to champagne glasses themselves there are two main shapes from which to sip your New Years bubbles. 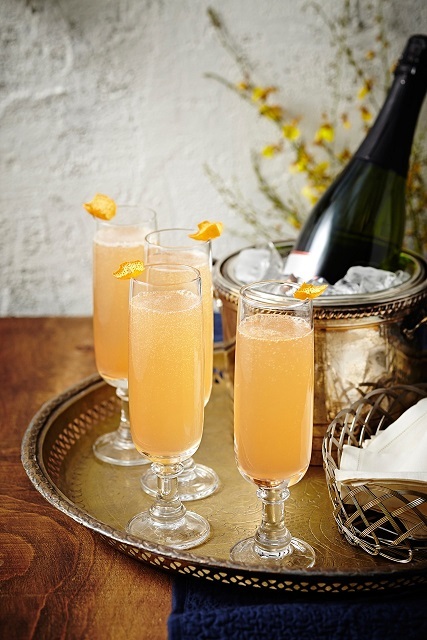 You're probably familiar with the statuesque fluted champagne glass (stemmed or stemless). Flutes were designed to allow for champagne to maintain it's sparkle longer and to encourage bubbles to the surface of the glass to dance on your tongue with every sip. The elegance of cut Crystal fluted champagne glasses is preferred for dry and off dry champagne and prosecco. The glass that gained popularity in the 'roaring twenties' with it's open top and delicately turned out edges is known as the Champagne Coupe. The coupe or 'bowl' glass allows the flavors of the wine to develop more fully but also encourages the bubbles to escape faster so that they do not tickle your nose as you sip. Coupe glasses are often the favorite choice for sweet, full bodied sparkling wines. Does your party have a signature cocktail or will your guests be enjoying? 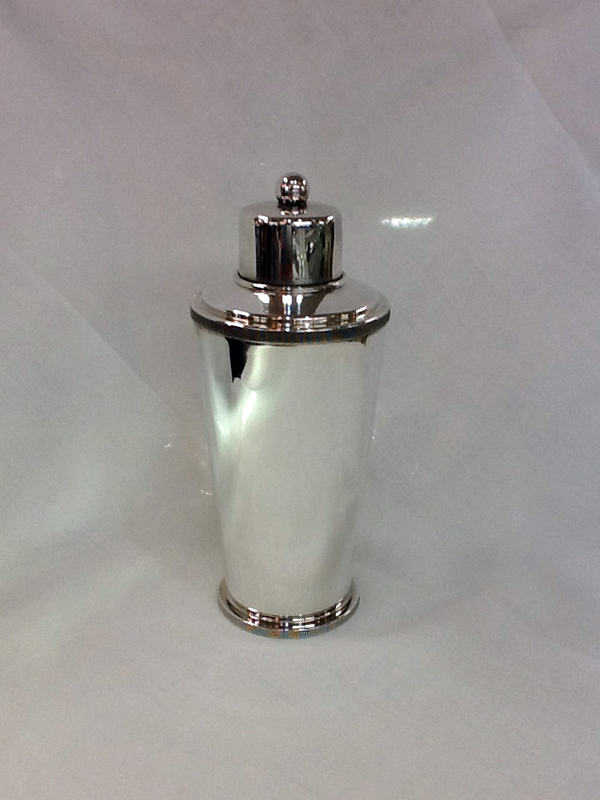 Whimsical or dignified cocktail shakers make serving a signature drink a breeze; and make you look good mixing it! 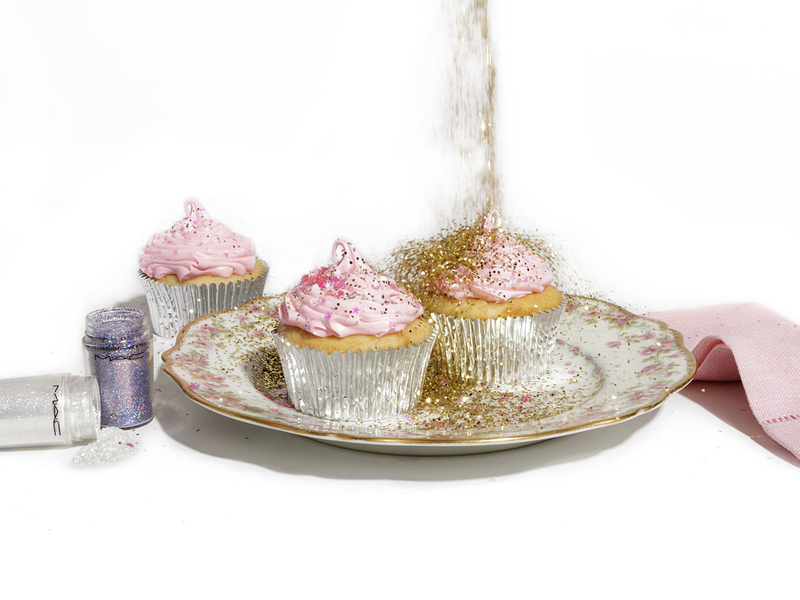 Need more crystalware than just champagne glasses? 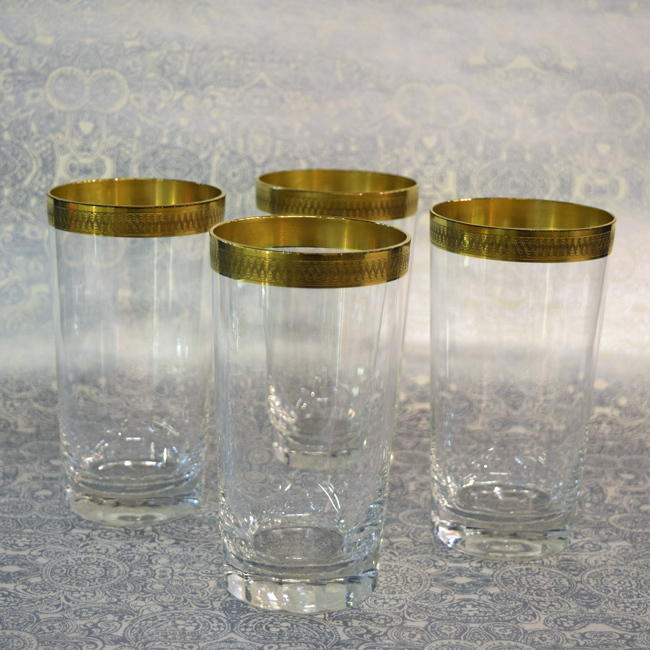 Here at Cynthia Findlay Antiques we have all shapes and sizes of glasses a wide variety of styles to compliment your dream barware set. Click here to browse our selection. 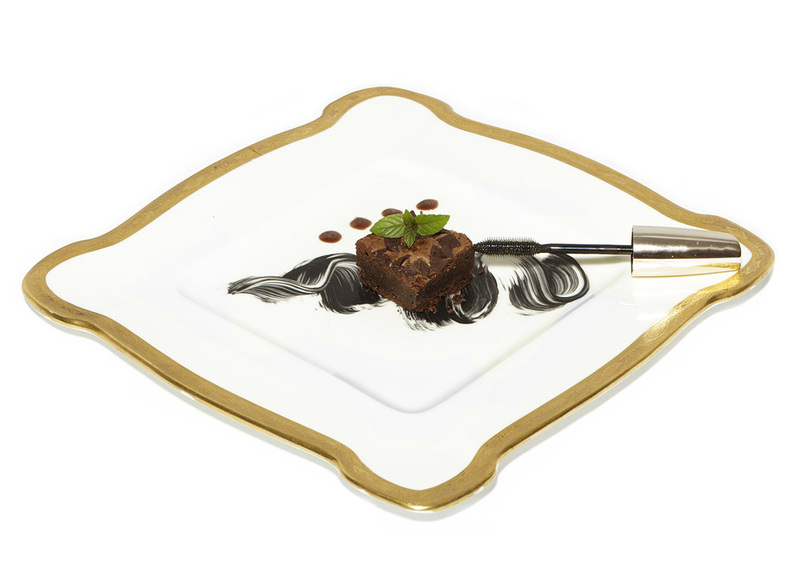 For the gracious guest: any of these pieces would make for a stunning hostess present to thank your hosts for what is sure to be a wonderful and memorable evening. 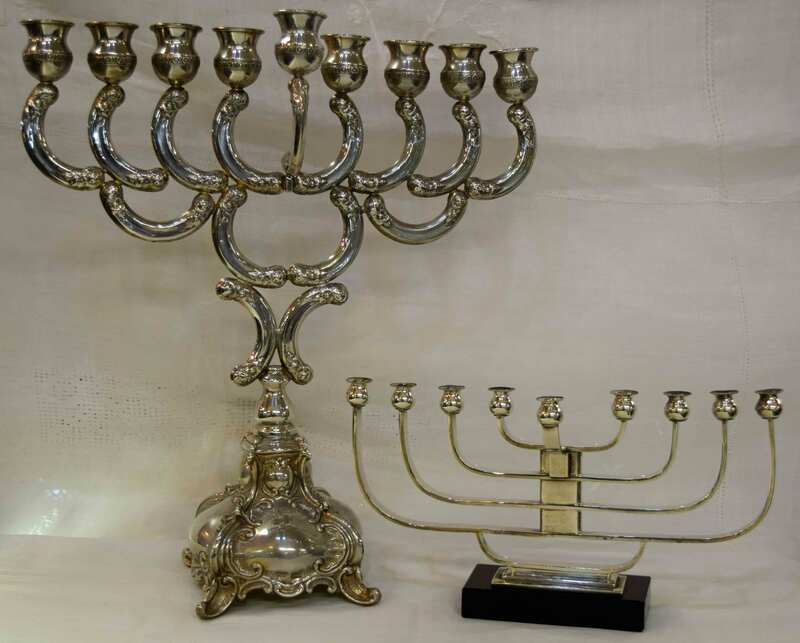 Whatever your dream is for decorating your New Years Eve bash, you'll find unique and timeless pieces to suit your needs at Cynthia Findlay antiques. When you raise a glass this New Years Eve, wow your friends and family with a stunning Classic barware set; and indulge responsibly. May the New Year bring you Happiness, Friendship and Love! As the Snow glistens in the lanes and shoppers rush home with their treasures, you may find yourself stuck wondering what last minute treasures to get for the vintage lover on your list. At Cynthia Findlay's we've compiled a list of some of the most popular gifts this holiday season to help you in your quest. 1. Sterling Wine Coasters. These beautifully crafted coasters not only protect your favorite holiday linens from wayward drips of wine, but also provide a beautiful base in which to dress up the wine bottle that cousin Eddie insists on bringing every year. 2. Tea Strainers and Teacup/Saucer sets. When the weather turns chilly we start to dream of curling up in the evening with a warm cup of tea and a movie or two on Netflix. 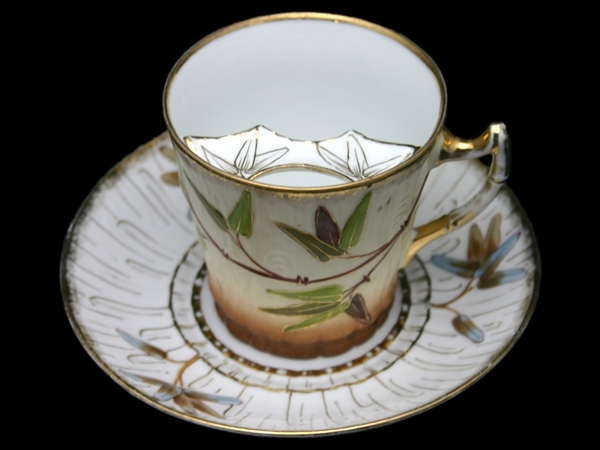 With the growing popularity of tea stores there has been a resurgence of delicious loose leaf tea available in North America. 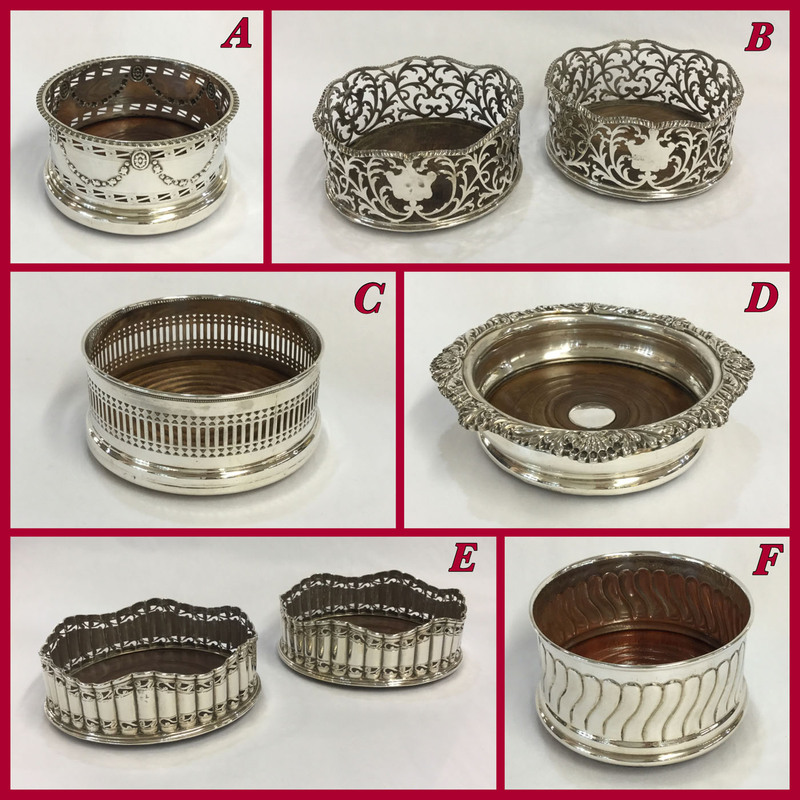 Victorian silver tea strainers make a beautiful and functional gift for the tea lover in your life. These delicate pieces perch on top of your cup while you pour hot water through the leaves and come with a stand to place them on after your tea has steeped. 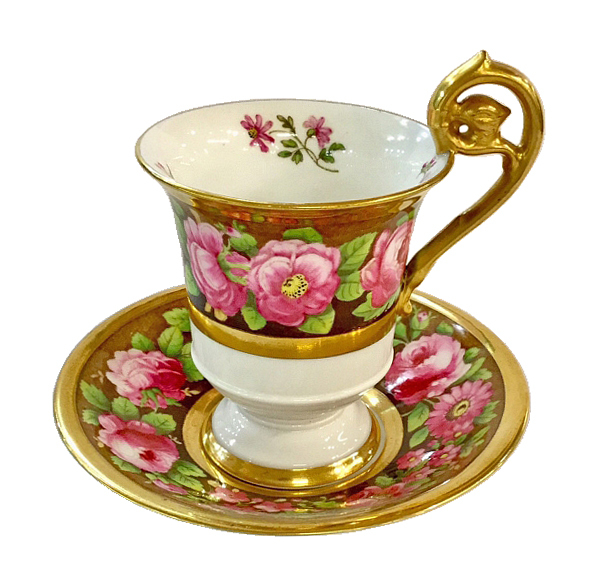 This gift pairs perfectly with a unique footed teacup and saucer set, and makes every cup of tea into a celebration worthy of Downton Abbey. 3. 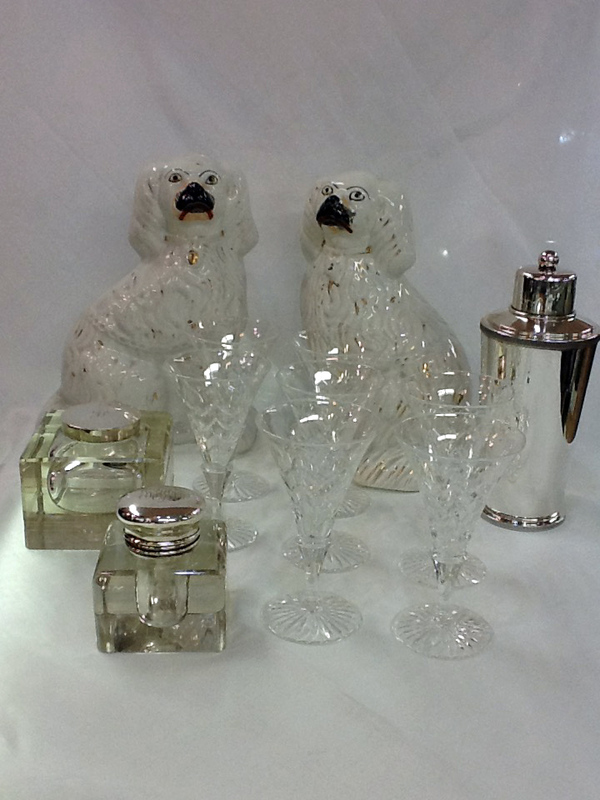 Crystal Decanters. 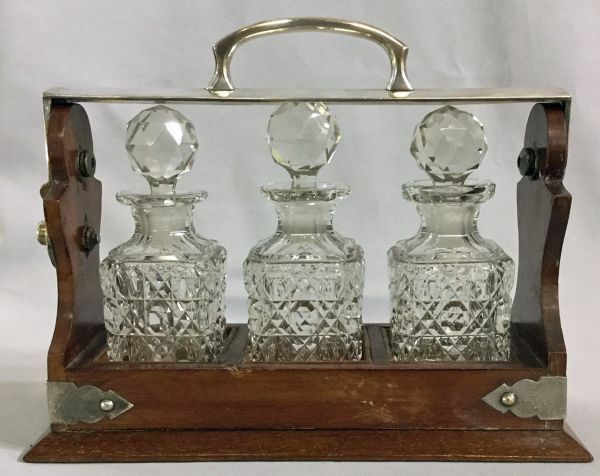 The Classy drinker in your family just 'de-cant' say no to displaying that special bottle of scotch or bourbon in a beautiful cut crystal decanter. The art of shaping and cutting Crystal has slowly fallen away from the talented craftsmen of the past to the factory machines of today. 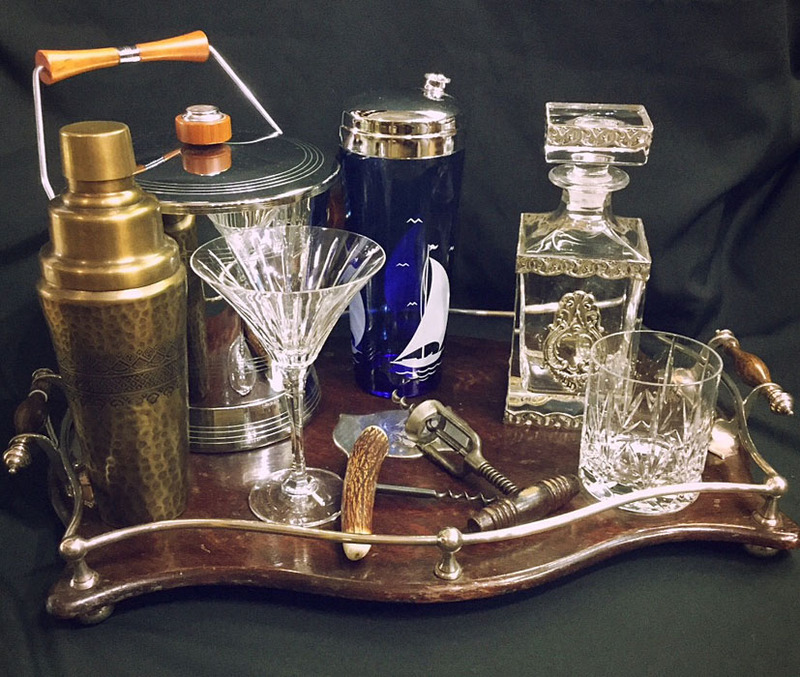 For that true 'Mad Man' feel displayed on a bar cart or nestled on a table among matching rocks glasses it's hard to beat a vintage Crystal decanter. 4. Sterling Silver Pill Boxes. These darling boxes can be used for so much more than just prescription medications and make for a stunning keepsake. 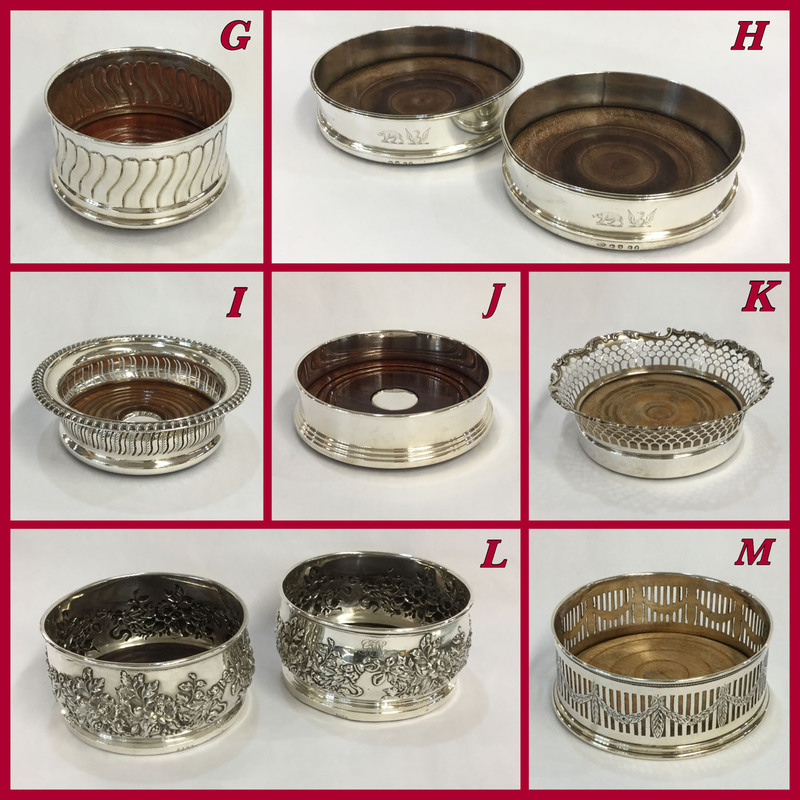 Delicate metalwork adorns the tops of these containers, making them perfect bathroom and bedroom decorations as well as charming storage boxes for small items.- Please visit our shop for a great selection! 5. 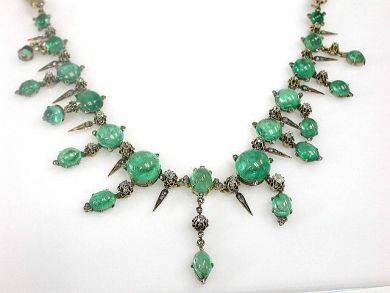 Vintage and Antique Jewelry. 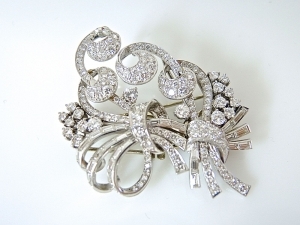 A true classic that will never steer you wrong is a beautiful piece of vintage or antique jewelry. 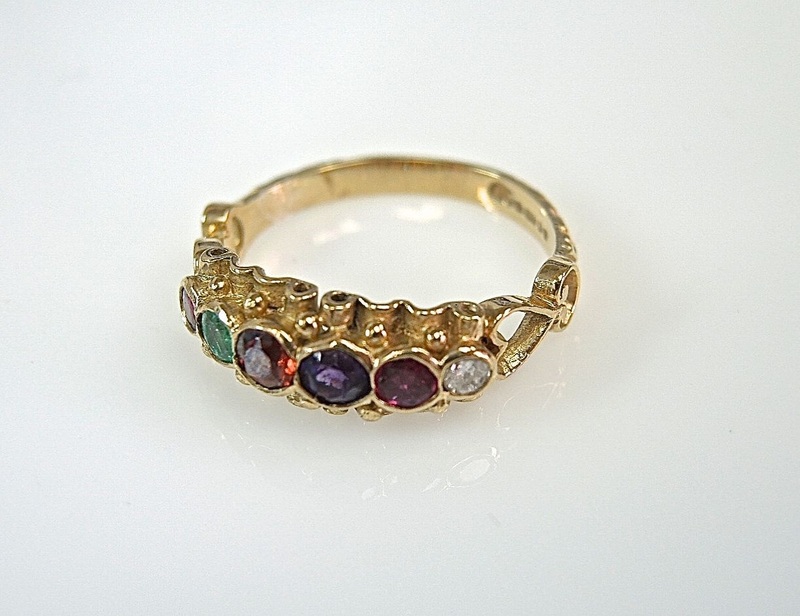 Whether you're hunting for rings, earrings, necklaces, bracelets or brooches we've got you covered with a rainbow of stones in unique vintage and antique settings. Remind that special someone that they are one of a kind with a piece of jewelry as unique and beautiful as they are. Come on in to see us at Cynthia Findlay's and we'll help you to find that one of a kind treasure to surprise the vintage lover on your list! 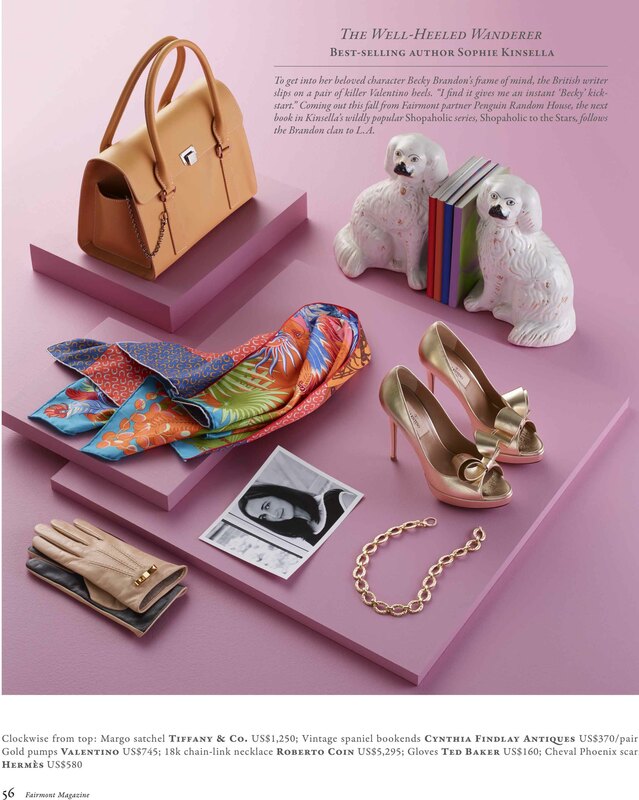 Check out how Dauphine Magazine featured some of our items in their latest issue. Click here to visit there site www.dauphinemagazine.com. As seen in Post City and Canadian Antiques & Vintage magazines this fall. 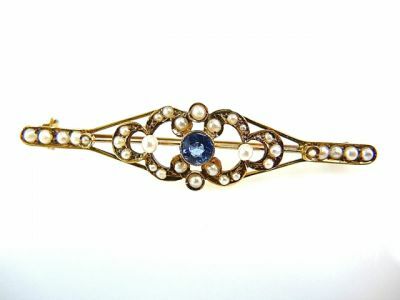 Deco Sapphire Bracelet or a Lovely Antique Sapphire Necklace! 'Oh the summer night, has a smile of light, and she sits on a Sapphire throne' - Bryan Procter. them incredibly durable as well as exceptionally breathtaking. modern brides craving a refreshing, vibrant shade in antique engagement rings. reminder to eventually follow their stars home. attract heavenly blessings, guard chastity and aid in promoting peace with one's enemies. 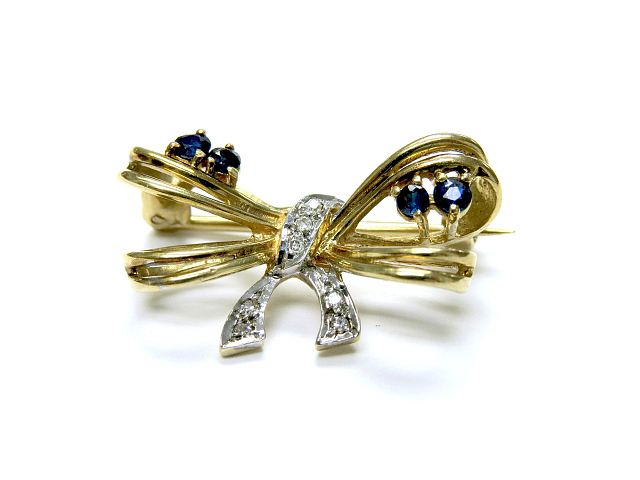 Royalty and Romance have long been closely tied to the rich, enticing blues of the sapphire. 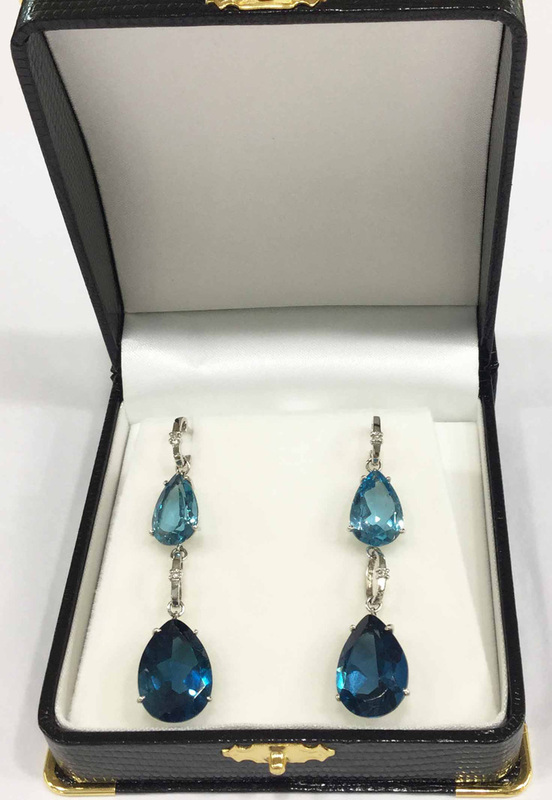 gift the 'Something old' and 'Something Blue' item that will bring a bride luck on her wedding day. will swoon into your arms. Isn't it about time for your own happily ever after to begin? that September occasion, that special someone or even a treat for yourself! 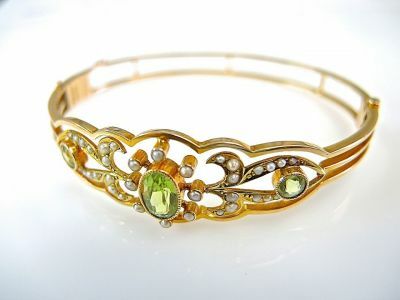 Shopping for Antique or Vintage Peridot Jewellery? this brief post on what makes peridot so saught after. 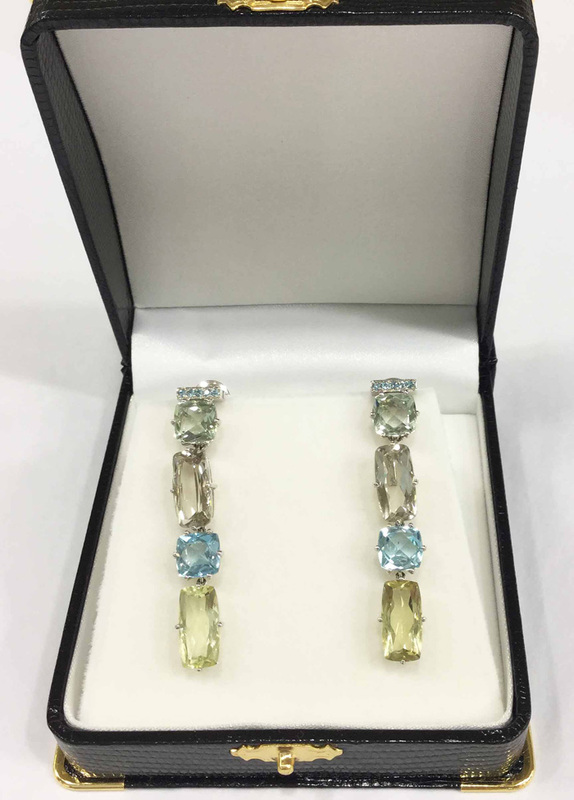 birthstone was once known as the 'Gem of the Sun' for the glowing golden tones of its green. find themselves in good company with a rich and interesting cast of characters. Chrysolite from the Greek for 'gold stone'. green peridot in meteorites be where the rumours of 'little green men' started? lines for its vibrant, golden-green tones. that some legends were made to be followed. 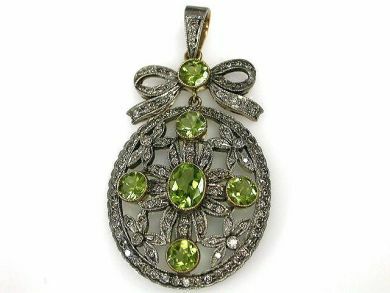 beautiful Peridot pendants, earrings and rings at Cynthia Findlay Antiques. 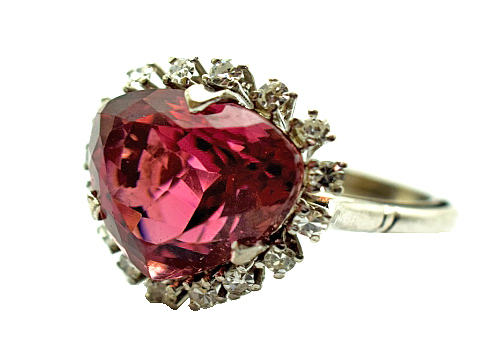 Find Out What Makes Rubies In Antique and Vintage Jewellery So Special! natural shades from deep pink to Crimson. recognized as rubies are identified as sapphires which means rubies claim the only true red hues in the family. they are very difficult to scratch or chip. was the key to conquering love all along! precious stones'. Hindu writings claim that those who offer rubies to the temples of the gods will be reborn as emperors. 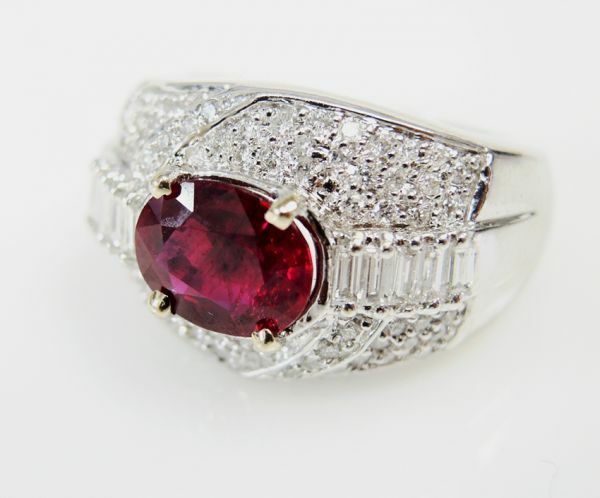 In Europe during the Middle Ages the royalty wore rubies as coronation rings to symbolize their wealth and power. of passionate, unbridled love. Their crimson shades promote thoughts of power, vitality and love soaked sensuality. unique stone that she can proudly wear for all the long years of your happily ever after. 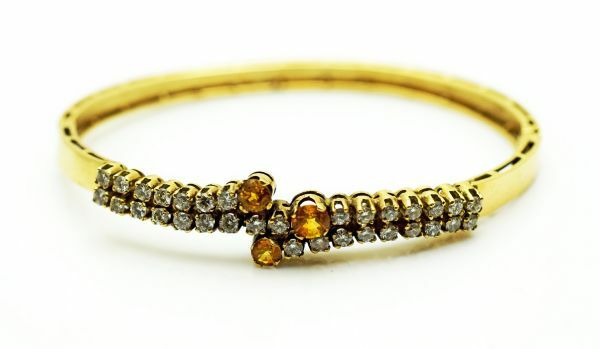 love with a Vintage bracelet that honours a lifetime of joy and passion with a story of its own to complement yours. store at 284 King St W.
Father's Day is almost upon us. That one day a year when we recognize and celebrate the men in our lives who helped to raise us. (biological or not) and they deserve to be celebrated not just on the Third Sunday in June but every day. and intriguing, or as steady and sturdy as the man of the hour. in his pocket at any given time, but he could probably use a nicer place to store them than the worn old wallet in his back pocket. or folded edges from poor storage. For the quirky, mustachio'd fathers out there why not try something out of the box to keep that manly lip jacket dry while drinking? moustache with every sip of coffee, tea or even cappuccino. At the end of a long day providing for the household your dad may enjoy a cocktail or a good scotch as he relaxes with his family. unique ice bucket. For the wine aficionado vintage corkscrews are a whimsical and practical way to celebrate a great bottle of red or white. wedding? 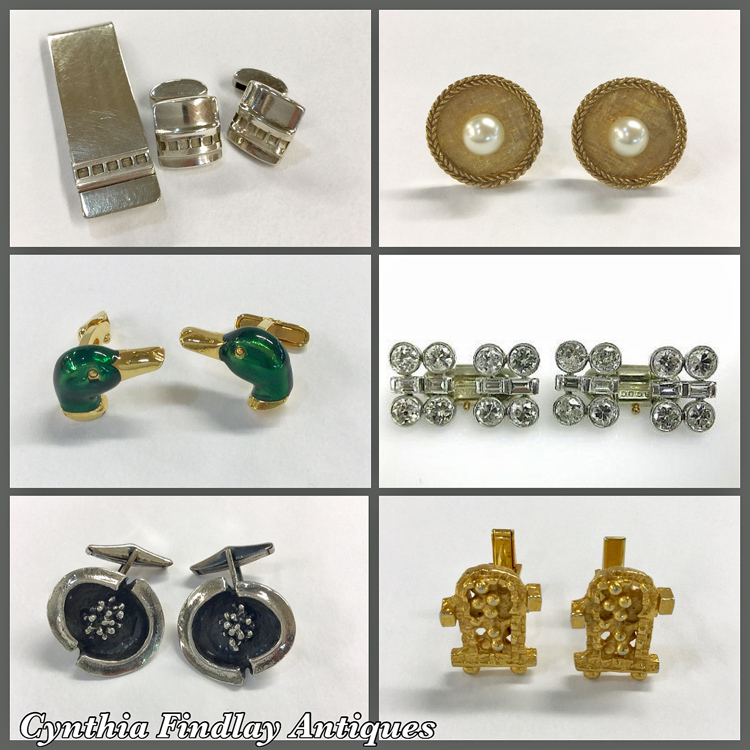 A perfect Father's Day gift that will carry meaning forward to each of these special occasions is a pair of unique cuff links. makes snappy dressing an every day occurrence. presents. And to all the Wonderful Dads out there: Happy Father's Day! Alexandrite stone and the lesser claimed Moonstone. 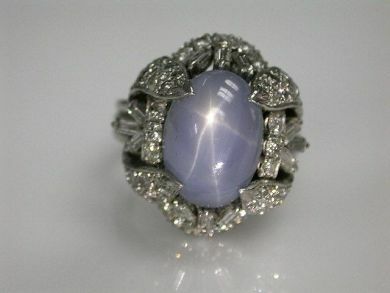 is rarely found in modern jewelry because of the stone's scarcity. of an artist encapsulated in a single stone. healing properties. Dreamers and lovers can find a perfect match in a piece of Moonstone jewellery. are one of a kind, and utterly irreplaceable in your life! mussel which becomes the Center of a Pearl. 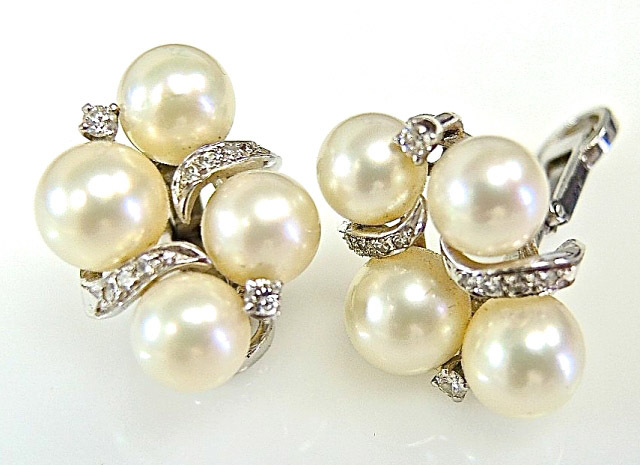 and protect those radiant, classic pearls. 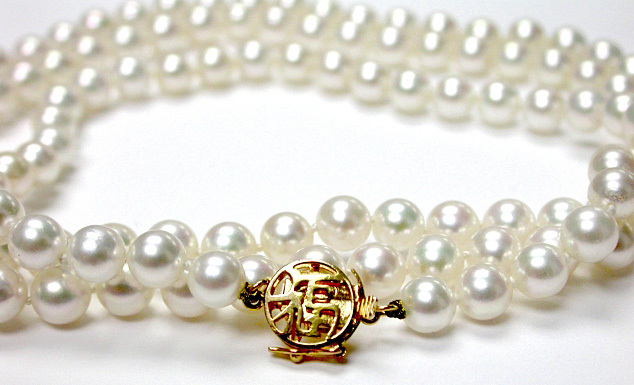 As written in People & Pearls: The Magic Endures; 'When a woman wears pearls, it is she who shines. but they can still gracefully take a backstage role to the beauty of the woman wearing them. 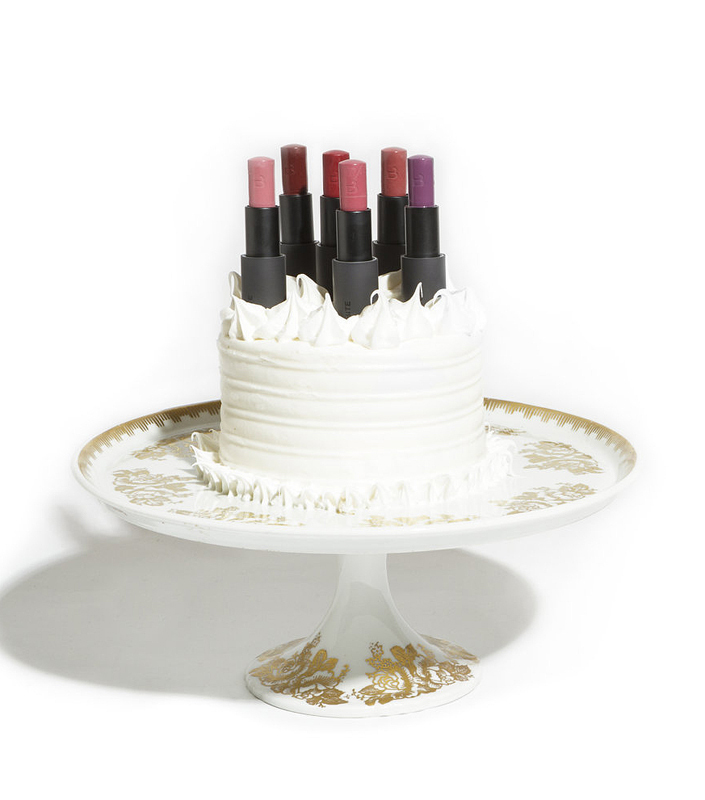 of the perfect gift tucked away for that special June Event! Time has flown, it's moved too fast and now your baby's classes are past. June marks the end of the Educational journey of both Secondary and Post secondary students. timeless options just perfect for the New Graduate in your life! historical pieces can't be modernized?). inspirational message that will always be treasured. with that one of a kind present that you're searching for. Spring shades of Green. 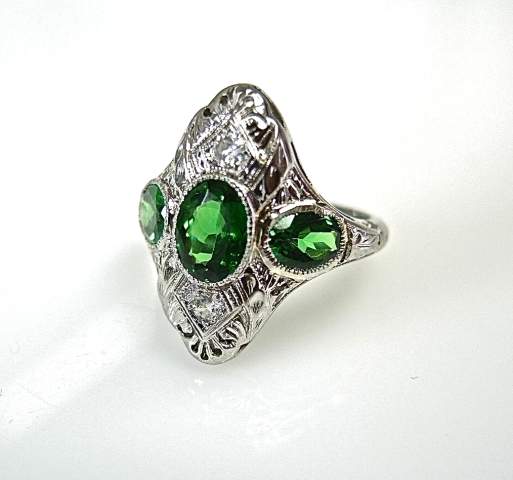 Emerald rings are historically tied to Ancient Greek and Roman goddesses of Love and passion. 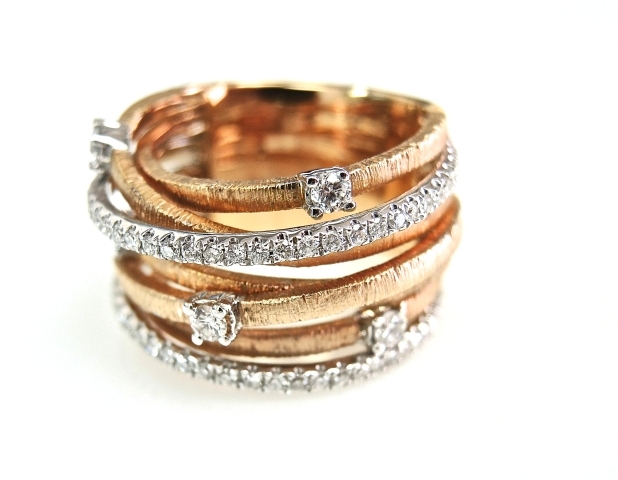 What woman wouldn't love a ring whose history places her among the likes of Venus or Aphrodite? 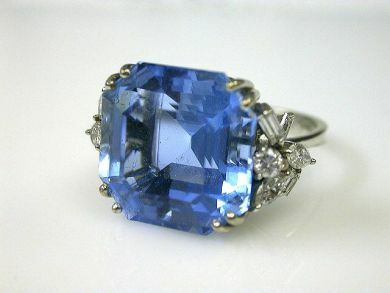 Era (1835-1900) it became popular to wear your birthstone as the center stone of your engagement ring. Before May "Two-Four"
sported a particularly unique serpent and Emerald ring as her engagement band. these flaws and temperaments that make Emeralds so Unique and valuable! 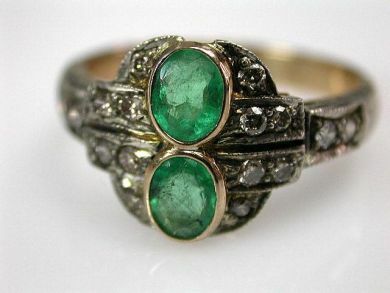 Antique, Vintage and jaw dropping Emerald rings and jewelley that makes a perfect gift for that Someone special! For the full story please visit our press page by following this link. We do have other pieces in this pattern. Please contact us for stock available. 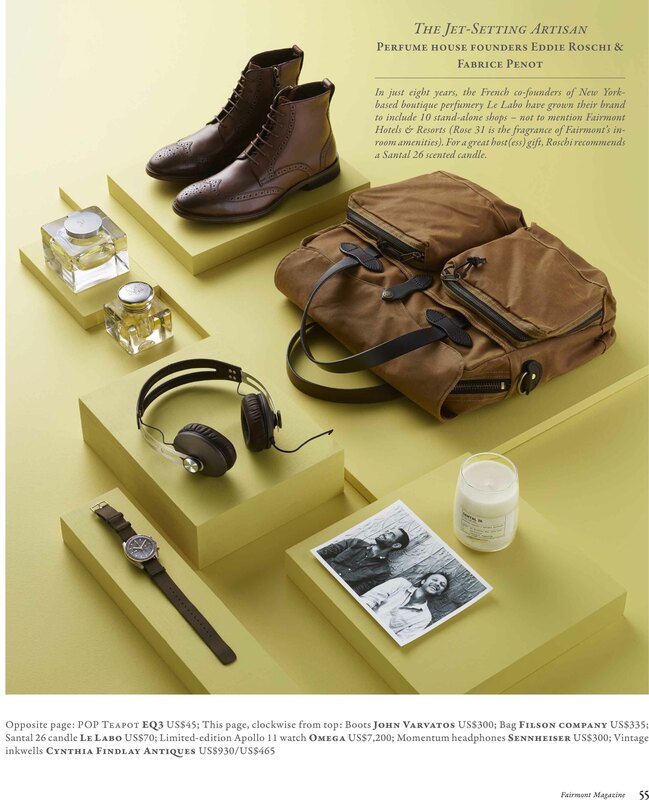 Discover these great gift ideas for him! 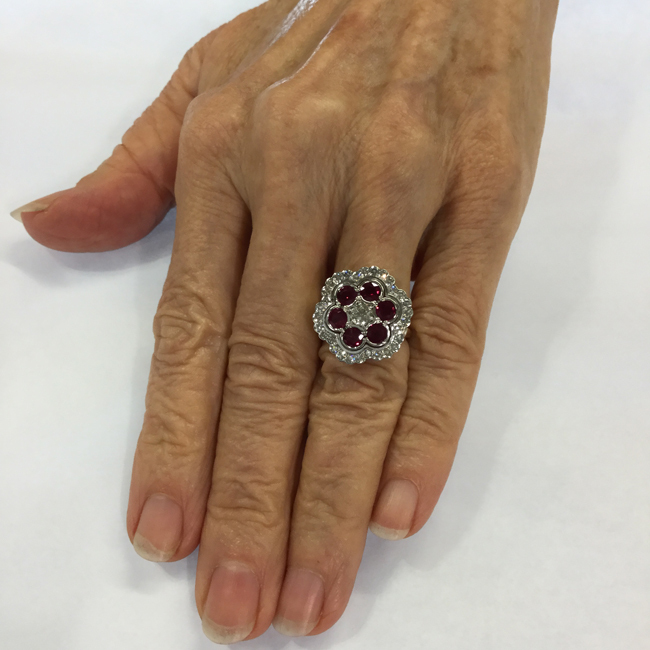 found the design and style of ring with the rubies she dreamed of, she now knew exactly what she was looking for. 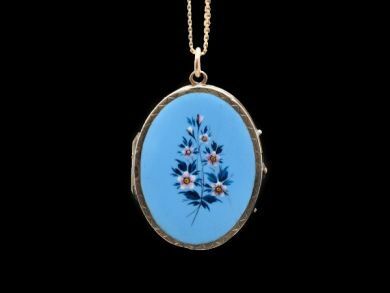 “one place she could think of that had such an array of rings,” Cynthia Findlay Antiques. us was that she had just seen it the night before on theAntiques Roadshow. foundthe ring. Gloria was thrilled. of having a ring made,” but that is just what she did. Do you have a dream ring we can make for you? 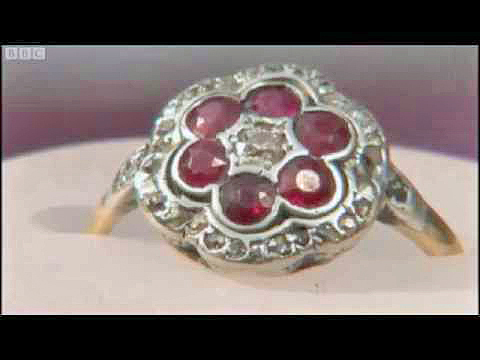 Here is the ring Gloria saw on theBritish Antiques Roadshow, Series 33, Episode 8 (#3308). 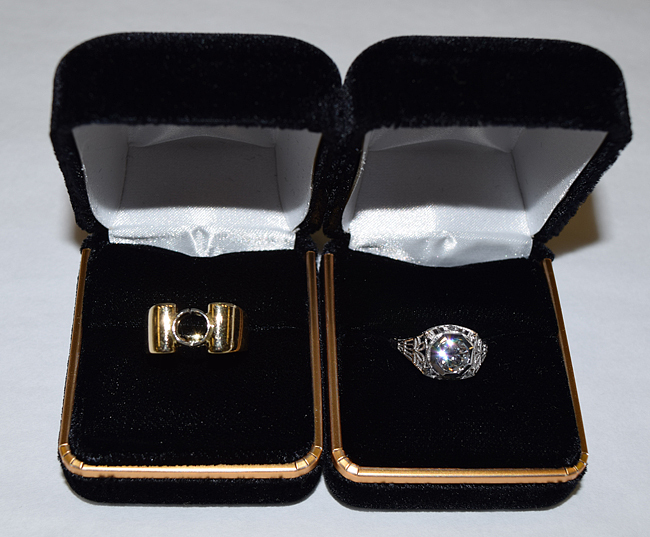 Here is a photo of the ring we made for Gloria. Here are a few photos of Gloria wearing her ring. rings say toi et moi together forever always. One toi et moi platinum art deco ring C.1925. One princess cut diamond (0.45 carats: VS1 clarity: F-G colour). One sapphire (0.60 carats). The ring has hand engraved scroll design. 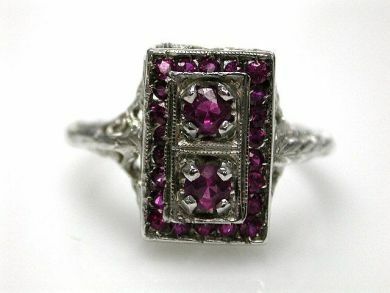 One toi et moi 18 karat white gold Art Deco C.1925 pink sapphire ring with filigree work. Two pink sapphires (0.20 carats). Twenty-two round brilliant cut pink sapphires (0.35 carats). (0.24 carats: SI clarity: K-M colour). 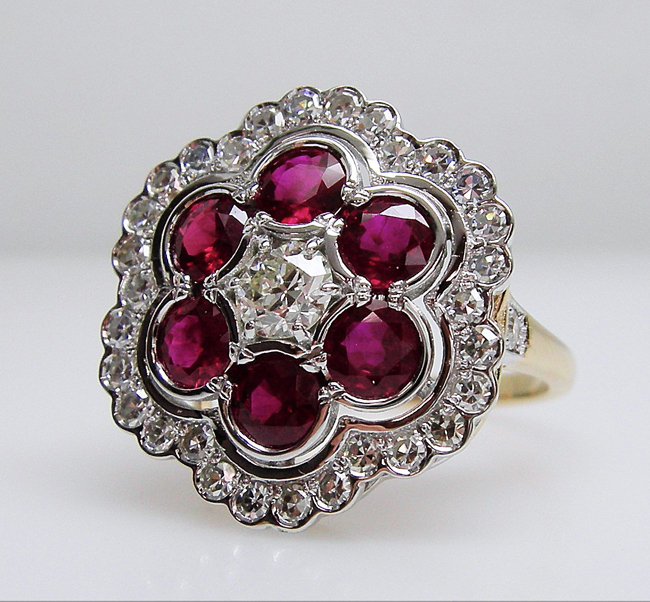 One toi et moi 14 karat white gold ruby and pearl Edwardian ring C.1915. One ruby (0.79 carats). One natural pearl. est. 0.18ct (clarity: I1 & G-H colour). 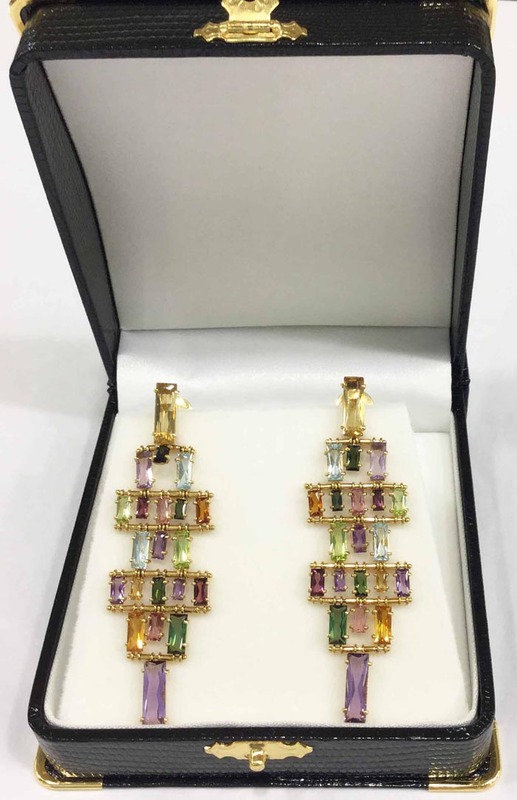 & F-G colour) and 8 single cut diamonds, est. 0.07ct (clarity: SI-I1 & G-H colour). 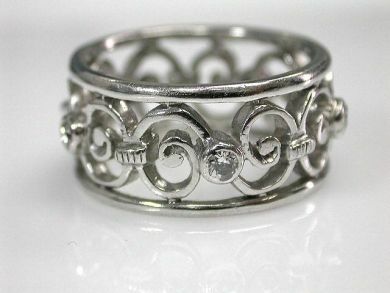 One vintage C.1920s toi et moi platinum diamond ring. Two old Euroepan cut diamonds (0.71 carats: I1 clarity: I-J colour). 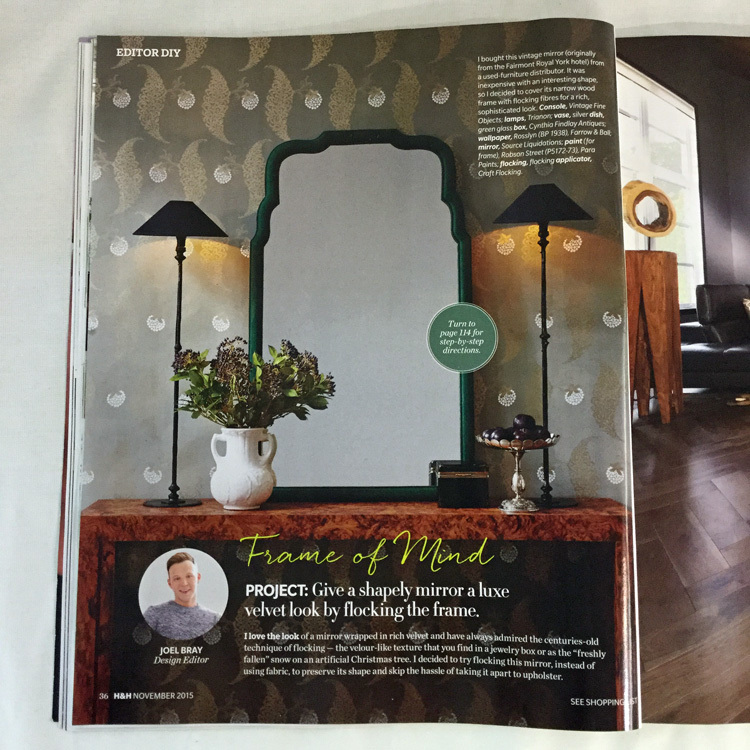 (page 114House & Home November 2015). and decorative objects and would be happy to help you with all your styling needs. “cigar bands to make a major comeback” this fall. 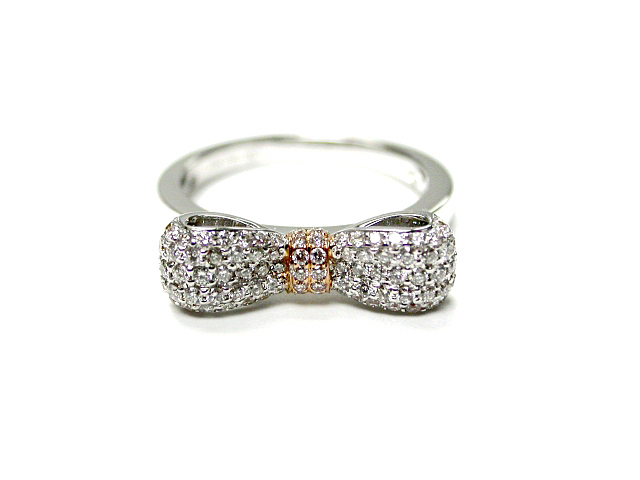 Similar in shape to the paper band of a cigar, the Late Victorian era cigar band ring was the new fashion of the day. Victorian examples were often enriched with hand carved designs of repeating panels and or motifs. an elegant yet distinct fabulous fall look. all Hannibal Fannibals to drop by for a visit. 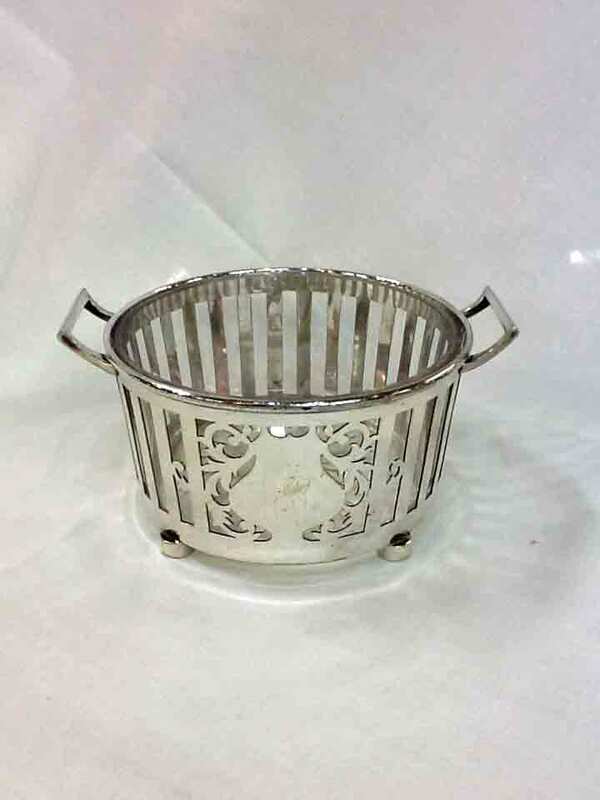 Get organized and empty your pockets Hannibal style with this Art Deco Tusk Handled Silver Plate Vide-Poche! 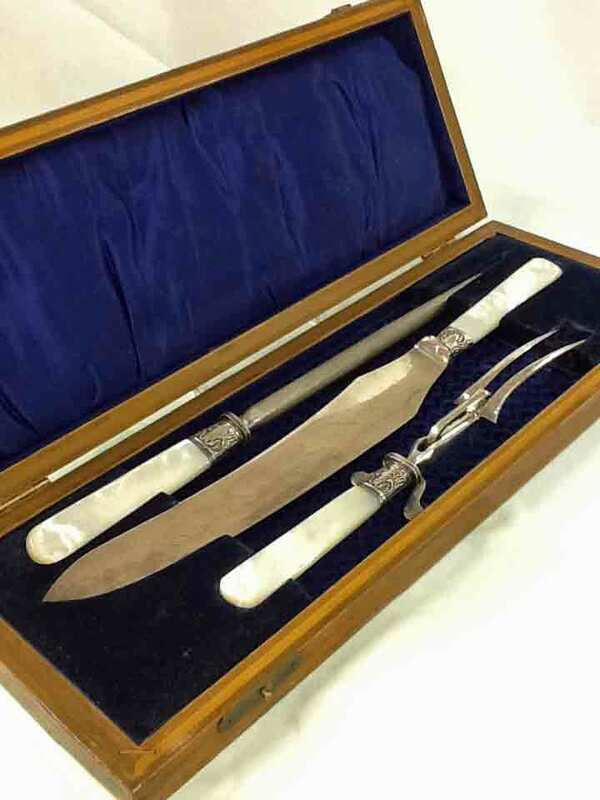 Click here for the amazing props we have rented to all three seasons of Hannibal that are still available for sale. 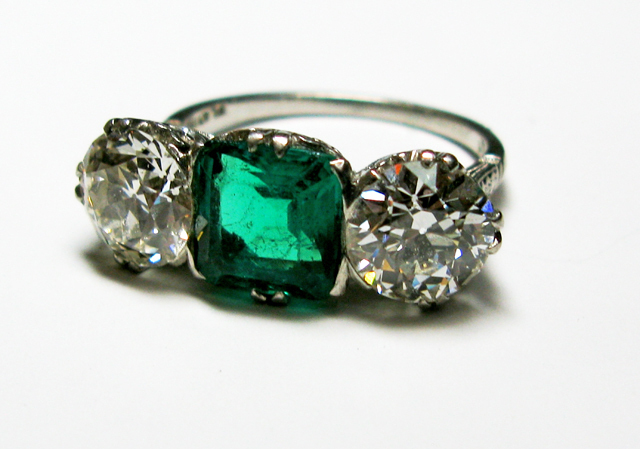 So What Really Is The Difference Between Antique and Vintage Engagement Rings? The terms antique engagement rings and vintage engagement rings often get used and interpreted synonymously. 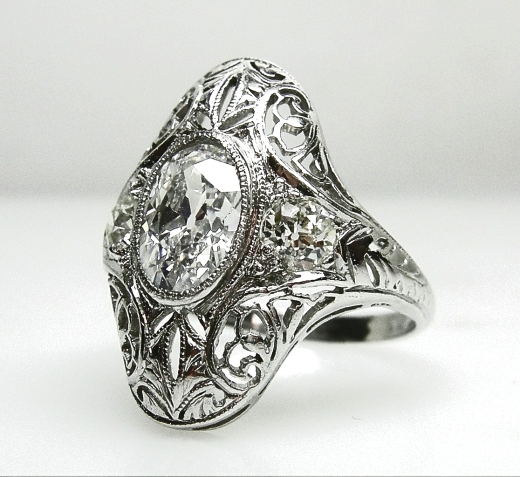 an antique engagement ring.The term vintage has recently been used to refer to costume jewellery and items pre-1970. especially people under 40. When people use the terms interchangeably they are really just generalizing the older styles. 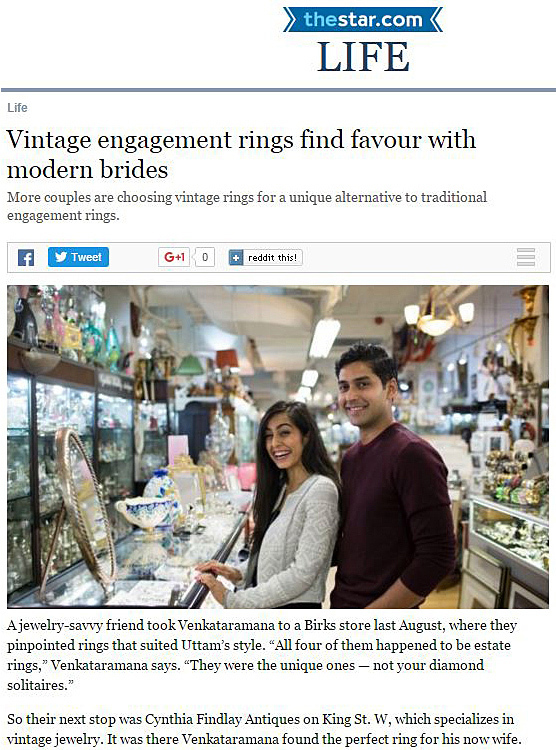 shopperof today, particularly in 2015, could get away with calling either engagement ring antique or vintage. 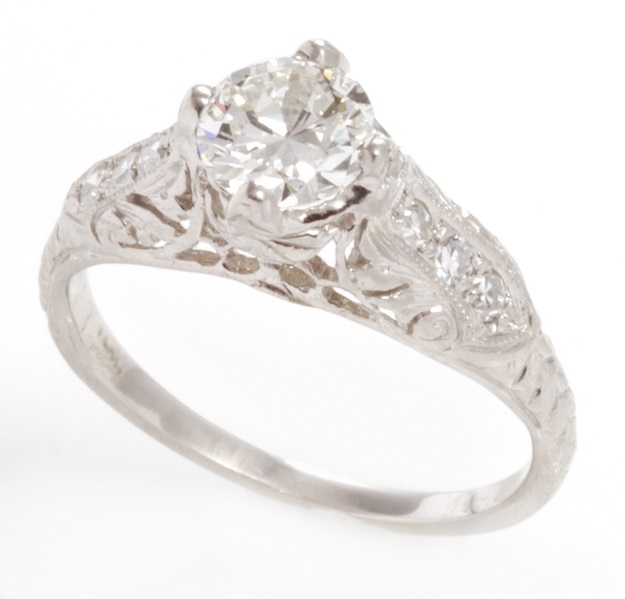 the new trend in antique inspired engagement rings and vintage inspired engagement rings soon. We are very pleased to be nominated for NOW's Readers Choice Toronto's Best Jewellery Store. If you could please take a quick second to vote for us as Toronto's Best Jewellery Store by clicking the banner that would be awesome! and compliment Hannibal’s rich and complex personality. From the elaborate grandeur of this Victorian Sphinx Silver Plate Centrepiece . . .
To the regal intensity of Limoges’ Acid Etched and Cobalt Blue Dinner Service, C.1920 . 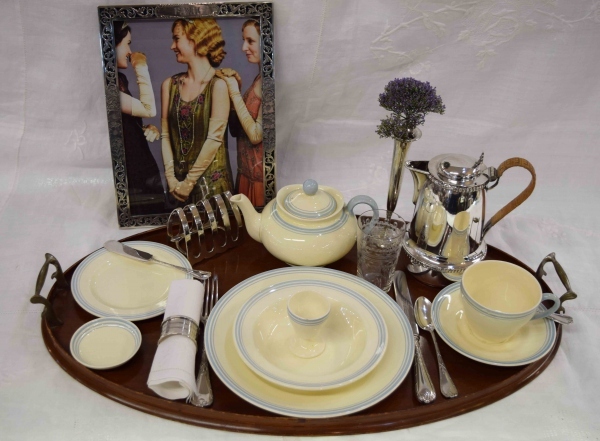 . .
To the cool clean aesthetic of this Art Deco Tea Set . . .
Queen Victoria's engagement ring was a snake with a emerald set-head, symbolizing eternal love and her birthstone for the month of May. Click the link for more information on this 14 karat yellow gold and rhodium plated snake ring. At first glance it looks like beeds to make vintage amber jewellery, and is often mistaken for vintage amber. nitially our appraisers as we bought it to make vintage amber jewellery. Just wanted to give everyone a heads up to be careful! Neighbourhood News - 3 Fun Things To See In The Entertainment District of Toronto! The Entertainment District is that other play on right now... "Titanic The Musical"
Tommy shows you what he means by “Fabulous Flatware” with pieces from Cynthia Findlay Antiques. Breakfast in bed . . .
Or, with a gift to hold her favourite tea . 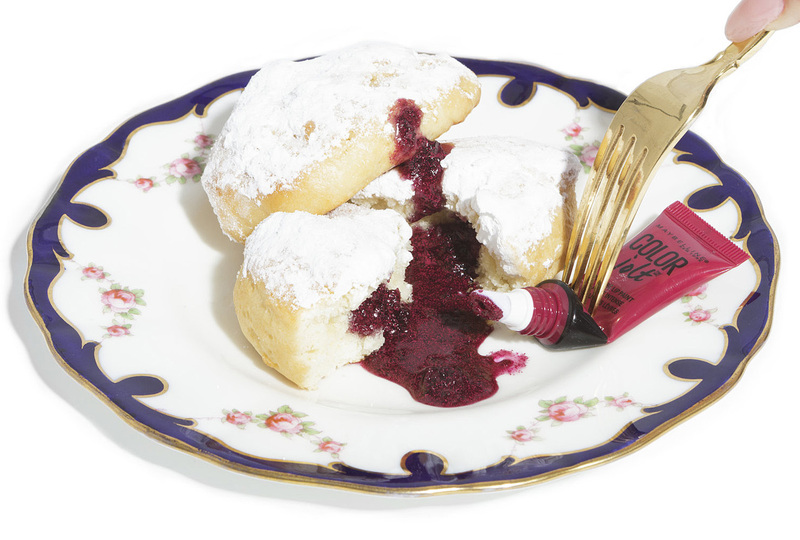 . .
Or, with a neat and interesting sugar bowl . . .
Frame family memories for mom in a beautiful silver frame . 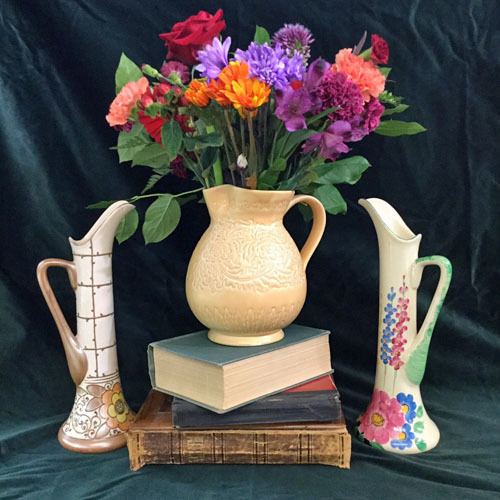 . .
Find the perfect silver vase to hold flowers . 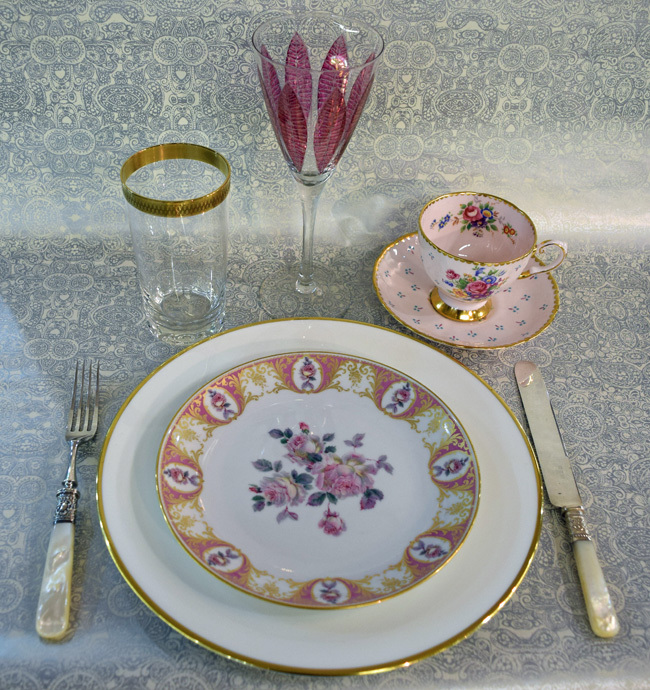 . .
Or, give the perpetual gift of flowers with something in chintz . 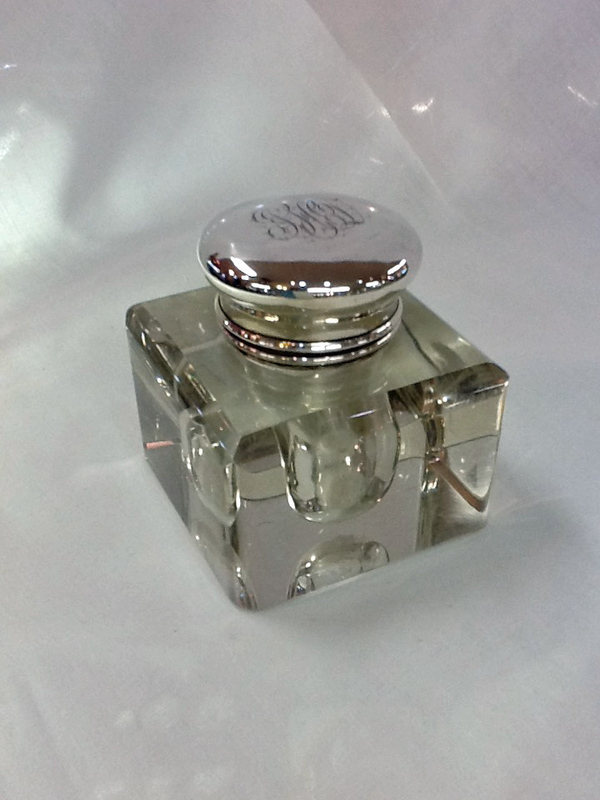 . .
We look forward to helping you online or in person with gift ideas for Mother’s Day. as mirrors, dresses, phone sleeves, and jewellery (The Globe and Mail, Saturday, April 25, 2015). personal and collective so long as we remain. 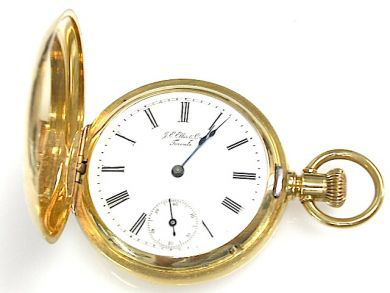 This Mother’s Day symbolize the gift of time with abeautiful antiqueor vintage silver clock. saucers as well as tea and coffee sets. Or, this Mother’s Day, celebrate mother with an exquisite, time-honoured,unique piece of jewellery. When a prop stylist borrows vintage and antique pieces this is what’s possible! or the English eighteenth-century term, ormolu, refers to bronze which is gilded with gold. The French term, bronze doré, refers to the same process. 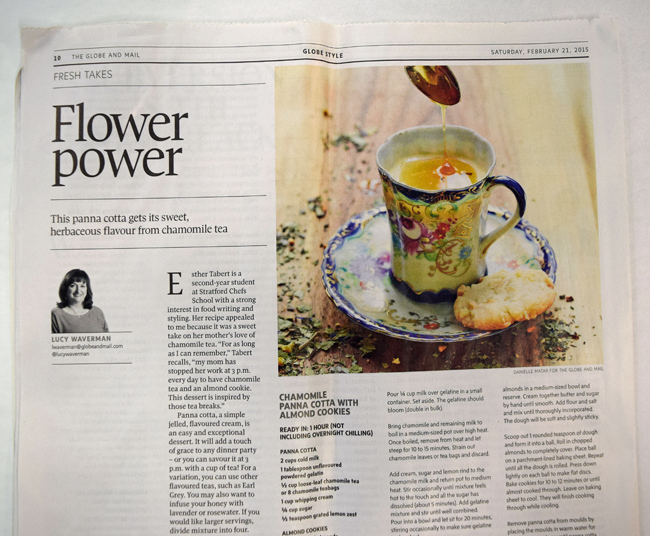 her if she could talk about her “Easter made Easy” feature inCanadian Living, April 2015 (pages 94-101). pattern flatware for her Easter table setting. or help you find the pieces you have been looking for. Please contact us for prices. set and want to finish it, or if you don’t know what your set is called we can also pattern match. the shop, we would be pleased to help. 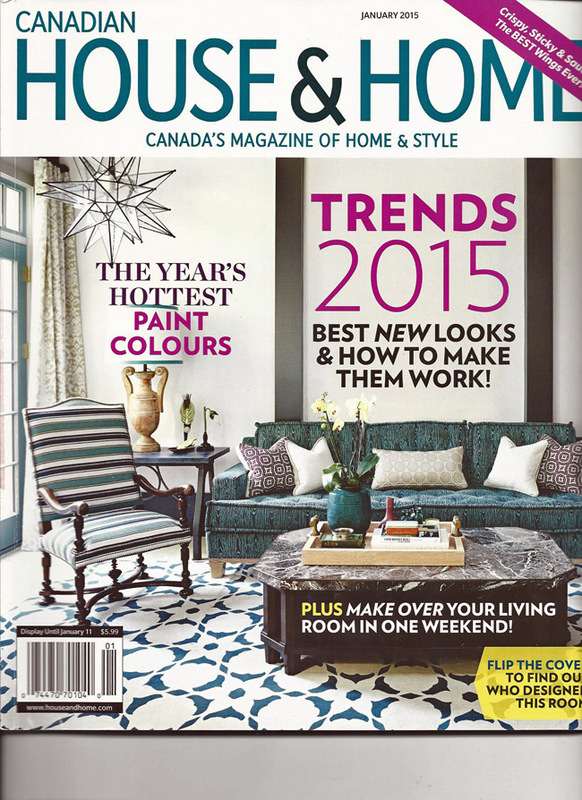 We are very pleased to be part ofstyleathome’s special cottage issue. 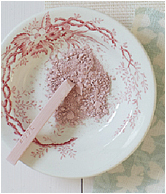 A small pink transferware dish helps to create the cottage-style palette (10). pastels andflorals to create a “cottage-style shelfor table” (38-39). andsuggests“bright” pops of colour one way to create a “cottage-style home” look (64-65). Tether a butterfly to your love! 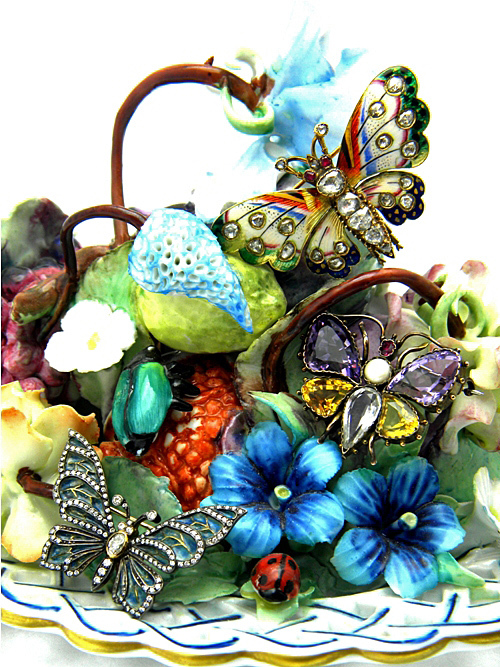 To see some more fine examples of butterfly jewellery and pieces click here. The Best of Toronto Shopping! 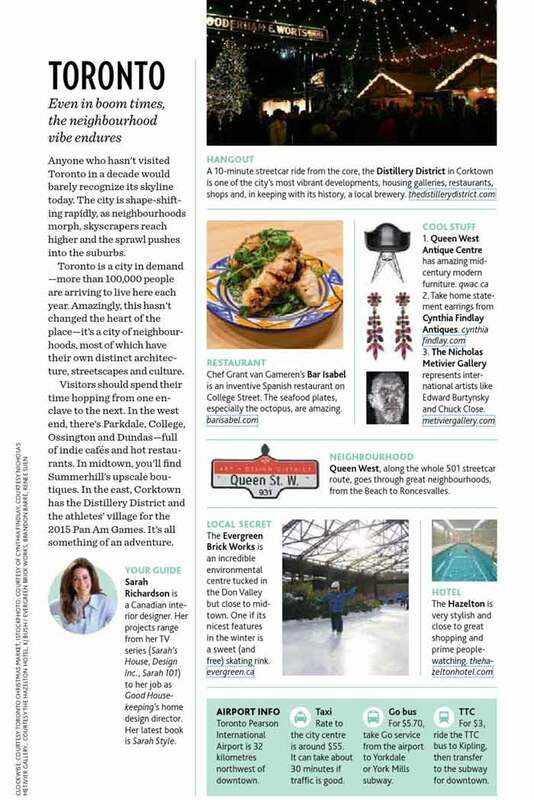 Entertainment District section (see page 69). 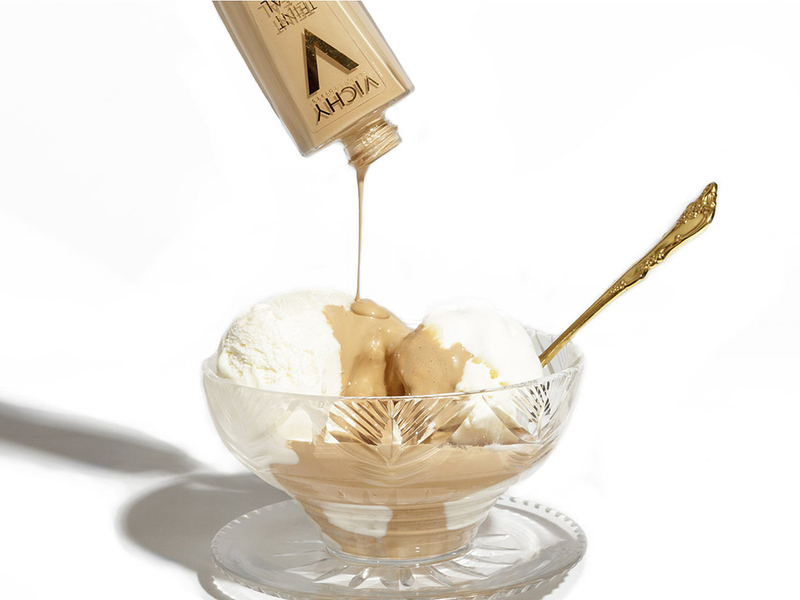 Whether you are looking for an exceptional colour . . .
Or imagine soothing tired feet, Victorian style . . .
Or just want to say, I love you . 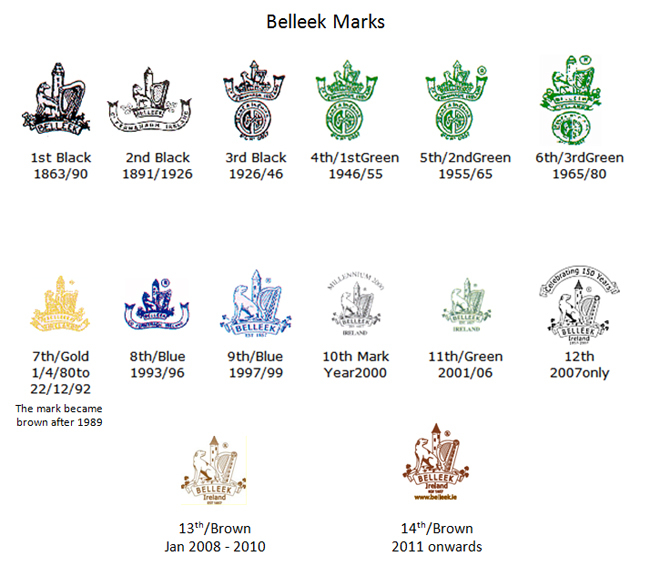 . .
as the Belleek Pottery Ltd.
craftsmanshipthe Belleek Pottery Ltd. is known for. Here are a few teapots from our extensive collection of Belleek. Step 1 - Grandmother supplied the diamond . . . Step 2 - Groom found the design that he liked . . . 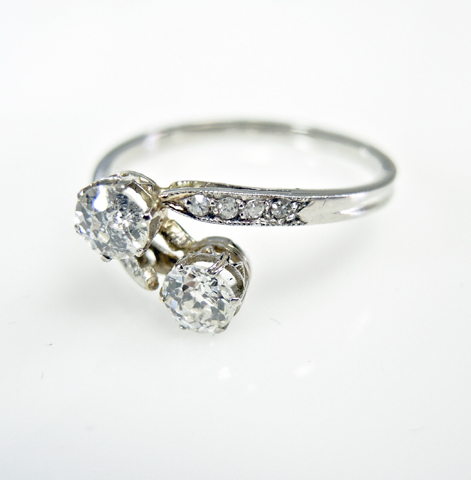 Step 3 - We made this stunning White Gold Diamond Solitaire Ring. Using antiques in new ways is an inventive way to use family heirlooms while illuminating our link to the past. 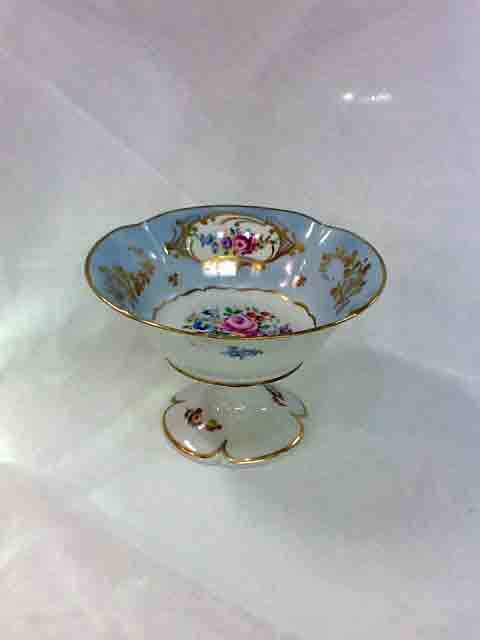 If you are looking for Royal Nippon, antique porcelain, or inspiring and novel ways to use antiques we can help. Link to Odessa’s article, click here. Odessa inspires us to enchant you with the stars and crescent moons in the shop. The Wonderful Tommy Smythe Creates a Delightful “Early Spring” Table-Scape From Our Shop! Click the link below to watch the show. 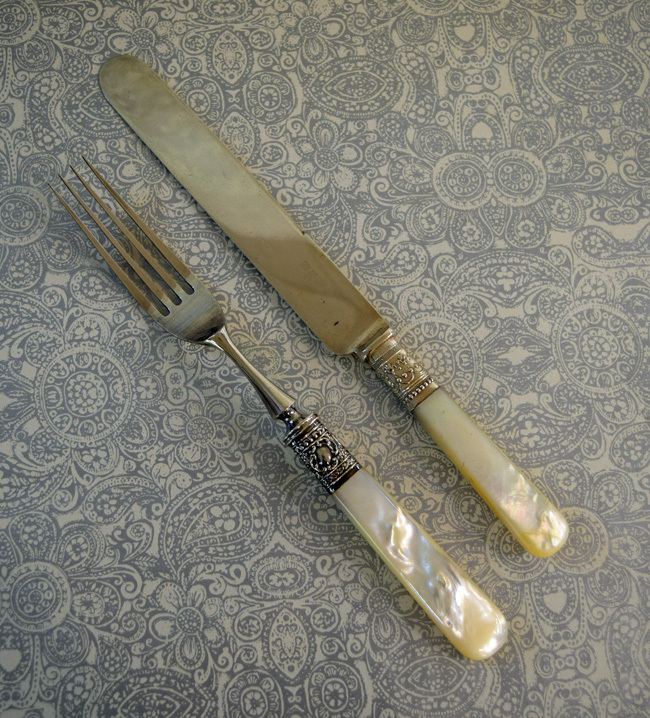 Mother of Pearl Handled Knives and Forks complete the place setting. Thank you Tommy. We love your visits and your style. It’s “early spring” whenever you stop by. 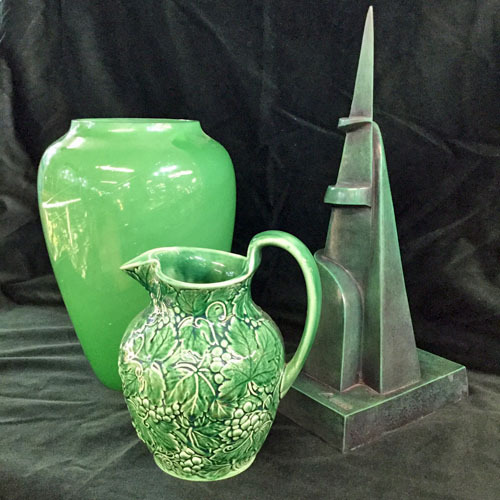 withaccent pieces from Cynthia Findlay Antiques. Lynda uses amber glass to accentBlue Coal, Valspar Paint. Lynda selects a French Opaline Turquoise Box to accentFlamenco, Benjamin Moore. perfect accent forWet Rock, Para Paints. Lynda points to these Jadite Boxes to accentPink Ground, Farrow & Ball. 2015 on Cityline, The Marilyn Denis Show and H&H Online TV. 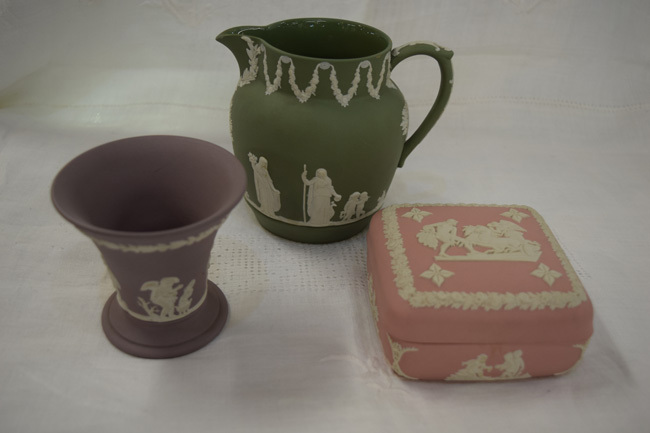 Wedgwood Jasperware from Cynthia Findlay Antiques to illustrate the trend. Click this link to watch her show. 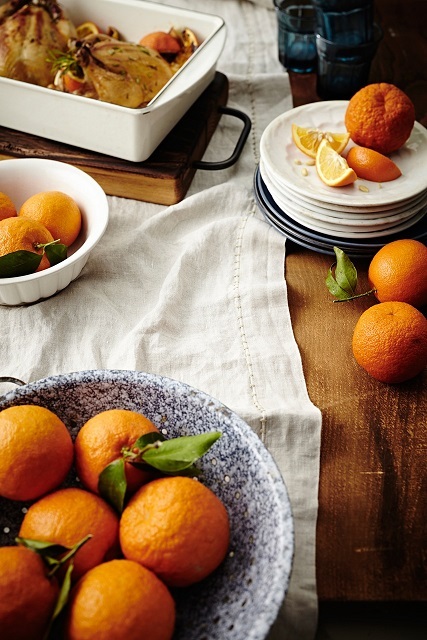 Wedgwood Jasperware as seen on Cityline & The Marilyn Denis Show. Click this link to watch the show. 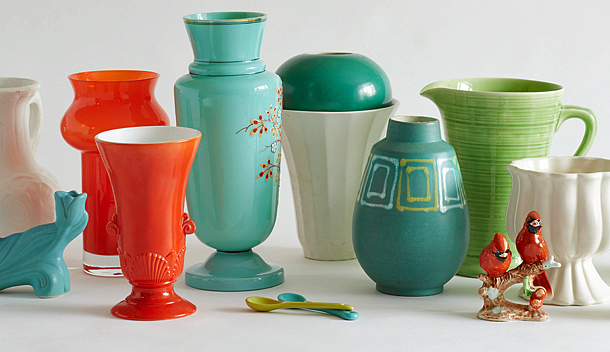 Vintage Wedgwood Jasperware: as seen on H&H Online TV. 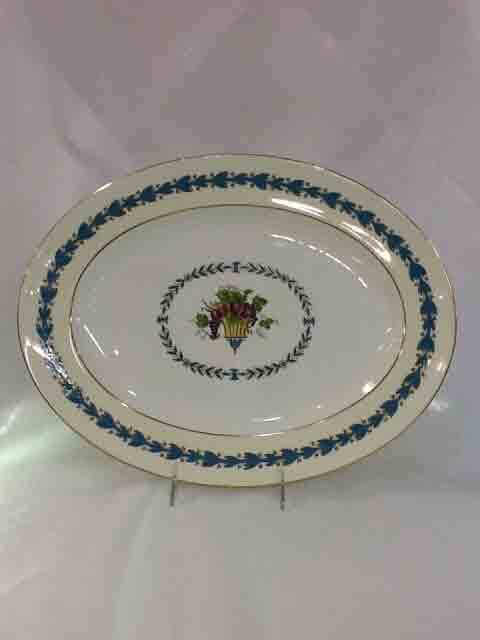 Choose from our wonderful collection of vintage Wedgwood Jasperware. 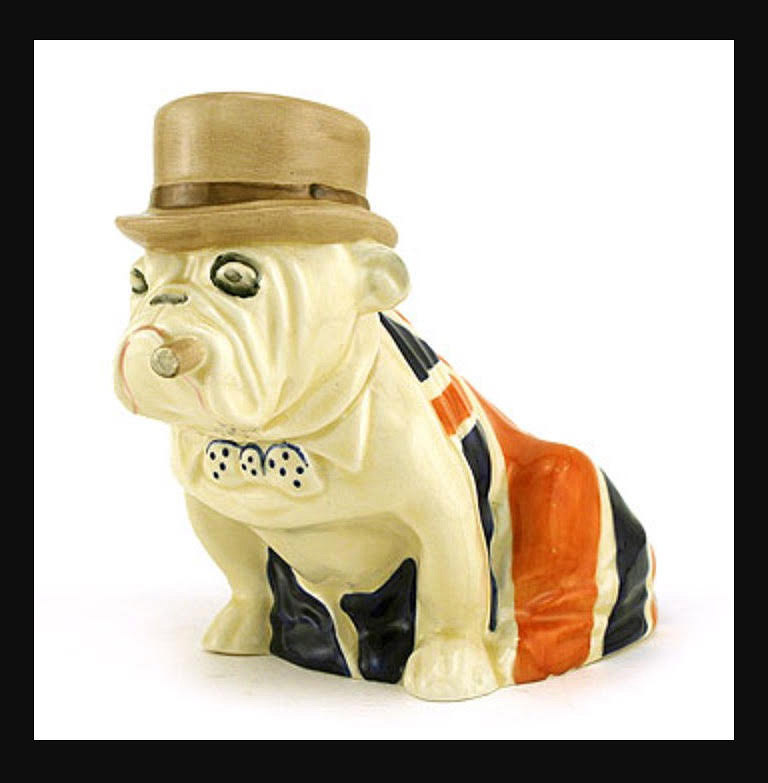 Begin to create your very own British Eclectic look. Design a sunroom around this elegant Emilio Martelli Scagliola “Shells” coffee table. 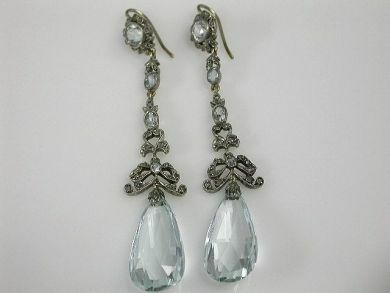 Sarah Richardson suggests, “Take home statement earrings from Cynthia Findlay Antiques” (AWAY 55). 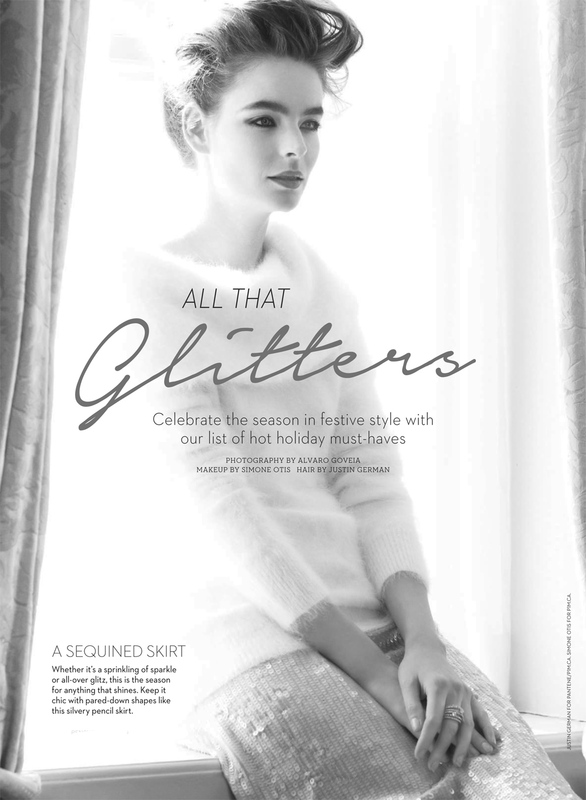 The premier issue of Toronto Pearson’s AWAY magazine, Winter 2015. 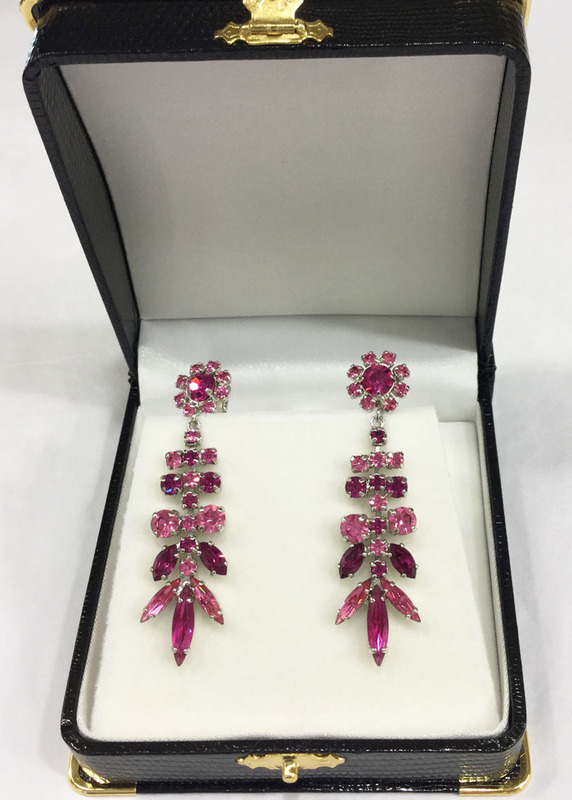 Sarah chooses a pair of vibrant vintage Sherman Crystal Earrings in hues of rich pink. Visit Toronto Pearson’s AWAY magazine. 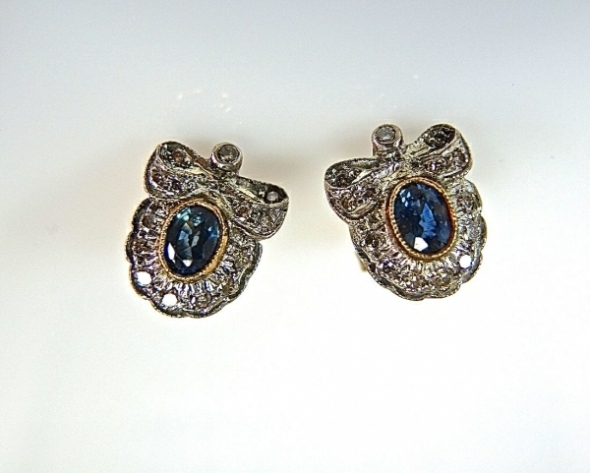 More great contemporary and vintage earrings for stylish local and international travellers. 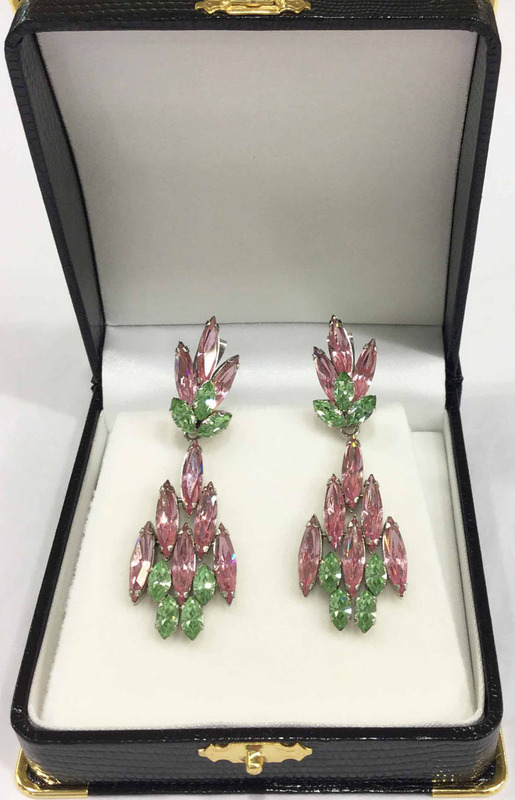 $3,800.00 - For more information and to buy these earrings online click here. collection of silver picture frames and display your digital photos with distinction. 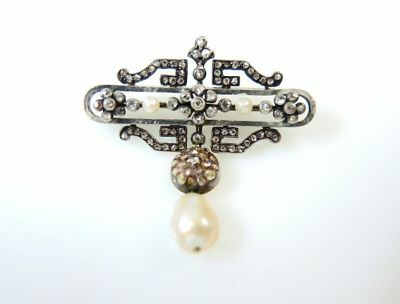 To see our hand picked Dwonton Abbey Art Deco Jewellery Collection click here. 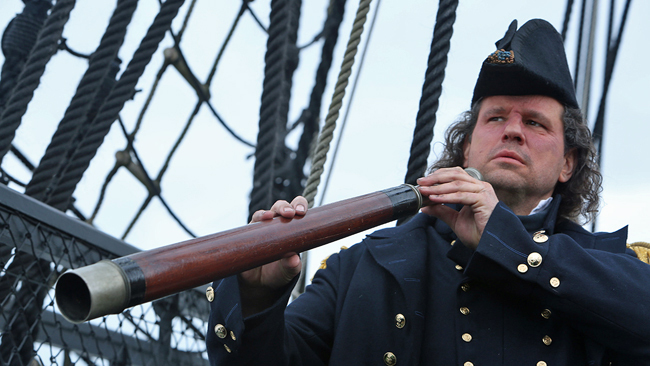 We've Been Eagerly Awaiting The Start of Season Five Tonight! 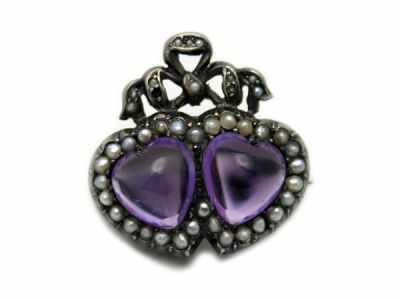 To See Our Hand Picked Downton Abbey Style Jewellery Collection Click Here. 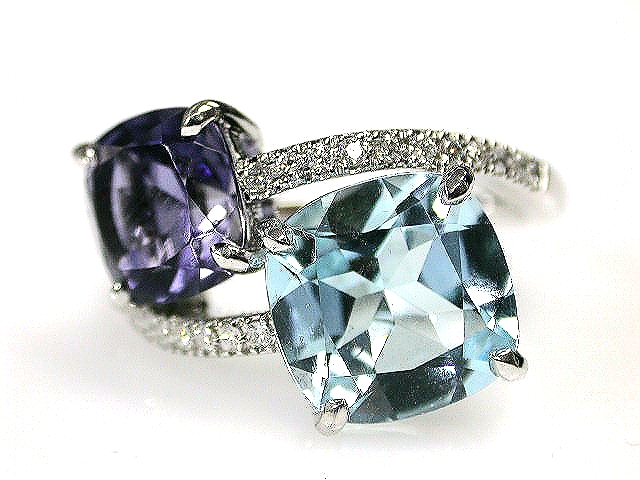 Ring In The New Year With a Special Antique, Vintage or Modern Ring! Please Click On Any Ring For More Infomation & Happy New Year!! 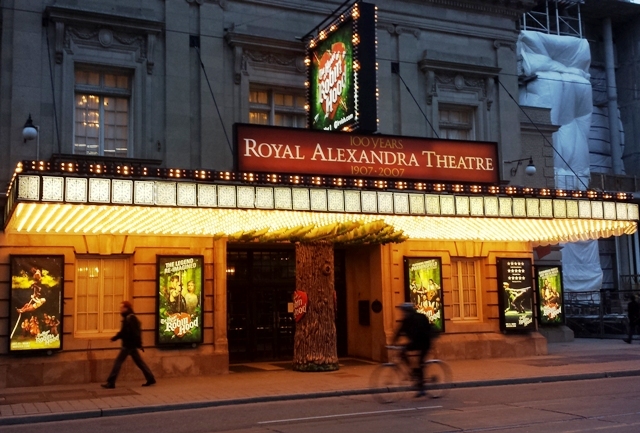 Two Great Ideas This Winter That Are Right Next Door To Us at The Royal Alexandra & The Princess of Wales Theatres in Toronto's Entertainment District. The Heart of Robin Hood - Starts Tonight and runs through March 1st 2015. Staring Elvis Stojko, Shae-Lynn Bourne, Violetta Afanasieva & Pete Dack in a holiday show that promises spectacular entertainment for the whole family. Lots and Lots of Lockets! 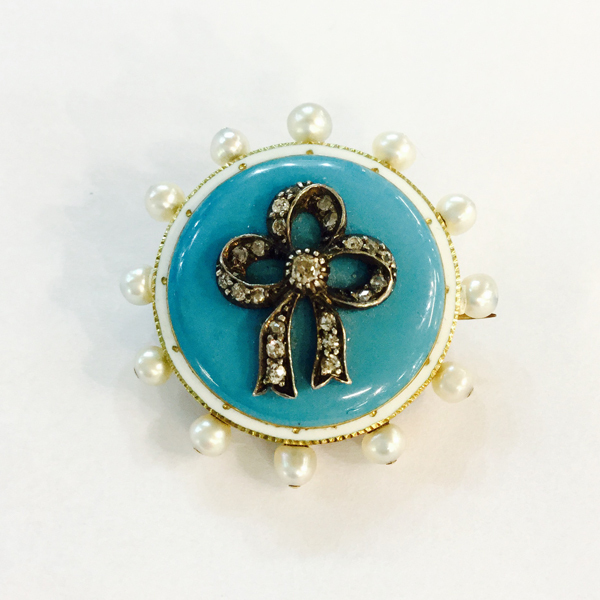 Mother of Pearl, Silver Plate, Etched Glass, and Turquoise and Gold from Cynthia Findlay Antiques. 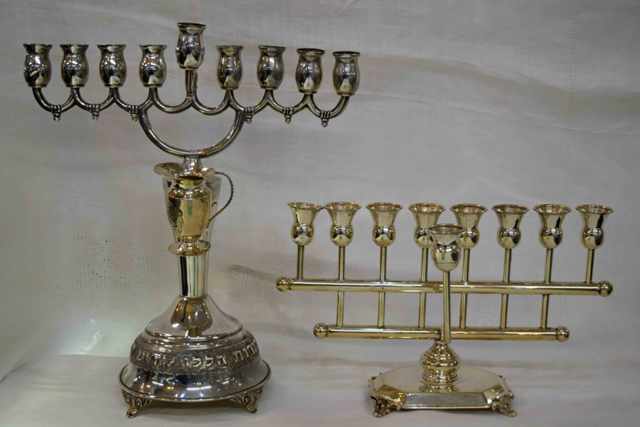 Silver Candlesticks & Menorahs This Year! 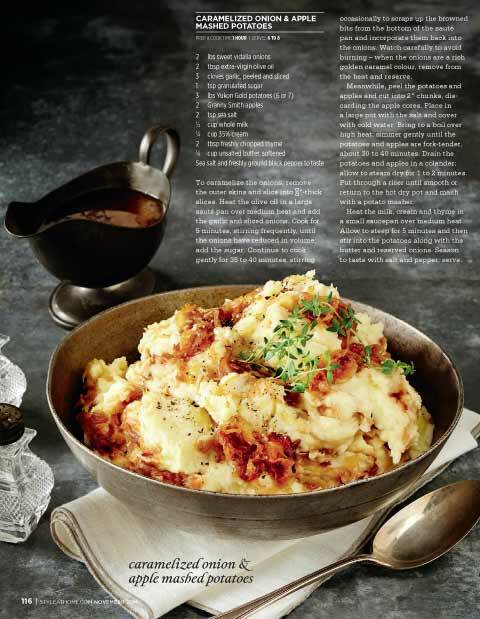 featured in the LCBO “Let’s Get Together” holiday food and drinks guide. 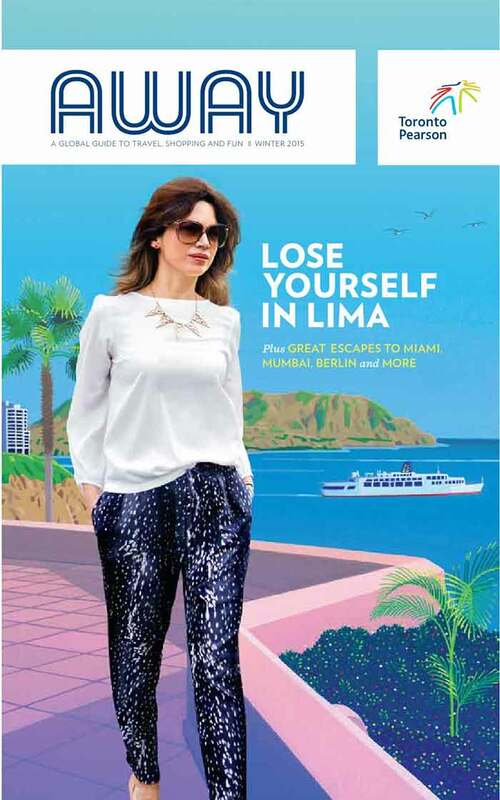 Fairmont Magazine- World travellers find our shop! 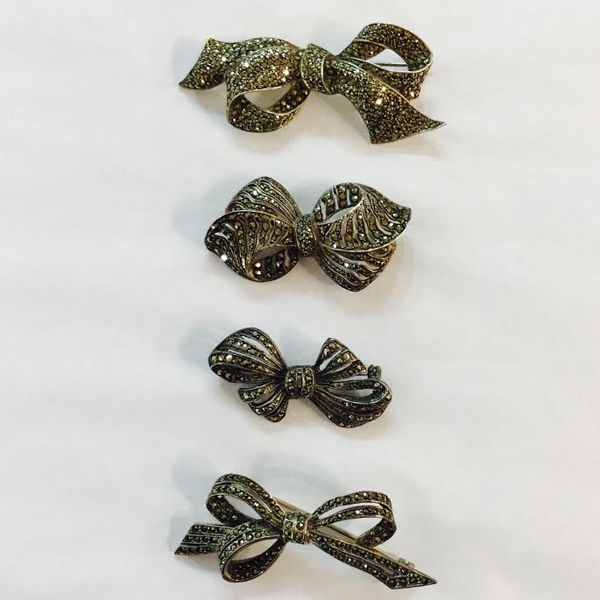 Chatelaine’s Marta Sadowski finds just the right antique and vintage “Glitter” at Cynthia Findlay Antiques. 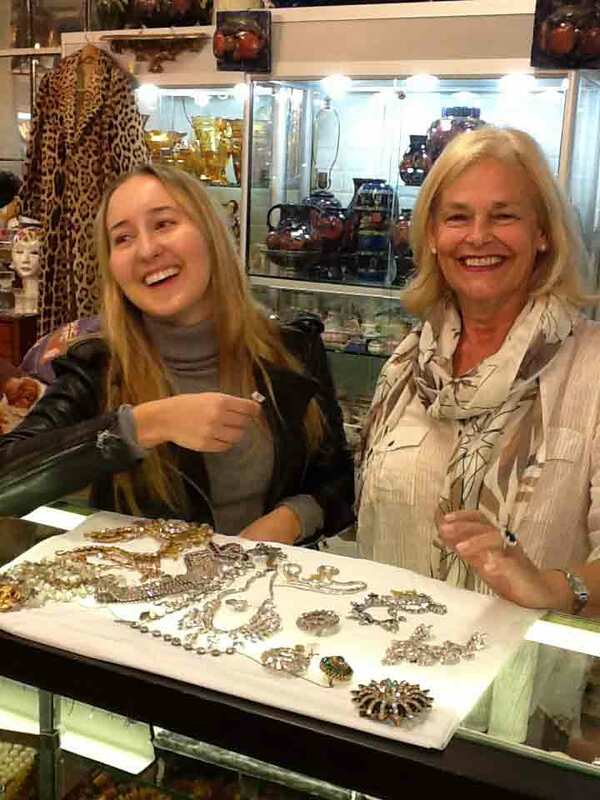 Marta (left) chooses a selection of diamanté jewellery forChatelaine’s “All That Glitters” Fashion Feature. 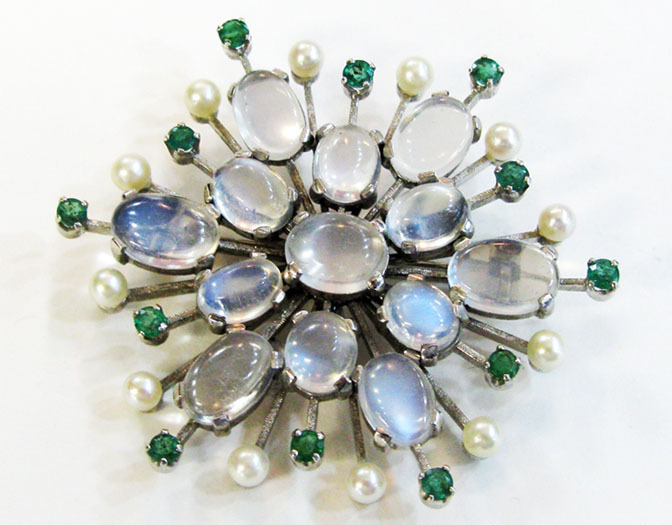 A traditional circle brooch circa 1950 in the Jackie Kennedy manner is perfect. 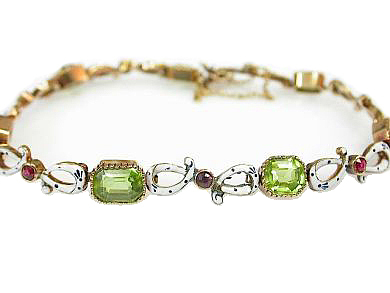 Imagine this vintage rhinestone collar necklace on Audrey Hepburn . 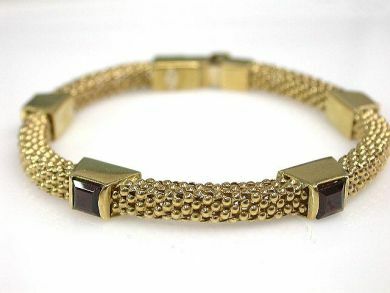 This Weiss 1950s emerald cut rhinestone wide cuff is the perfect Angelina Jolie statement piece. ViewChatelaine’s behind the scenes video. 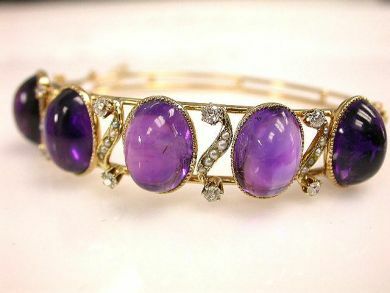 Come in and see our fine collection of antique and vintage jewellery including Sherman, Kramer, Weiss, and Coro. 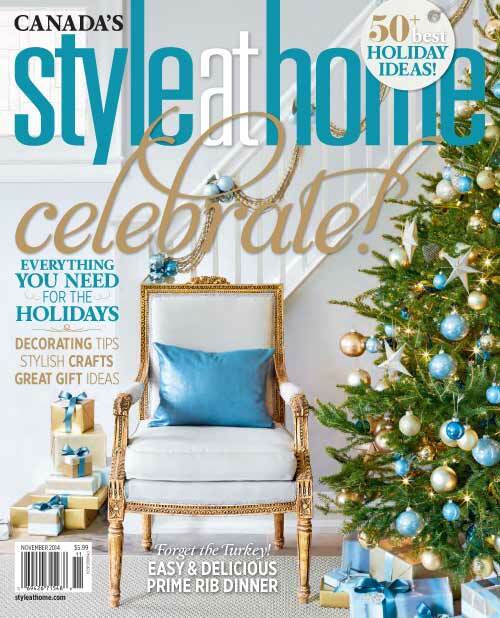 Wedgwood Green Decorates the Cover ofHouse & Home Special Edition: The Ultimate Guide to Holiday December 2014. 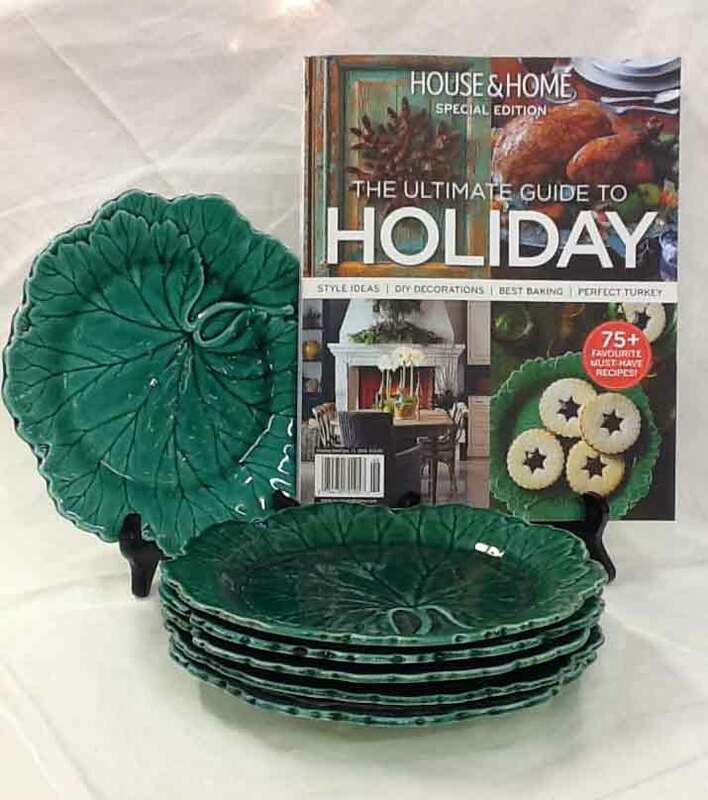 We found our Wedgwood Green Glazed Leaf Plates on the cover. style at home’s guest stylist Montana Labelle visits Cynthia Findlay Antiques to set the table for holiday entertaining. 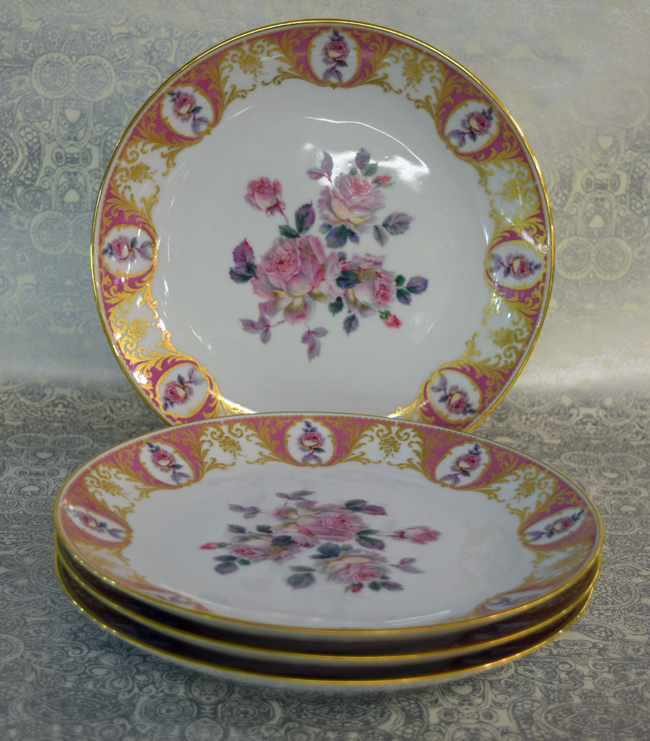 Select Antique or Vintage at Cynthia Findlay Antiques. pressed glass, and flatware at Cynthia Findlay Antiques. Click the image above for product and pricing info. a Black Satin Glass Vase, and WroughtIron Candlesticks to develop their “matte black” Halloween scene. 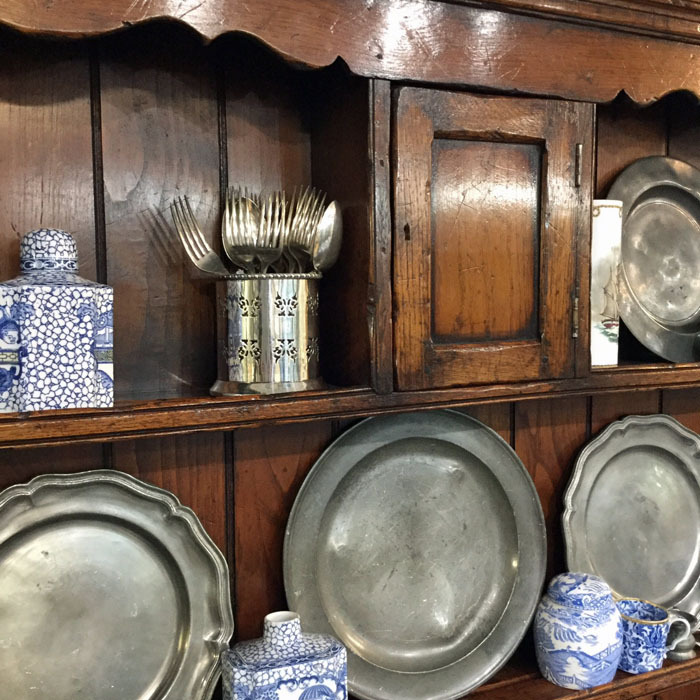 House & Home’s Reiko Caron visits Cynthia Findlay Antiques to select vintage pieces. Reiko’s DIY “Constellation Mural” inspires her to design an elegant front entry way using vintage props. Click here for product and pricing info. the vintage Brass and Leather Telescope $695.00 to create that cultured, worldly look. wardrobe. Not sure how to wear it? 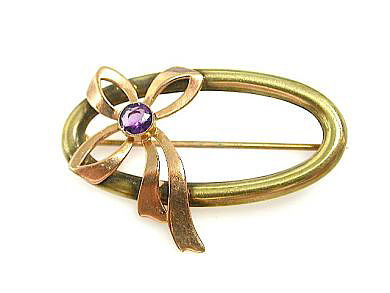 Here are three ways to wear and flaunt vintage or estate jewellery. your outfit without overpowering the rest of your look. 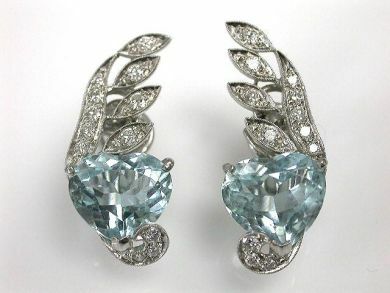 various time periods, such as a few Art Deco rings with contemporary earrings. Montana Labelle is a great friend of Cynthia Findlay Antiques. 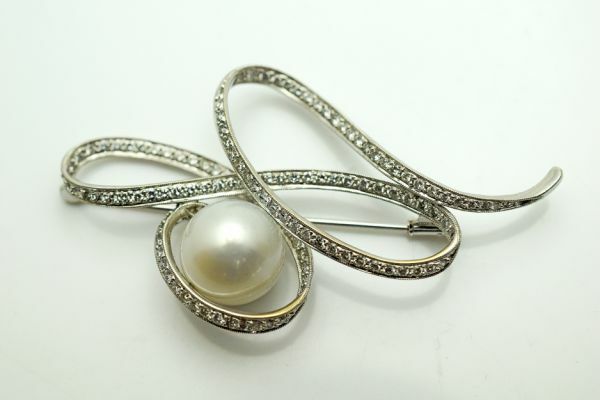 If we learned anything from the Oscars this year it is that brooches are back. large diamond bar pin. 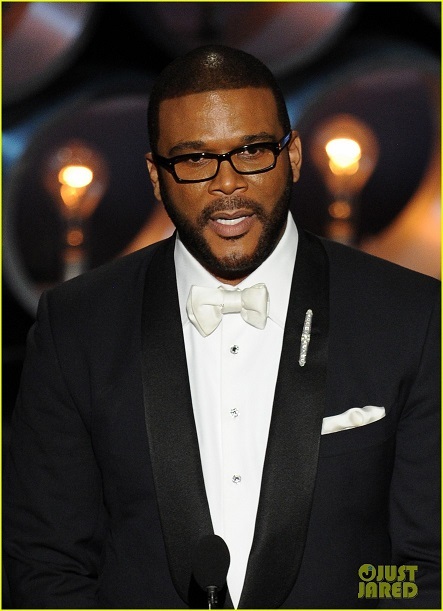 Don't get us wrong, this is not Tyler Perry dressing as Madea. This is a dapperstatement worthy of a man's wardrobe. 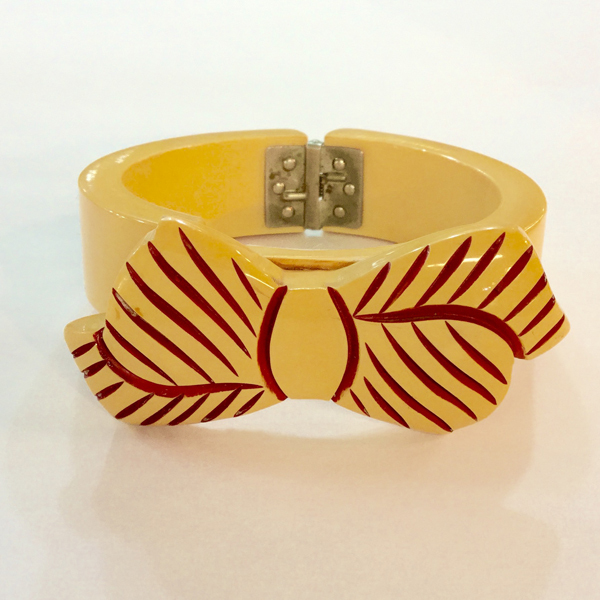 If we were dressing Perry, we would recommend this piece from our Cynthia Findlay Collection. 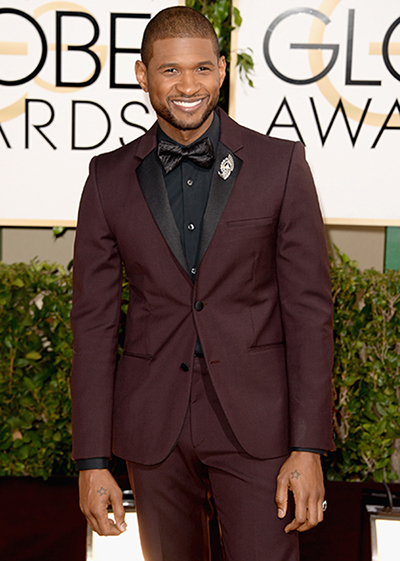 Usher also dazzled with a retro-style diamond brooch. 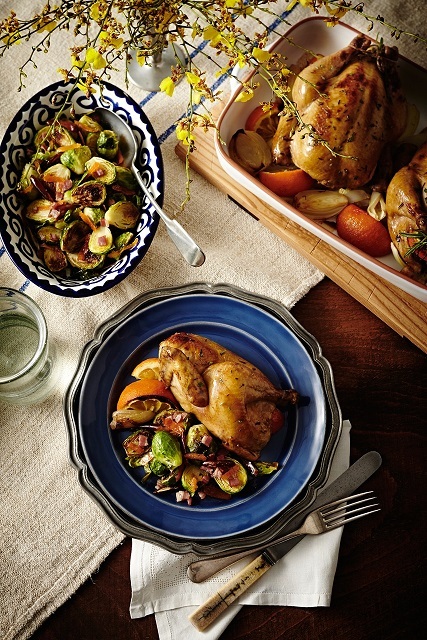 What could make an intimate dinner of roasted cornish hen any better? 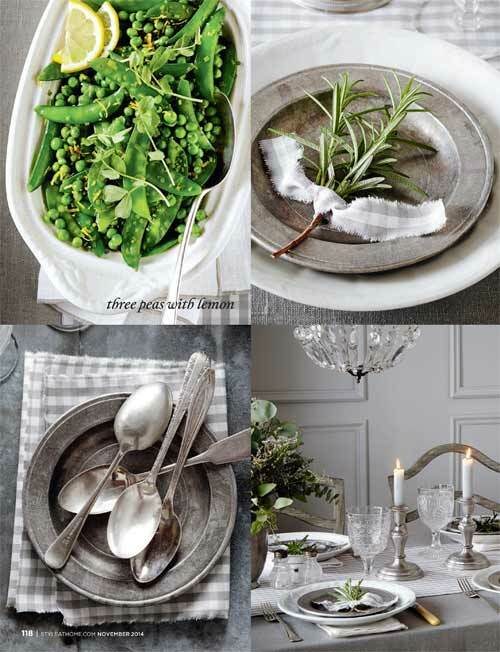 How about ironstone bowls, pewter plates and antique linen napkins? Credits: Photographer, Angus Ferguson www.angusfergusson.com. 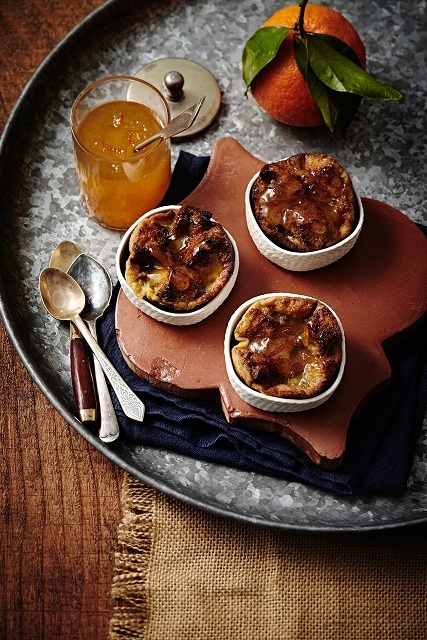 Food Stylist, Victoria Walsh www.victoriawalsh.ca. Source, "Seville Defence," February 15, 2014. Enamel collander, $125. 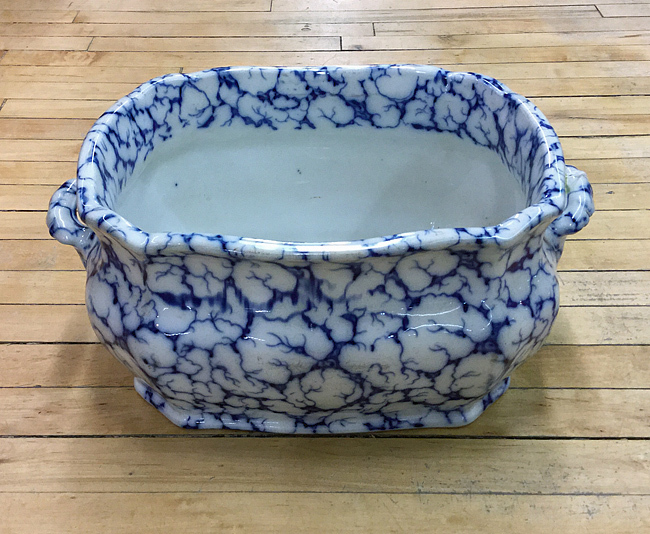 Ironstone Bowl, $45. 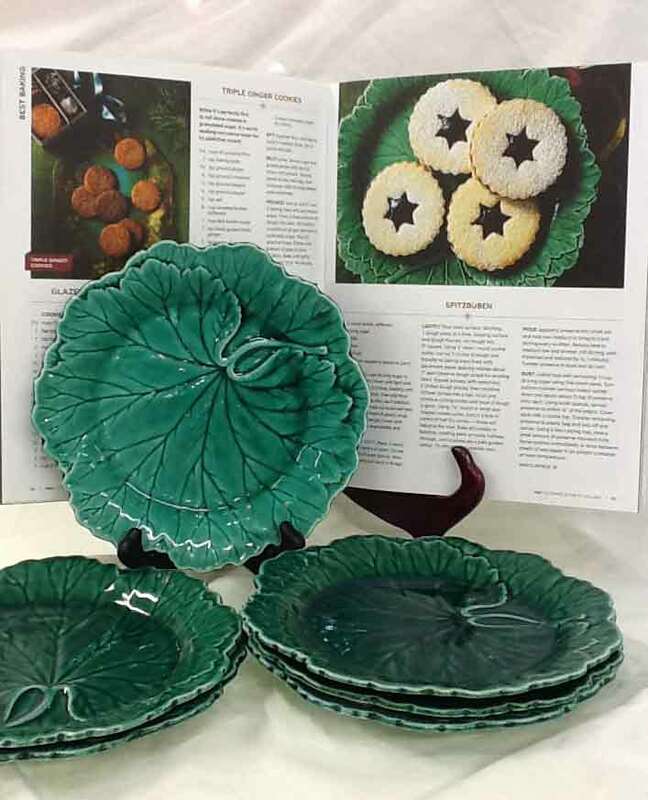 Ironstone salad plates, $15-$20. Grain sack, $125. Hand-painted serving bowl, $65. Serving Spoon, $10. 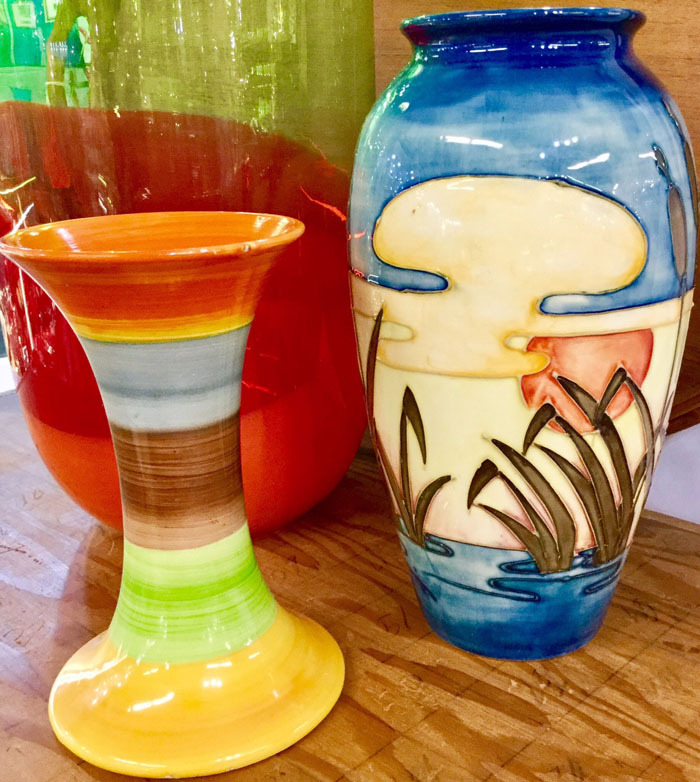 Liberty bud vase, $895 for the pair. 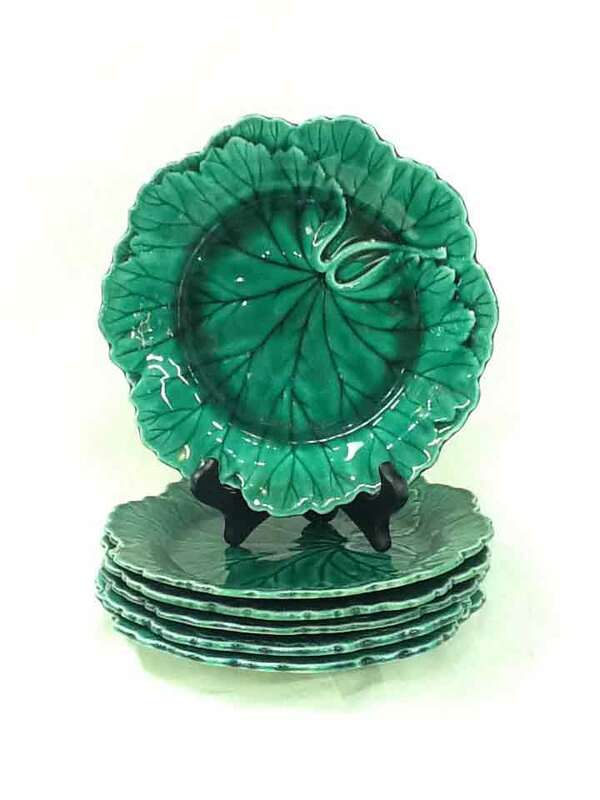 Set of six of pewter plates, $395. Bone-handled knife, $35. Linen dinner napkin, $35. We loved having John Landis and Stephen Furst in our store last week. with precision and in a room environment. Platinum engagement rings exploded with popularity in the Edwardian era because of this new invention. happily meansthat many have stood the test of time well. Clickhere to see some beautiful examples. 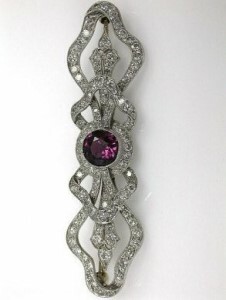 Since it’s inception in 1925, art deco jewellery has always been in fashion. 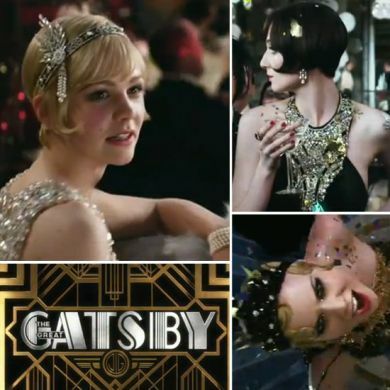 part to Baz Luhrmann's film adaptation of The Great Gatsby (2013). age, art deco jewellery clearly features human’s newfound love affair with machines. genuinely period art deco pieces and modern deco-inspired jewellery. few of our favourite pieces of emerald green jewellery. 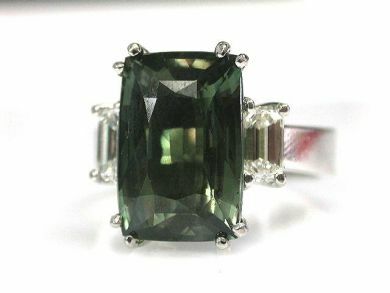 This is an Art Deco platinum and diamond ring set with an emerald cut emerald. change colour and in the right light this stone will become vibrant green, just like a chameleon. 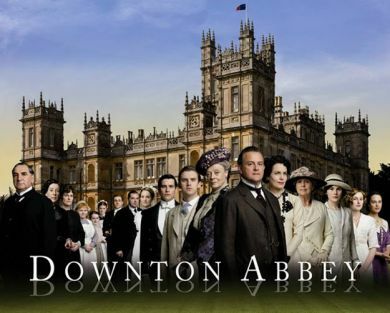 We can't wait for the next season of Downton Abbey to start. our favourite Downton Abbey-esque jewellery. Have alook! First impressions from the latest Anna Karenina adaptation, is of beauty. Keira Knightley is stunningly well dressed in every scene. both these pieces, don’t you agree? the left hand. They believed that this finger contains a vein that runs directly to the heart. and long-lasting traditions in our known history. First comes love, then comes.... a thimble?! In the mid-19th century, a large group of American colonizers (self-identified as “plain people”) regarded betrothal rings as excessive displays of frivolity. Instead, a prospective groom would present his bride with a thimble, which she would use to sew items for her hope chest. Once the marriage was complete, and the dowry sewn, the woman would cut off the top of the thimble and wear the bottom as a wedding ring. David Mirvish’s plan to transform the King and John area into an international architectural destination. location while we’re still here.